Talk about full circle. 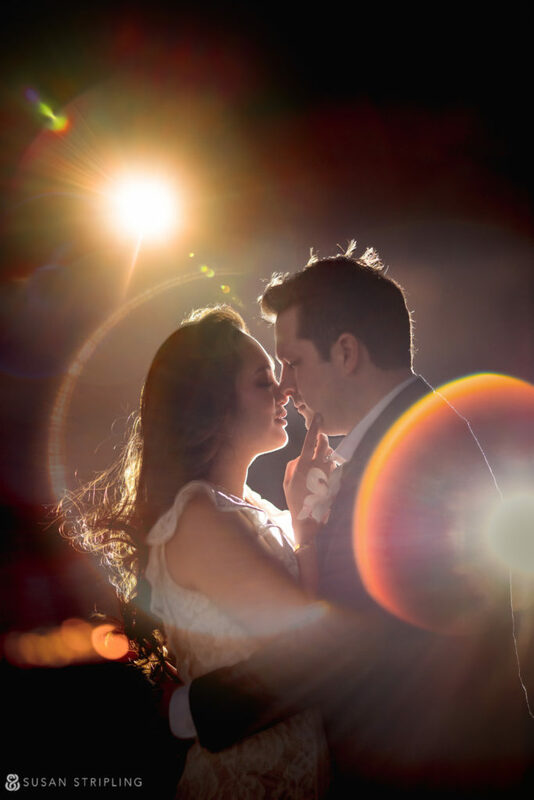 I met Christine and Jared for the first time way before their 2009 Miami wedding – we were all living in Tallahassee, Florida, and I’d been commissioned to photograph their engagement session. I still remember walking around downtown Tallahassee (remember Gallie Alley, you two?) as vividly as I remember traveling to Miami for their wedding. Since 2009, I’ve photographed many other things for this remarkable couple as they have since added three hilarious, wonderful children to their family. Christine and Jared are, simply put, tremendous people. Individually they are hilarious, warm, welcoming, razor-sharp smart, charming, gorgeous, and kind. Together? They’re a supernova of sunshine. 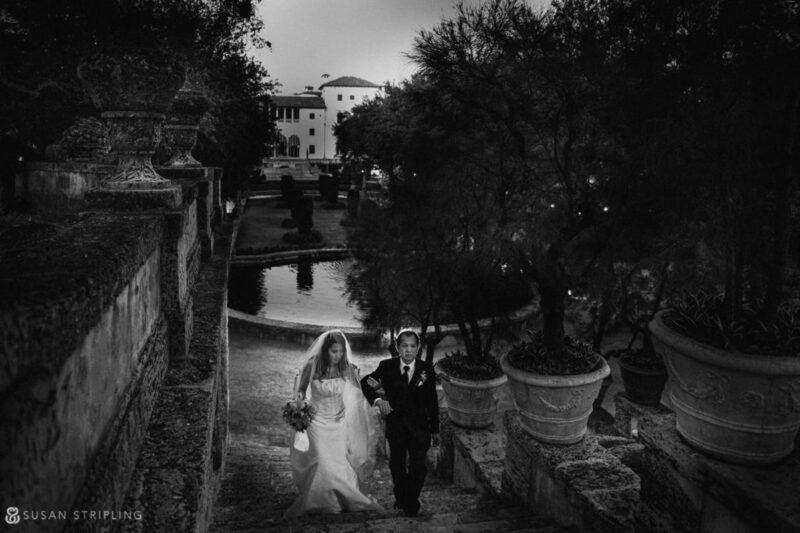 It was a ferociously huge honor to travel back to Vizcaya for their vow renewal on their tenth anniversary to create some more images, this time with their children. See you back in Miami in 2029? I’m there if you’re there. 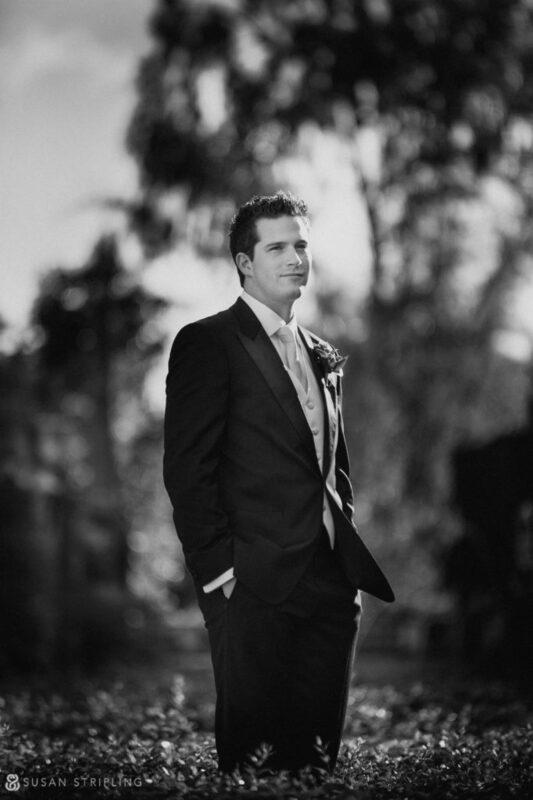 And a few favorites from their wedding in 2009 : time flies, am I right? 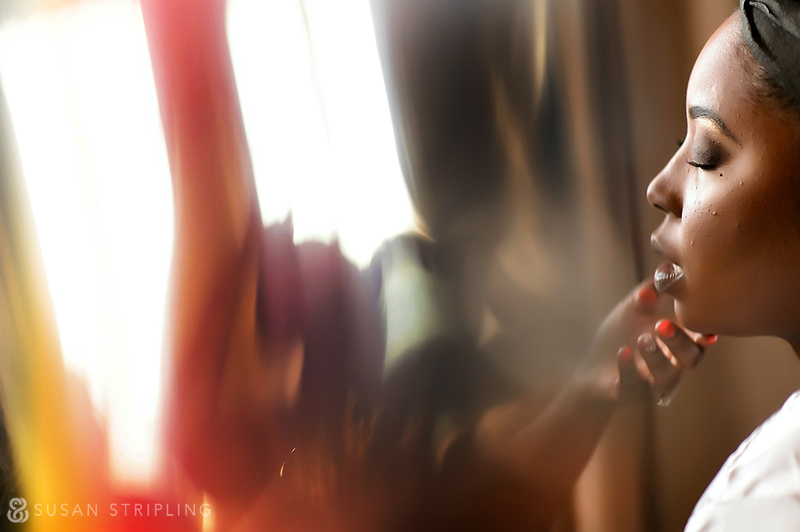 110% I was drawn to your work because of what you can do with light; its literally magic. 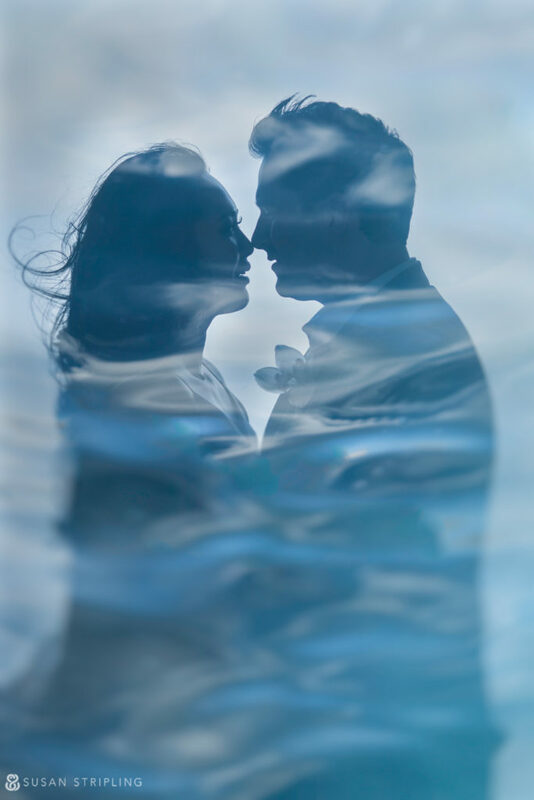 Also, I KNOW you were at our engagement photos because I have looked (okay gawked) at the images 100 times, but it seems like you were only there with us for a sliver of a moment! I don’t know how, but you were able to document that morning while still allowing Jesse and I to be entirely in our own world. 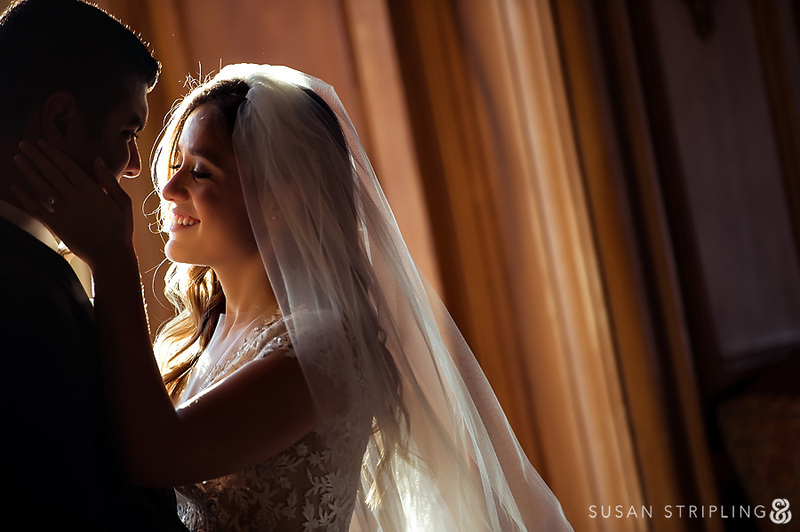 The way you were able to capture something so intimate without crowding and staging us was, again, genuinely magic. I am so at ease about the wedding day photos. Kendall and Jesse got ready separately, but close by. 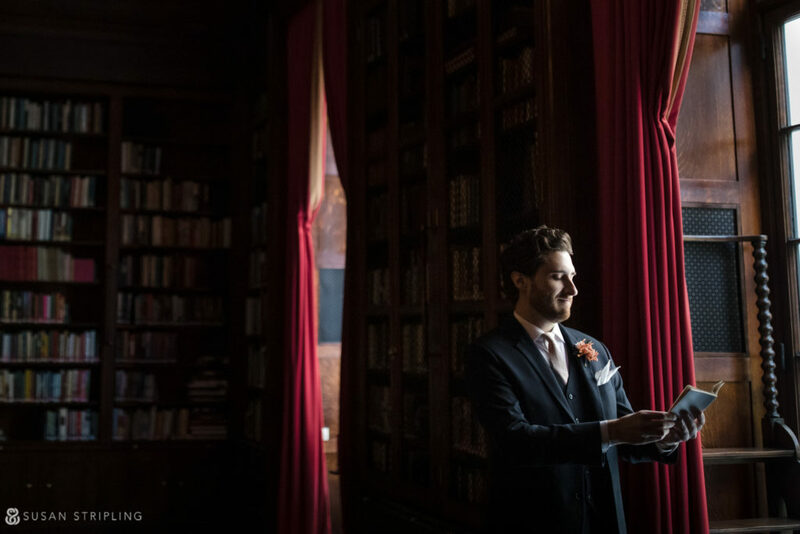 Once they were ready, they chose to see each other in the magnificent library of the club they were married at. 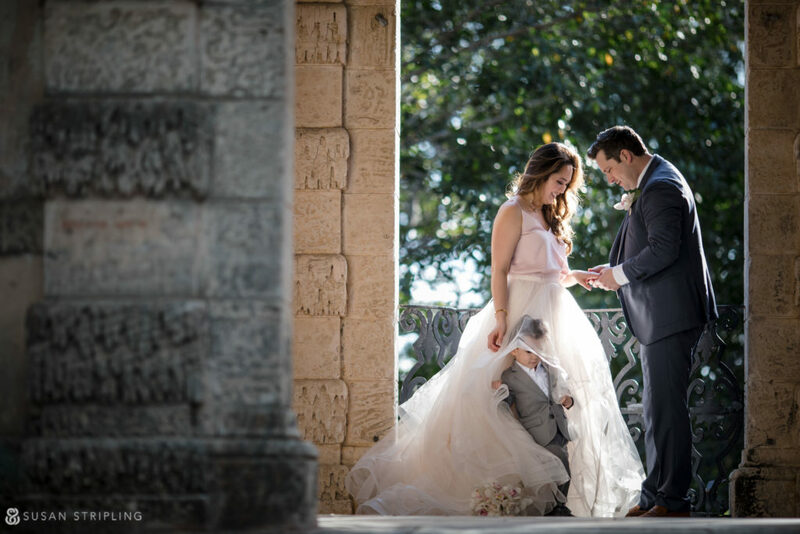 It was a quiet moment, and so sweet to see them get a little time together before the hustle and bustle of family photographs began! How do you even begin to describe someone like Kendall? She’s gorgeous – that’s obvious just by looking at her. She’s also gorgeous inside. When she looks at you, it’s with the blazing joy of the sun. Everything about her just RADIATES. She’s a huge hug in human form, and she and Jesse are magnetic together. 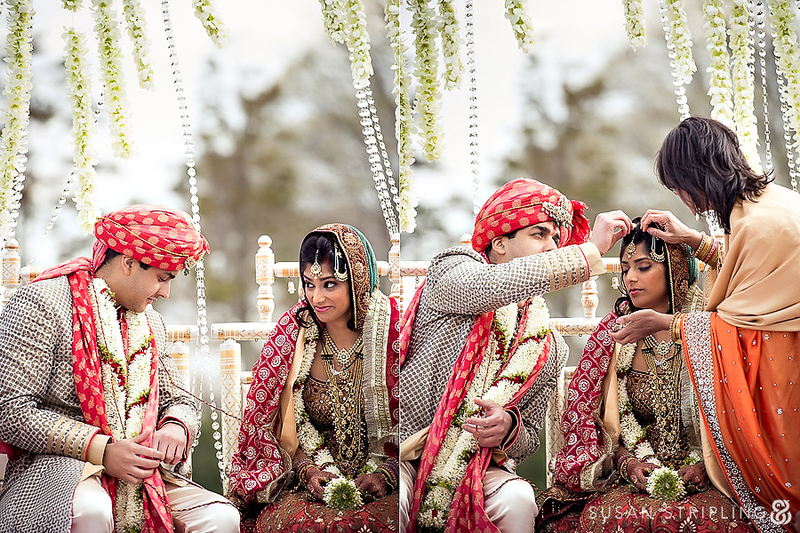 What to say about this sunny sweet ceremony? 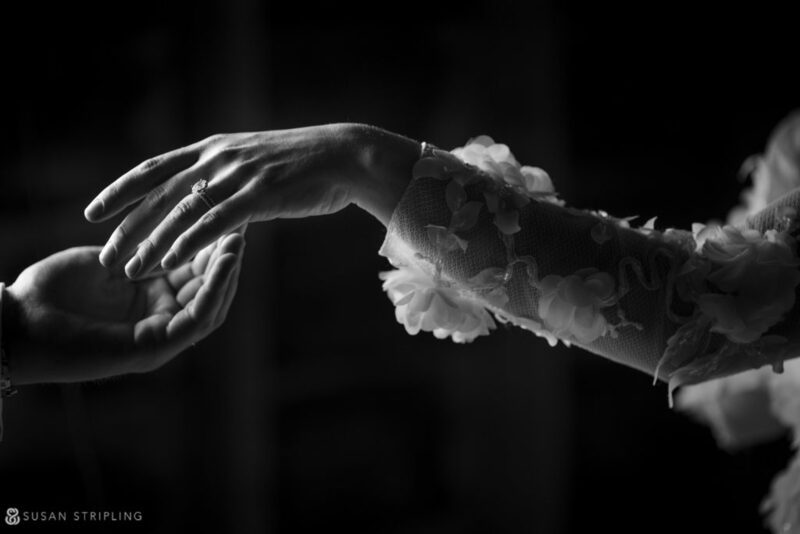 I could go on for days about the light, the space itself, the crystal-clear sweetness of their vows, the charming openness of their tears, but what is that they say? A picture says a thousand words? If it does, these pictures scream JOY from the top of the tallest Manhattan building, straight into the sky. After the ceremony, there were a few more family portraits, and then it was off to their brunch. 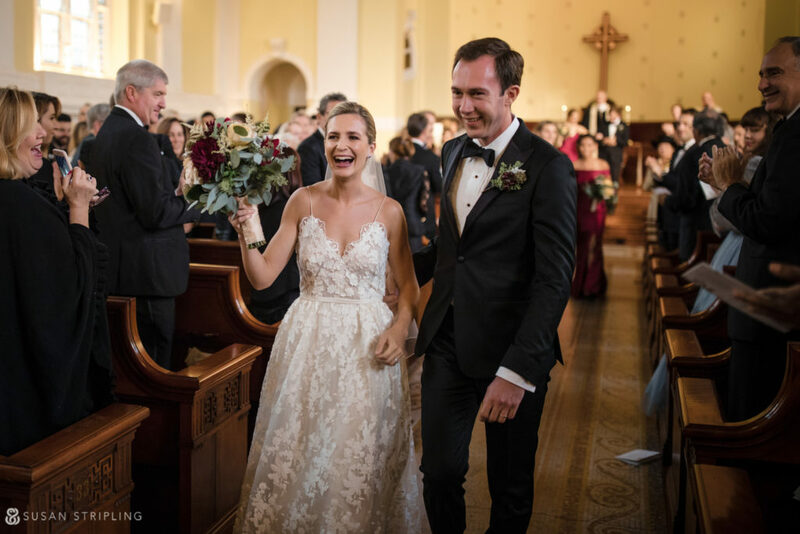 I LOVE the way that Kendall and Jesse celebrated their day : wholly them. 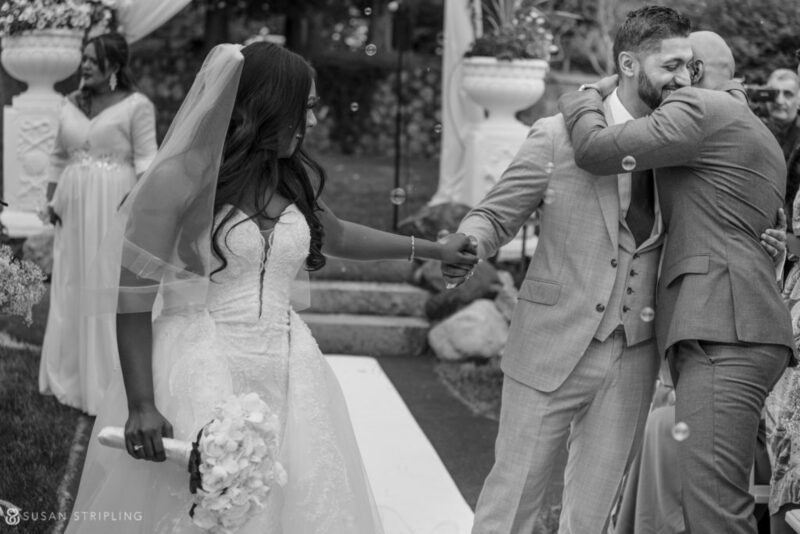 The ceremony was in the morning, and the “reception” was an intimate brunch that was over by midafternoon. After brunch, it was time for pictures of the two of them together – I know, what a fun timeline, right? 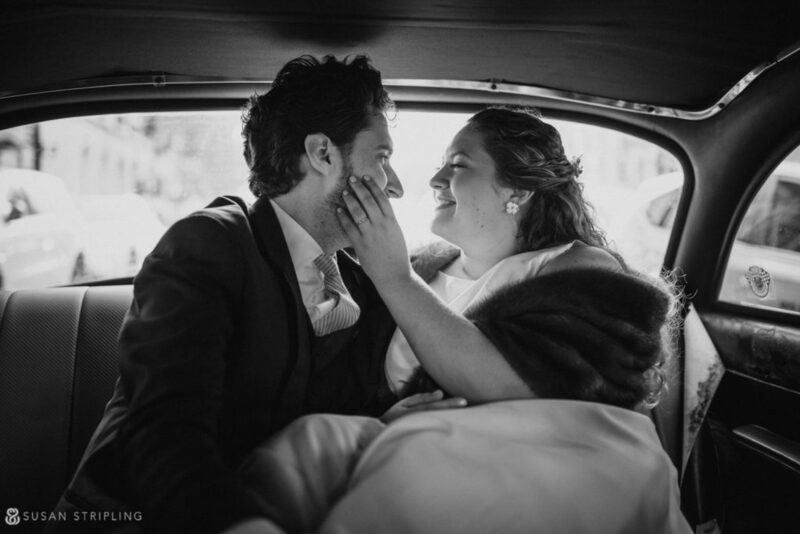 The ceremony and reception behind them, we hopped into a vintage cab and headed over to Central Park to chase the sunset together. I LOVED seeing how this timeline unfolded. They had an incredible day, followed by time alone together. Moving the portraits to after the entire reception freed up much of the earlier part of the day, while still allowing lots of time in the park later! Frozen fingers, frozen toes, and one of my favorite spots in the entire city. The first place I ever took portraits in New York was at Bethesda Terrace, and every time I go back my heart expands just a little bit more. After this last image, the sun fully set over the park and we realized that I was the only one with a phone and the ability to call an Uber. Kendall and Jesse and I carpooled back over to their hotel, where they informed me they were taking a very long nap and then having a bunch of their friends over for a nighttime party in their suite. The perfect end to a perfect day? I think so. Kendall and Jesse, y’all have my heart. What? 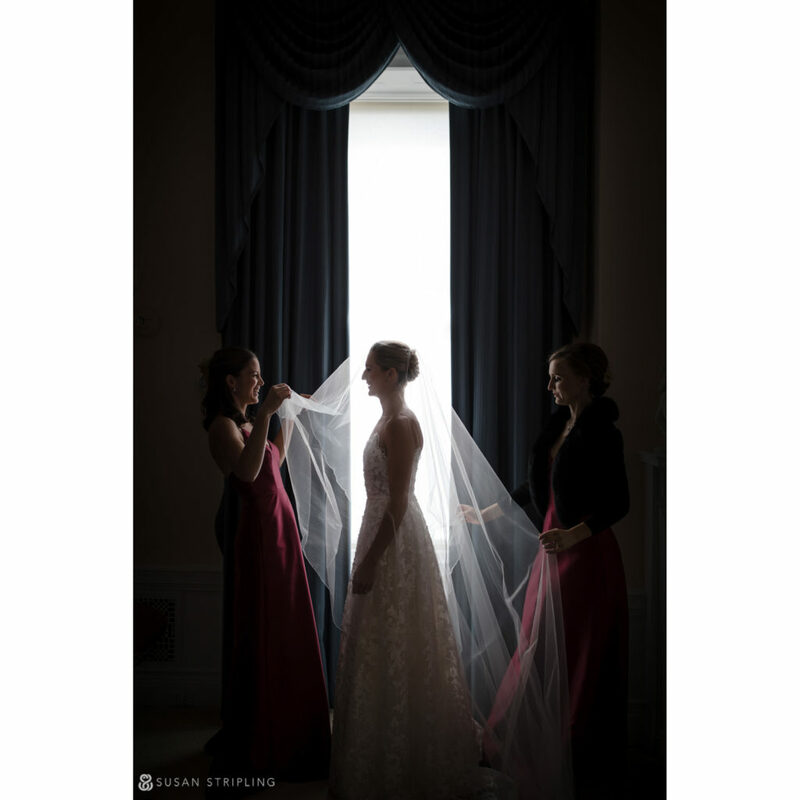 : Preparations, first look, portraits, cocktail hour, and reception at a turn of the century manor house in Sleepy Hollow, New York. Ceremony at a nearby church. I first met Jack and Casey via an email from Jack’s mother that read : “We heard about your and your marvelous photography from our friends.” It’s always excellent to begin that way, when a past client hands my name over, knowing that I’m going to take care of their loved ones and that we’ll be a great fit together. And we were, right from the start. Jack and Casey are from amazing families, with warm, incredible mothers, fantastic fathers, and a sprawl of siblings, cousins, and friends that surround them with so much love that you can’t remember where friend stops and family begins. 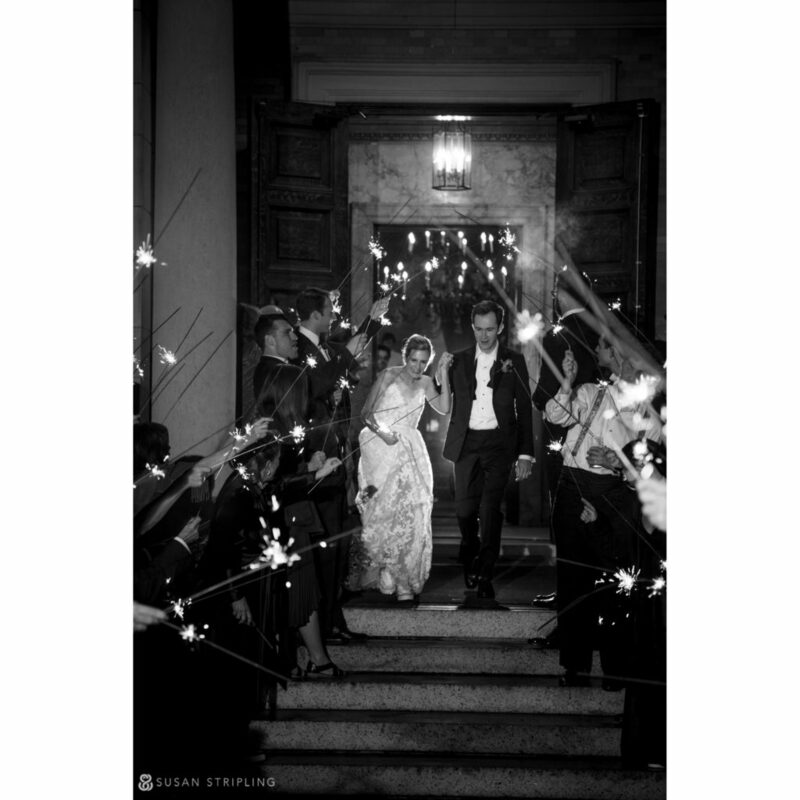 Their wedding was on a fall day so clear and bright, and so full of light that it was only inevitable that it slide towards the most flawless of orange sunsets and end in a blaze of sparklers on the steps of the club. Jack and Casey, thank you for being bright, amazing human beings and bringing me into your day. Documenting it for you was as much of a treat as the gorgeous cool weather! Not to be outdone, Jack had his one room one floor up to get ready in. Unsurprisingly, he also had some pretty perfect sunshine. It’s October. I’ve been on a horror movie kick, and nothing has been creeping me out (and amazing me) quite like the new Haunting of Hill House on Netflix. When I saw the praying statue, I knew I had a great element to add to the already-awesome shot of Casey getting her lips touched up. Someone to watch over us indeed, am I right? Casey’s hair was PERFECT. Smooth and sleek, but with boho braids to lighten the look. Light, light, light. You know I love it. It was everywhere, around every corner, in front of every perfectly placed window. 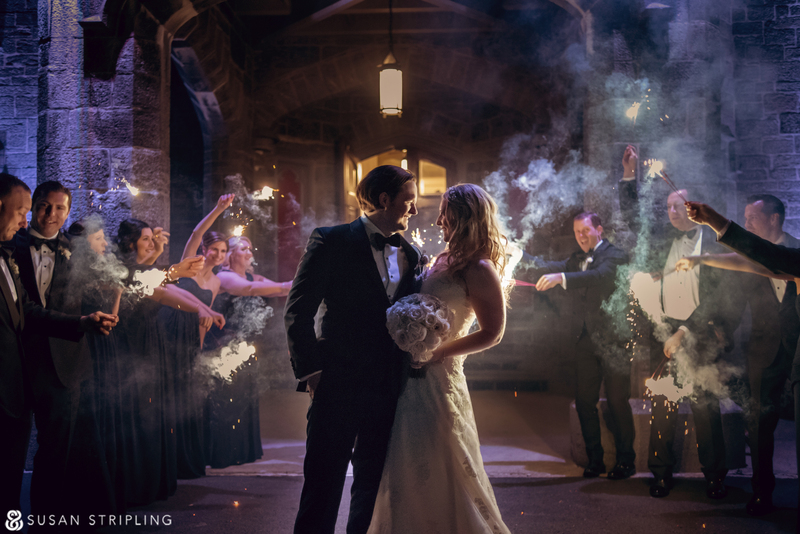 Seeing moments come to life in that setting was nothing short of completely magical. “Some people like to do their first look on the stairs,” someone at the venue told me. I am pretty sure they suggested a few other spots, but it was all white noise once my eyes locked on this staircase. 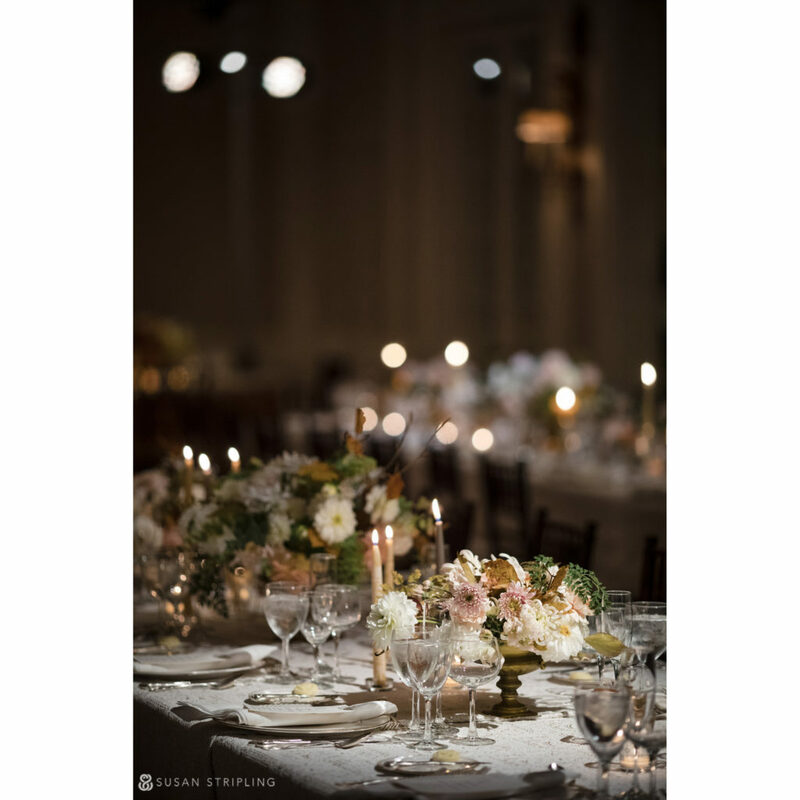 Drenched in directional light, warm and welcoming, where better to lay eyes on your loved one for the first time on your wedding day? Hi, drama. 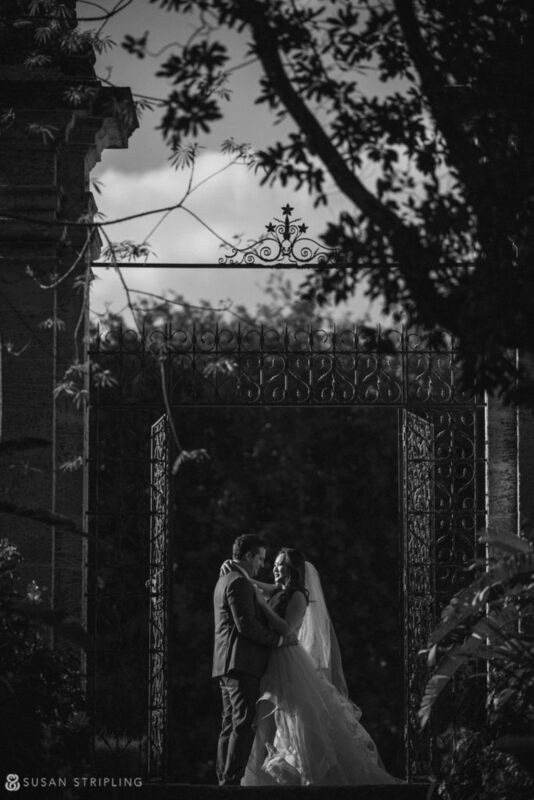 Then it was time for a quick stroll around the grounds of the club for some images pre-ceremony. 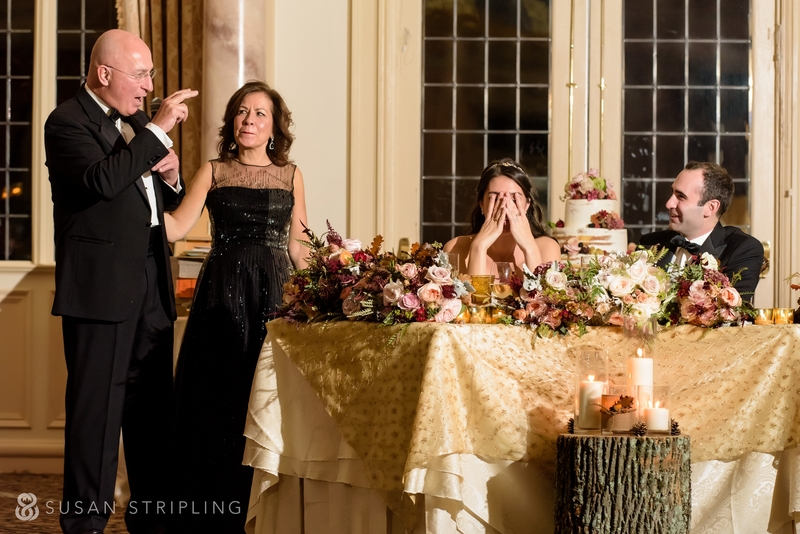 Sometimes weddings are crazy, sometimes they’re calm. No matter how the day is flowing (and this one flowed with extreme peace and ease! ), I always try to take time to do that little something EXTRA. 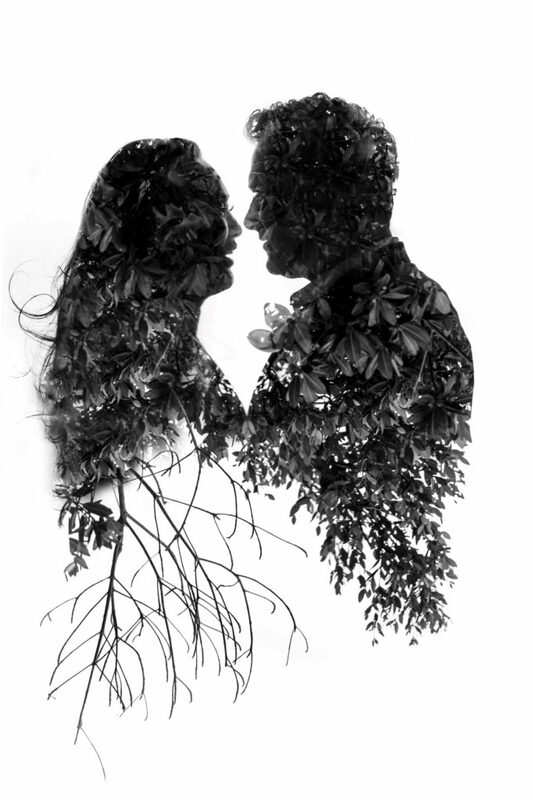 This day’s extra was brought to you by arching trees, a bright sky, and a little in-camera double exposure action. 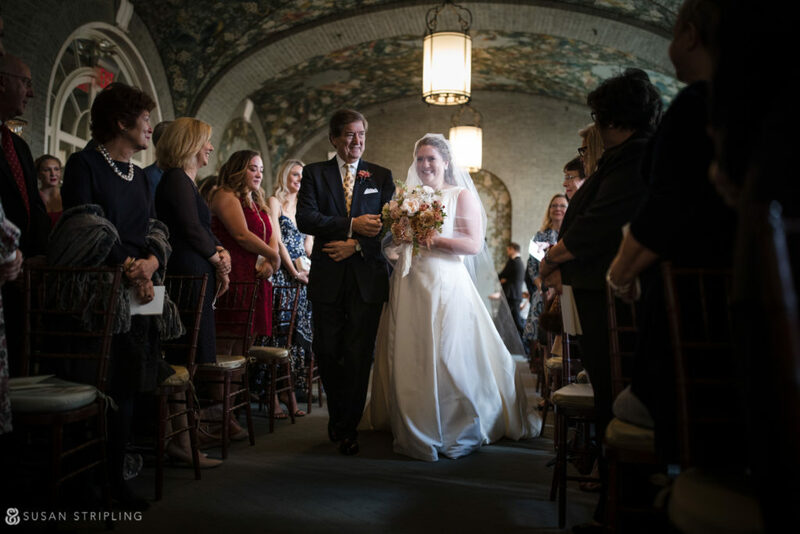 The most insanely cinematic beam of light burst through the stained glass windows the second the door opened on Casey and her father. After the ceremony Jack and Casey hopped in her mom’s red convertible, put the top down, and sped off towards the cocktail hour, Casey’s bouquet waving in the air. Cocktail hour sprawled across the lawn behind the club – I LOVE these two men chatting, oblivious to the fact that a overexcited photographer was insanely grinning from the back steps over the symmetry, the light, and the shadows behind them. A quick sunset shot? Don’t mind if I do. …and a few more portraits of Casey? Yes, please. Jack’s mother had requested an image of Casey on the stairs, and I was only too happy to oblige. The reception took place on the back lawn, under a tent. The sun set directly through the clear sides of the tent, bathing the tables in the warmest of light. 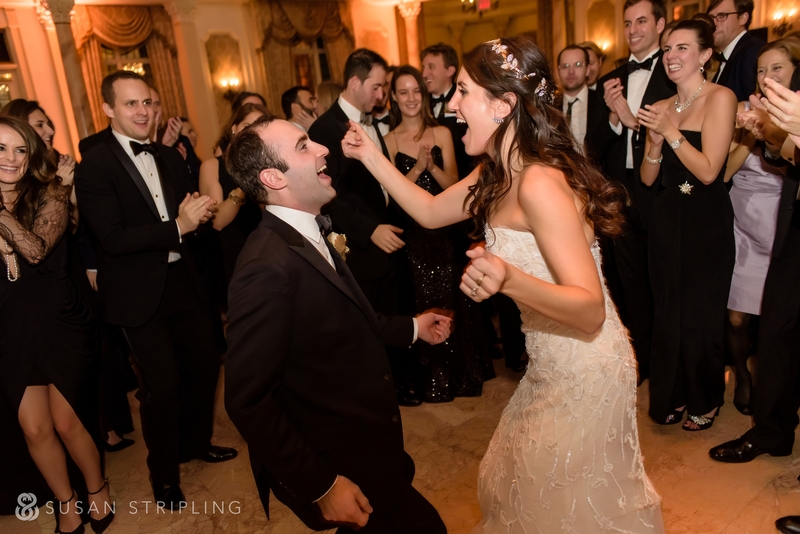 Jack and Casey had a choreographed first dance. They’re great dancers, this is true. But what really stays with me, even now, is how HAPPY they were, how lively, how cheerfully overjoyed. 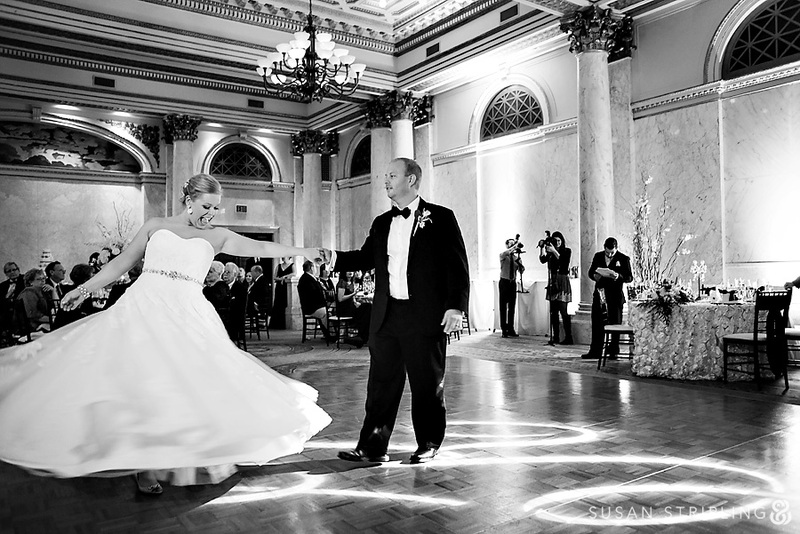 THAT makes a great first dance. 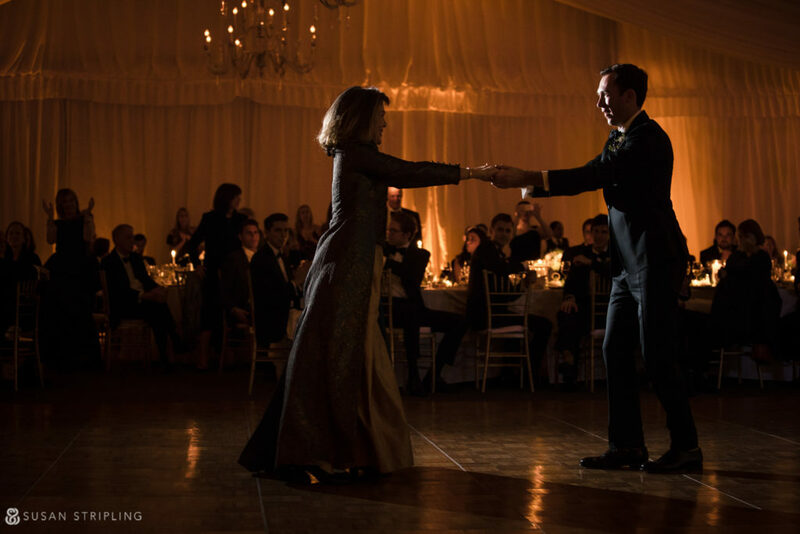 After a lively first dance, it was time for two pretttttty spectacular parent dances. 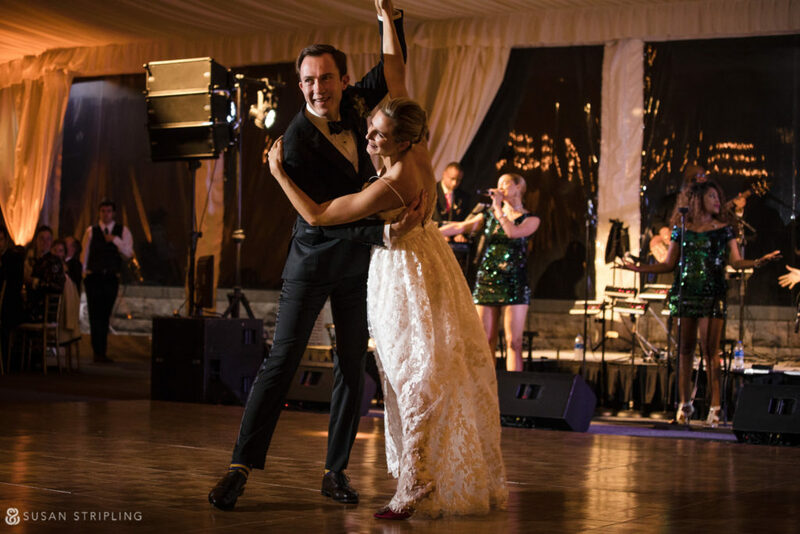 …and then it was time to party! When it was time to set up for the sparkler exit, we were dismayed to see that it had started drizzling. Who was going to want to go out in THAT for a sparkler exit? Turns out? EVERYONE. 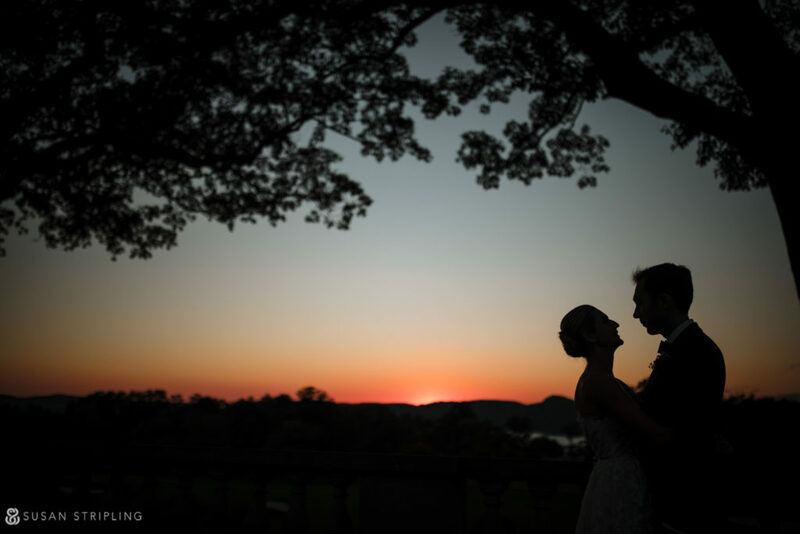 Good night and good bye, what a gorgeous ending to the first truly fall wedding of the year. Crisp light, crisp weather, incredible people, an amazing party – let’s do it again next year y’all, okay? One year anniversary party? Just name the place, I’ll be there. What? 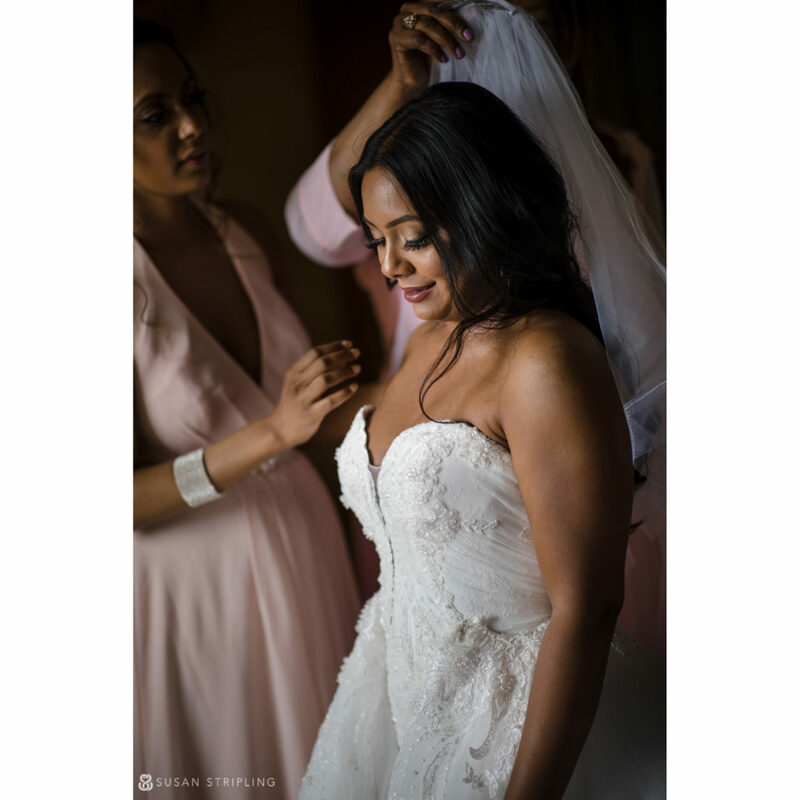 : Preparations and portraits at a private home, ceremony at the Most Holy Trinity Church, and the reception at a beautiful beachside venue in Bridgehampton. When the first email from a client includes the line “I’m literally obsessed with your work showcased on Instagram and would love to work with you!” … well, you know it’s going to be a good time! 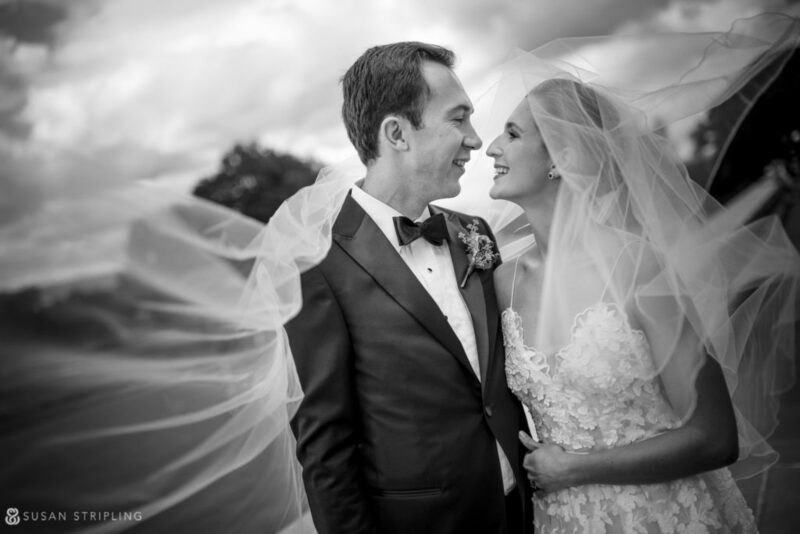 I am so grateful to the team at the Bridgehampton Tennis and Surf Club for referring this amazing couple to me. It was a great joy to spend the day with them, their gorgeous son, and incredible family and friends. 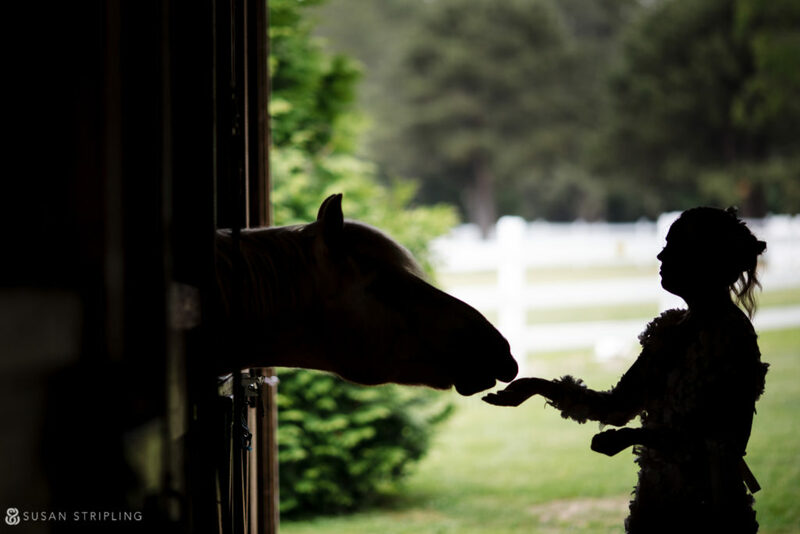 We started the day at their extraordinary rental home, moved to a charming Easthampton church for the ceremony, went back to the rental home (complete with horse barn!) for some portraits, and then headed to the beach for more portraits, a party, and an epic night. What? 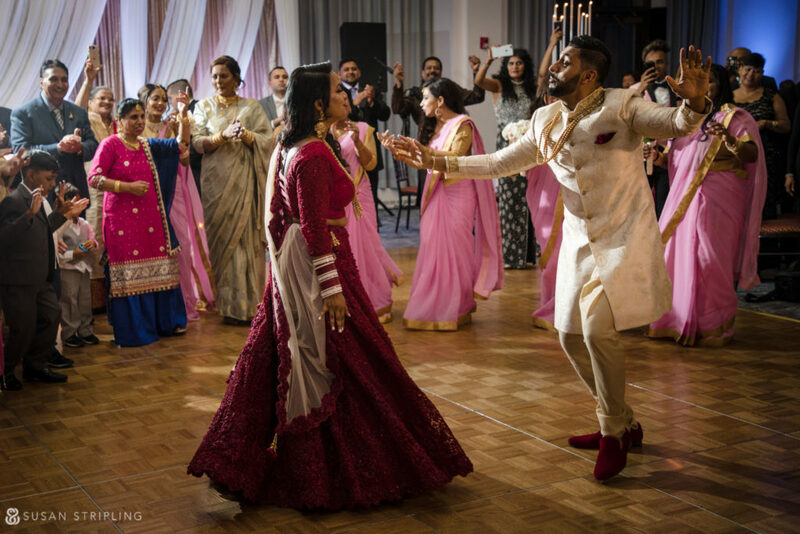 : Outdoor wedding ceremony, outdoor baraat, indoor cocktail hour and ballroom reception … complete with multiple outfit changes! 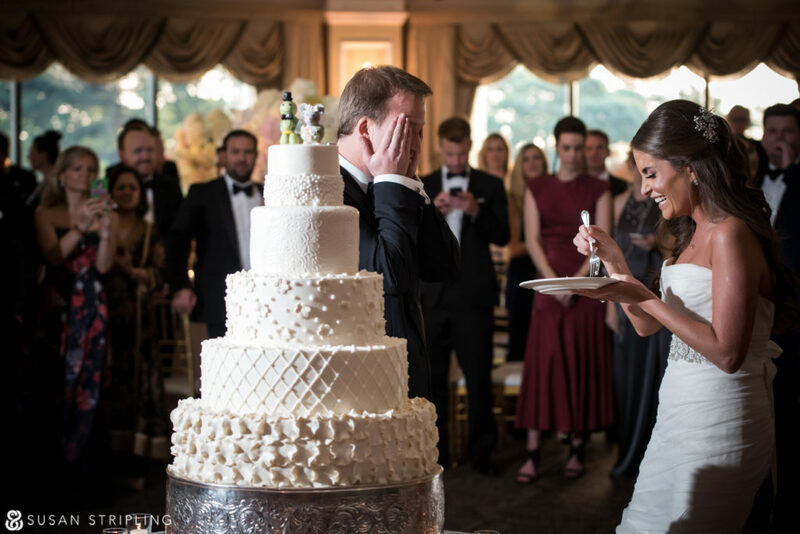 It takes a truly special couple to pull off a day this complicated without a planner! 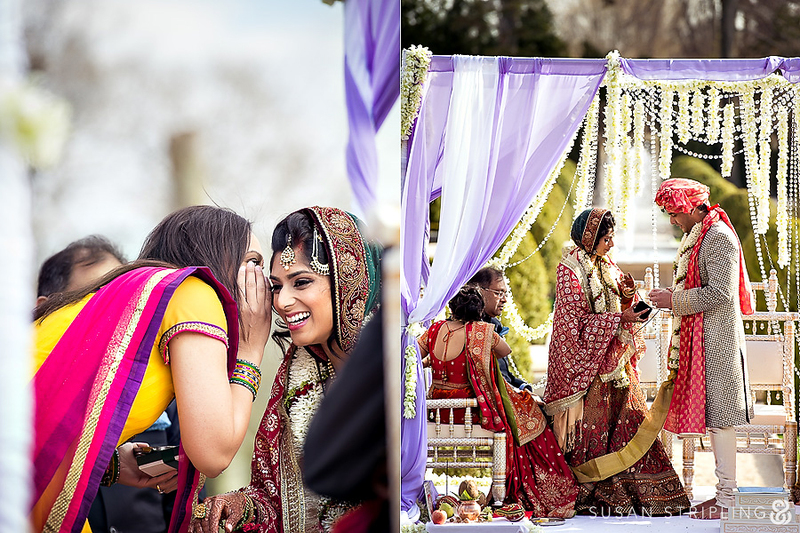 Mary and Sarabjeet filled the third of their three-day event with so many beautiful touches : the outdoor ceremony in her gorgeous white wedding dress, some outdoor portraits, a sweet midday lunch where they got to hang out with their nearest and dearest, a few outfit changes, a gorgeous baraat led by a white horse, and a wild reception that went well into the early hours of the morning! 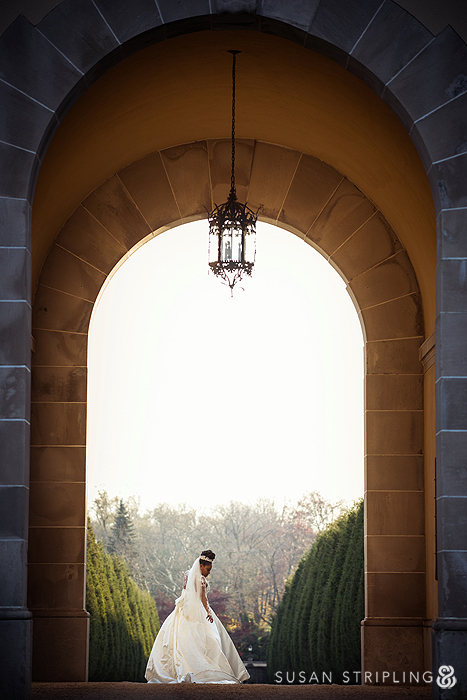 I have talked long and often about my deep love for Oheka Castle. 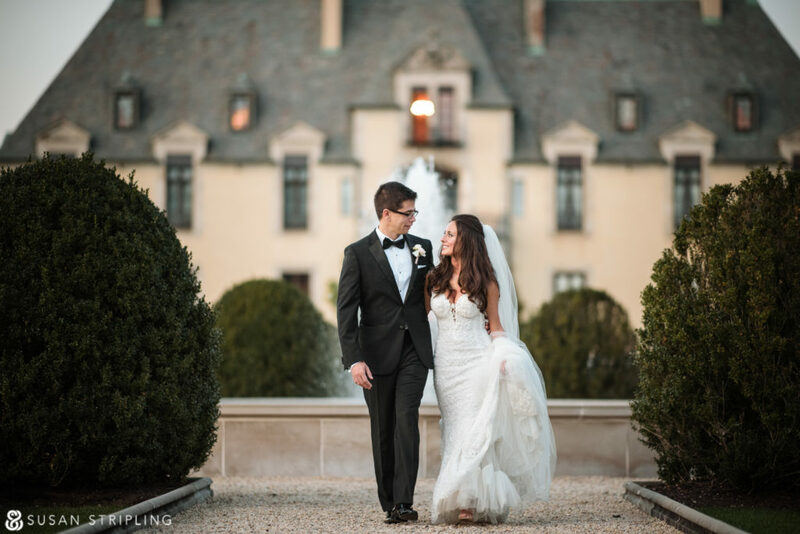 An outdoor wedding at Oheka Castle is something really spectacular to behold. 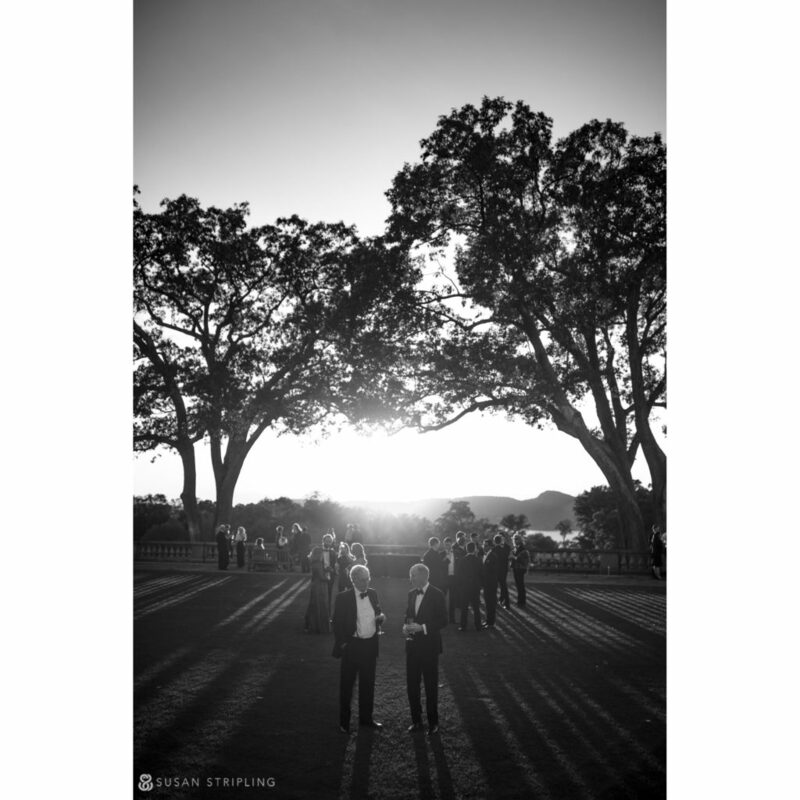 The sun sets in just the right location over the long lawn, casting a gold halo around the faces of the couple as they say their vows. 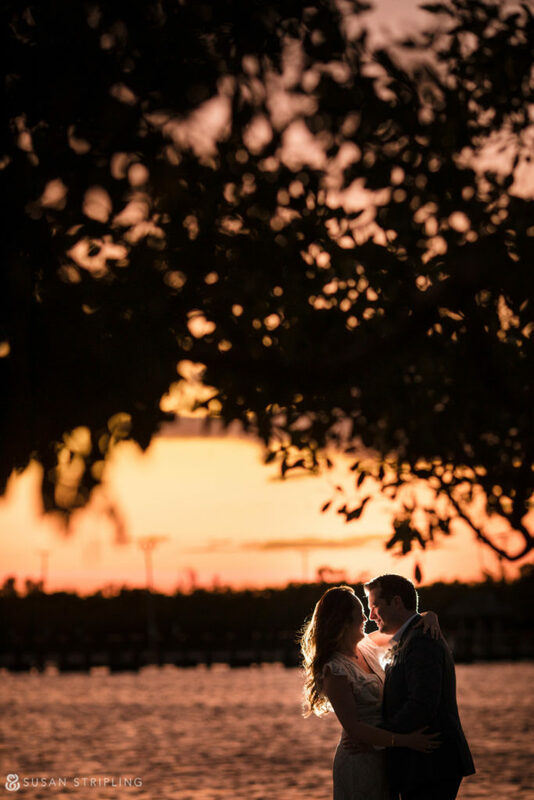 If you time your day just right, you can catch the last glimpses of daylight as your ceremony ends. 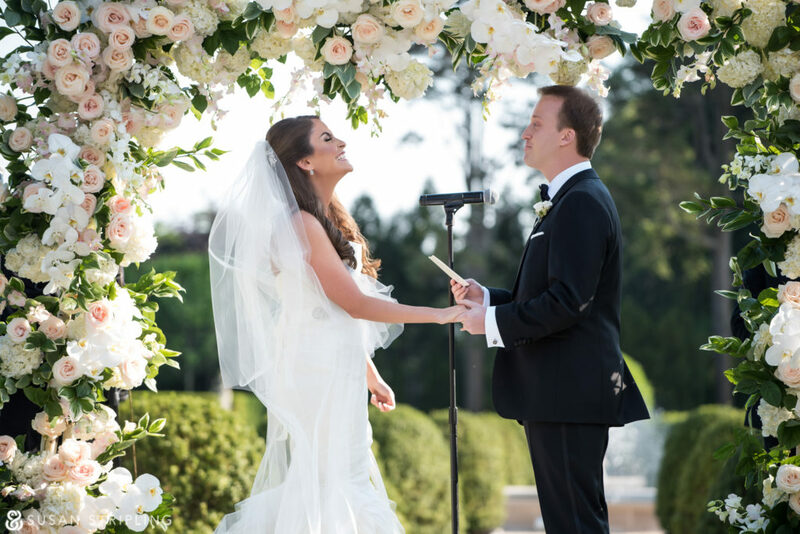 It’s a beautiful location to have an outdoor wedding – there truly is nothing like it! What? 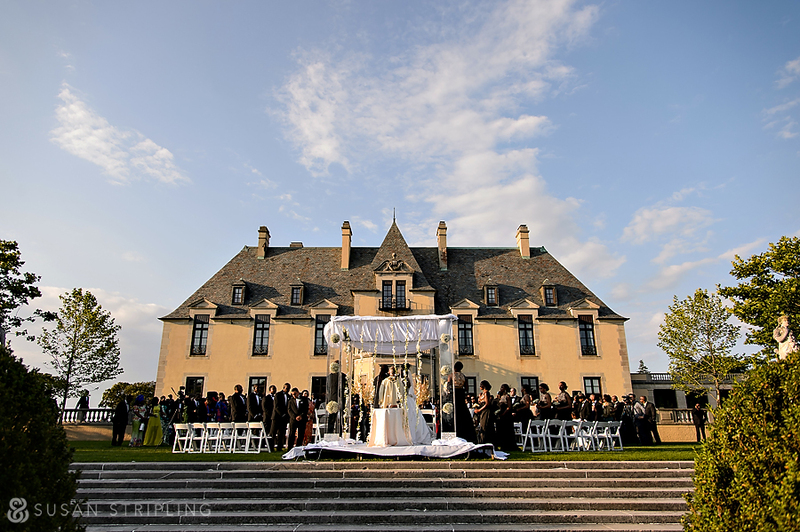 : Wedding outdoors at a castle in Long Island, reception indoors in the ballroom. I have been completely delighted with Nikki ever since our first phone call. 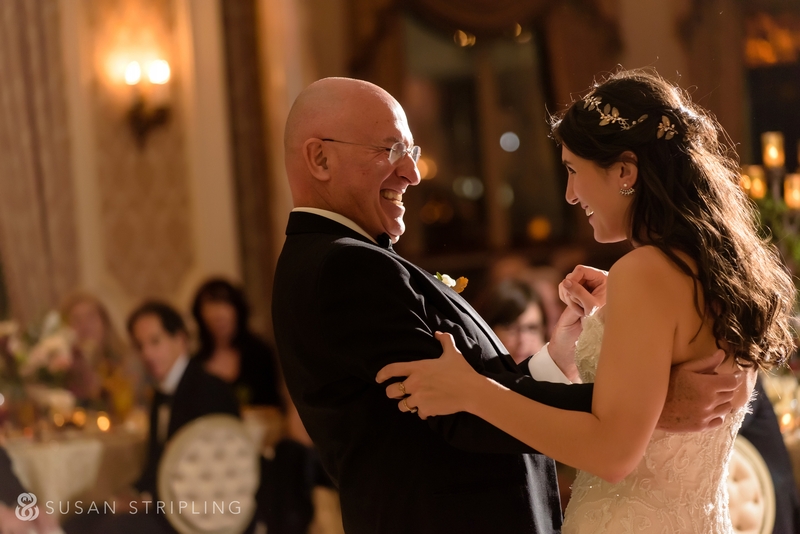 In fact, the first note that I ever took about her wedding was “Bride is marvelous.” I have loved every second of working with this fantastic couple. 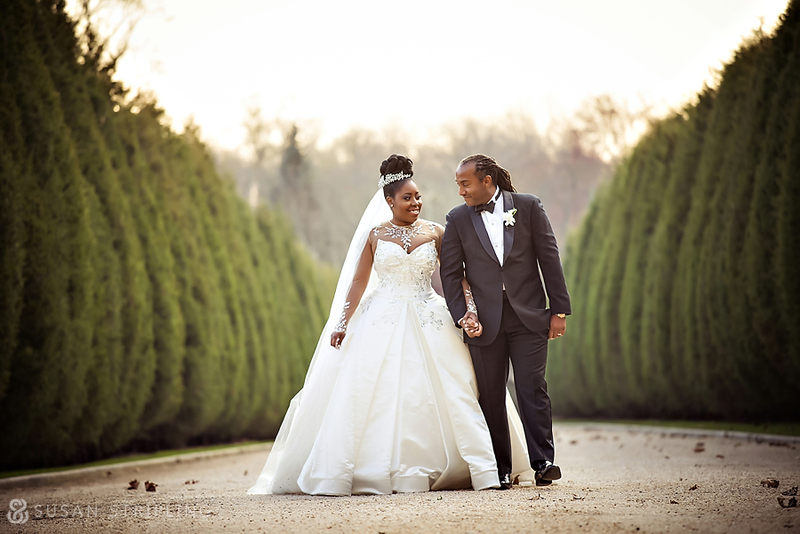 From photographing their intimate weekday church ceremony to photographing their wedding day at Long Island’s historic Oheka Castle, every second spent with this couple is a fantastic one. 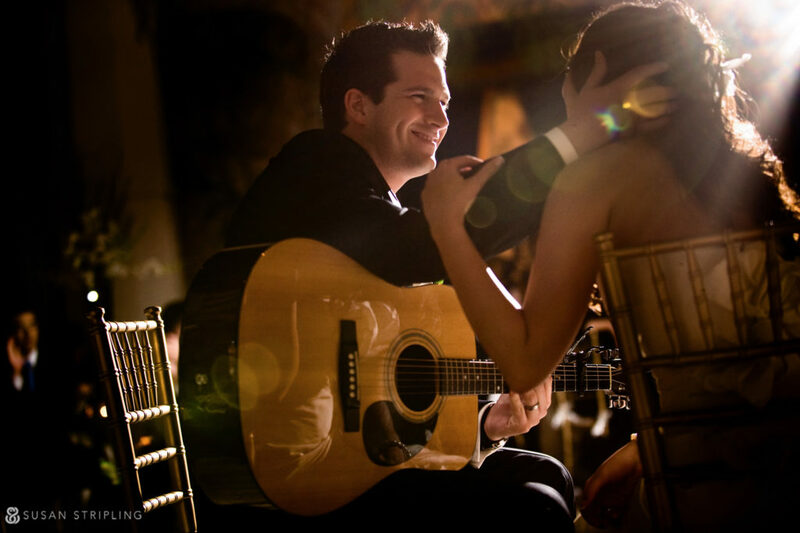 Nikki and Andrew light up the room, and it’s been an honor to work with them! 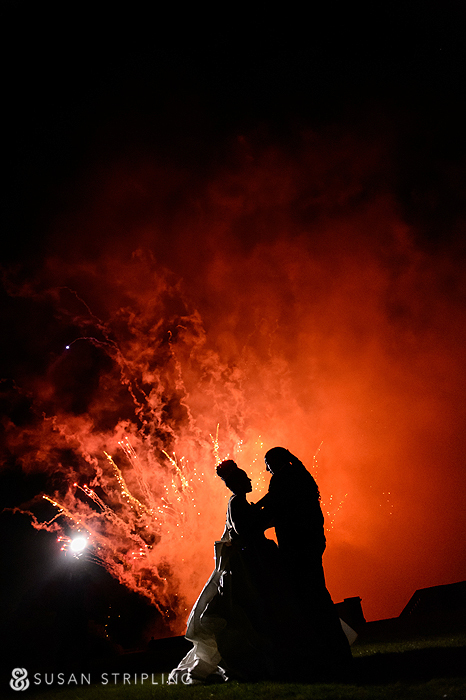 I had been worried about the weather for this Whitby Castle wedding for months. After having their engagement session rained out three times, I think this couple was more than deserving of the unseasonably wonderful weather they received! I was so glad to see that our “weather curse” didn’t follow them all the way until their wedding day! 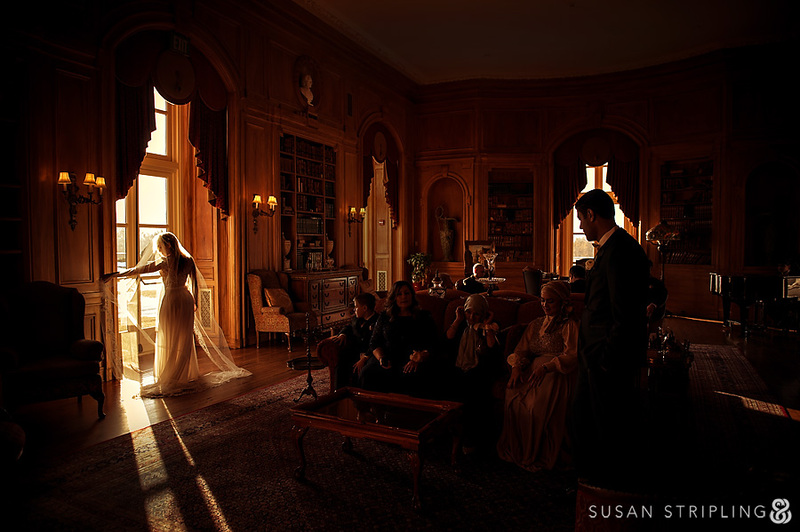 Whitby Castle at the Rye Golf Club is a sprawling wedding venue in Rye, New York. 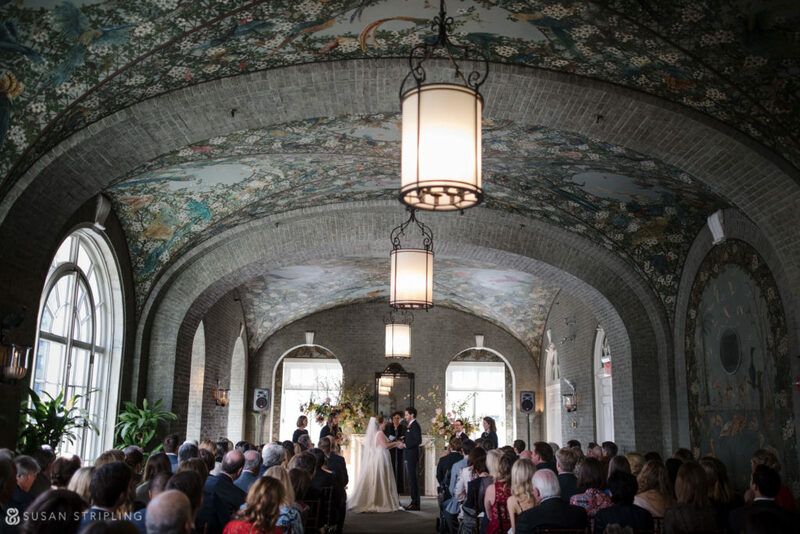 Modeled after England’s Whitby Abbey, Whitby Castle is a true oasis in Westchester County. It has the unique feel of a manor home, while being just a short drive away from the city. 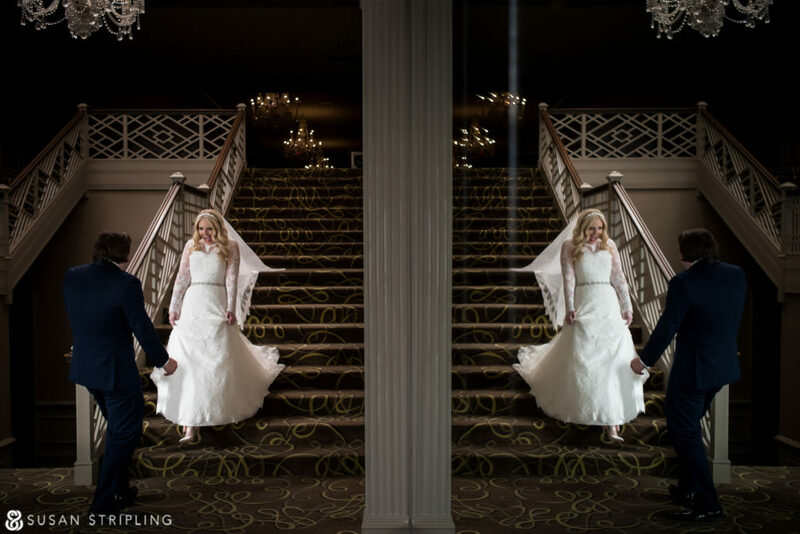 The bride and groom started their day at a nearby Westchester hotel before moving to a church for their ceremony. After a receiving line and family portraits at the church, we moved to Whitby Castle for their cocktail hour and reception. 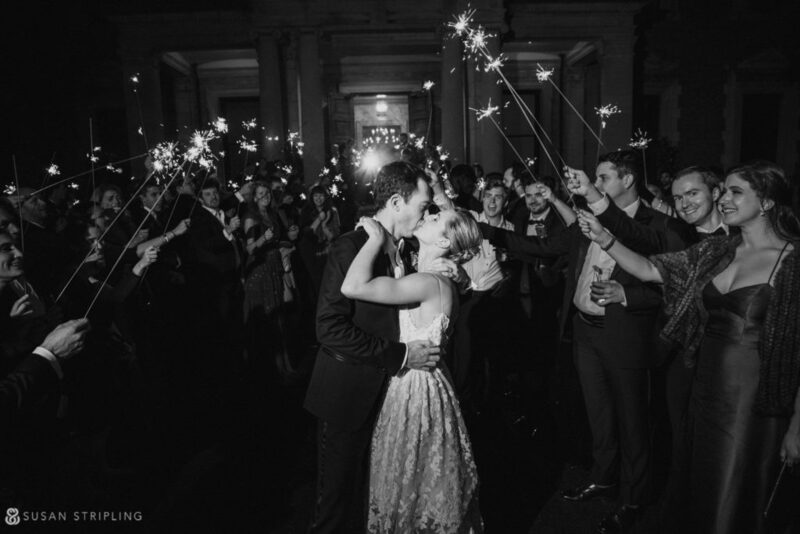 At one point the bride called the day her “perfect Pinterest wedding”, and she was right! 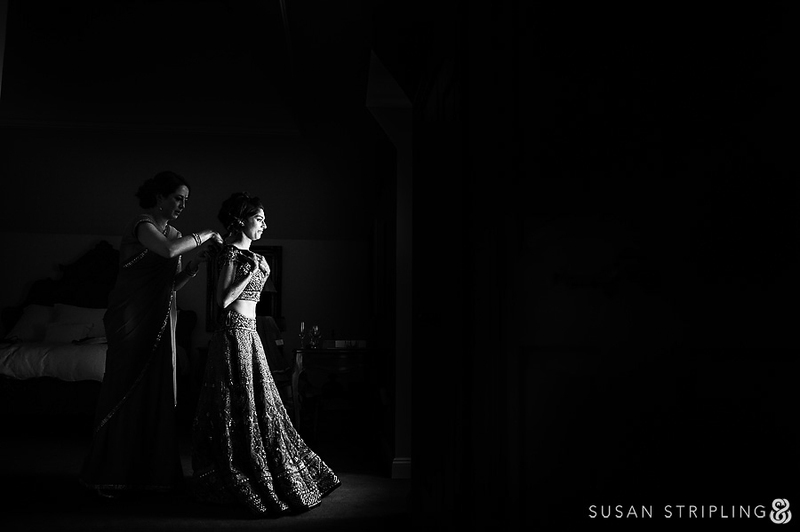 Not a single detail was left overlooked, with the bride tending to the look of the day with a beautifully personal touch. 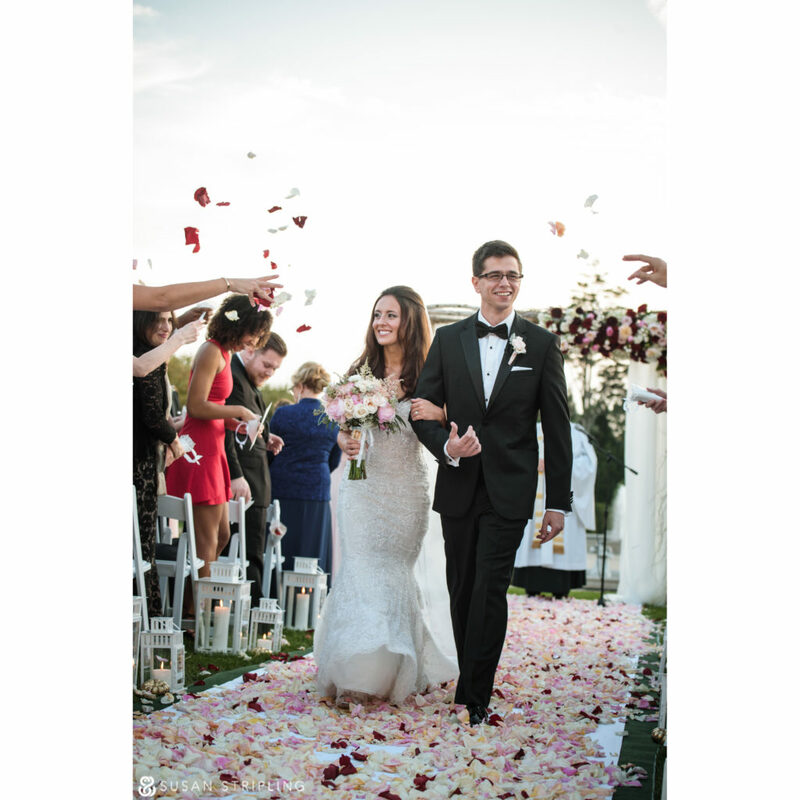 The bride wore a gorgeous Pronovias gown with a bolero. 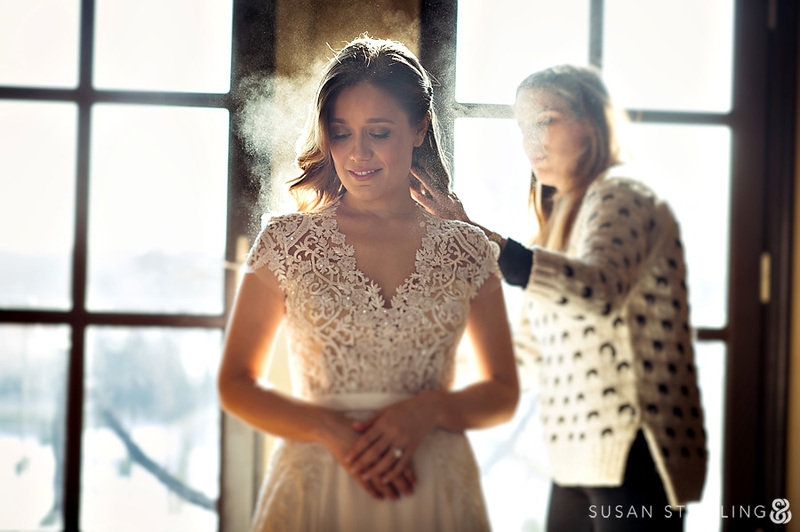 The bolero had long lace sleeves, and the entire top covered her strapless dress top. 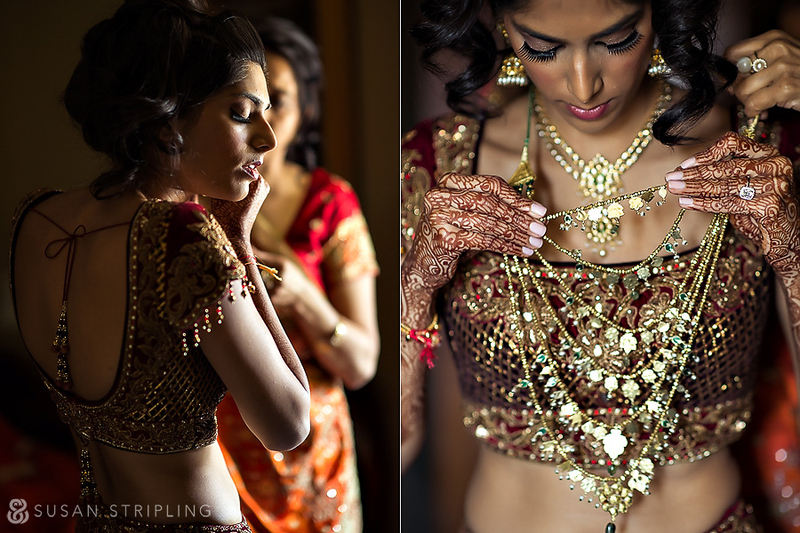 After the ceremony, she was able to remove the bolero and have a completely different look for her wedding reception! 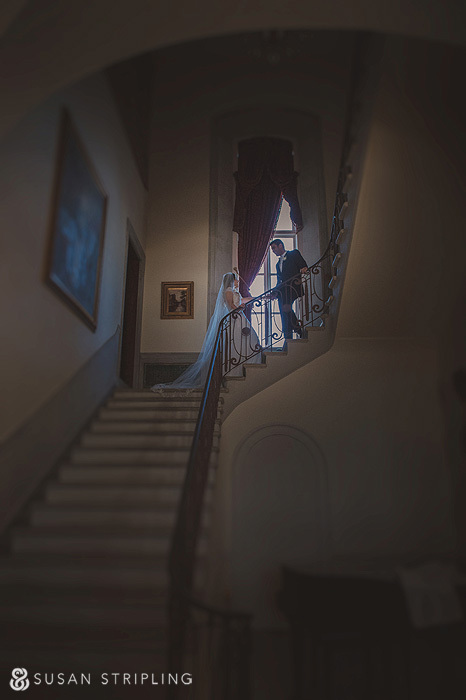 The couple requested that their first look take place on this staircase. 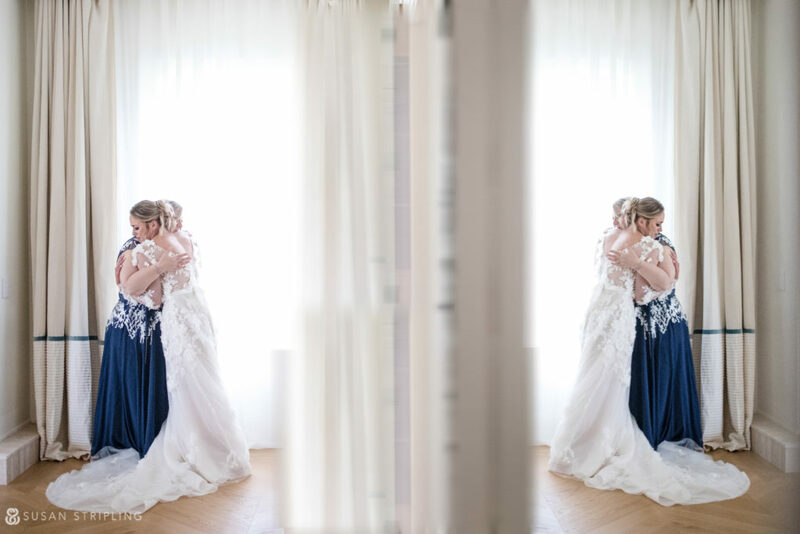 I was thrilled to find the mirrored wall next to me, using it to create a reflection of this incredibly important moment. 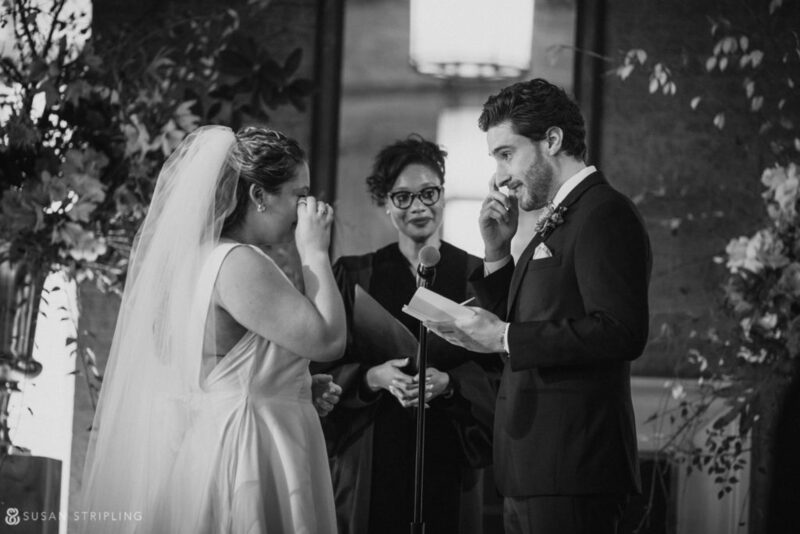 To do (or not do) a first look is something that many couples debate about. 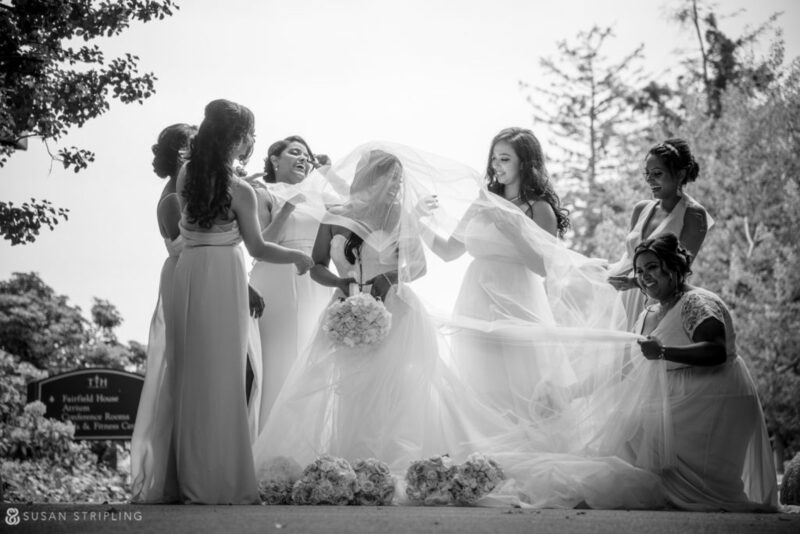 Do they want to see each other before they go down the aisle? 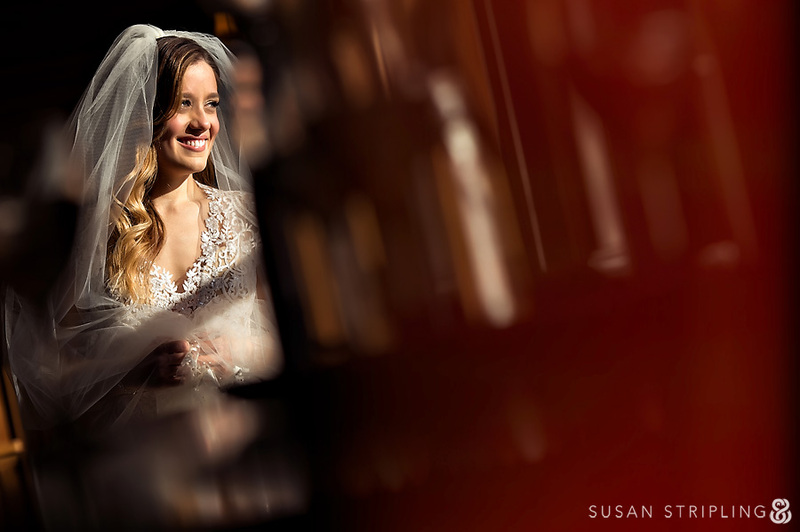 This bride and groom decided on a first look so that they could get pictures taken in natural light. 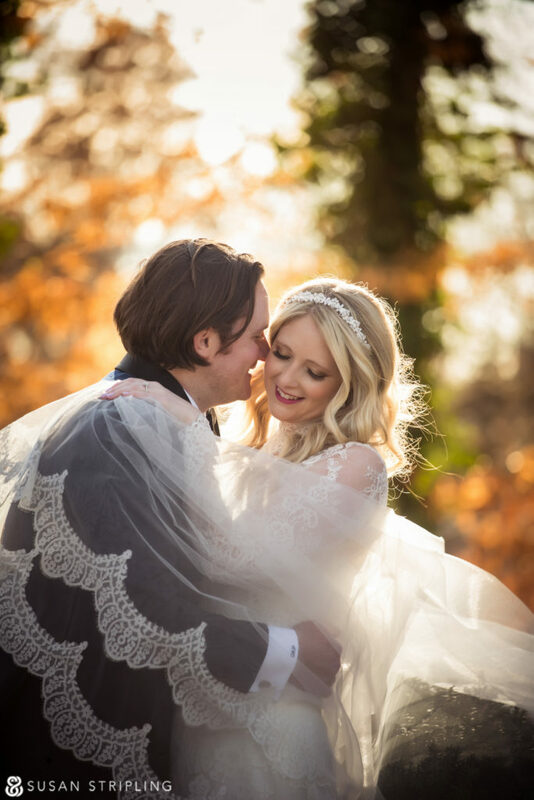 It can be tricky to work the schedule of a winter wedding around the sunset time, and for this reason the first look was a perfect decision for these two! 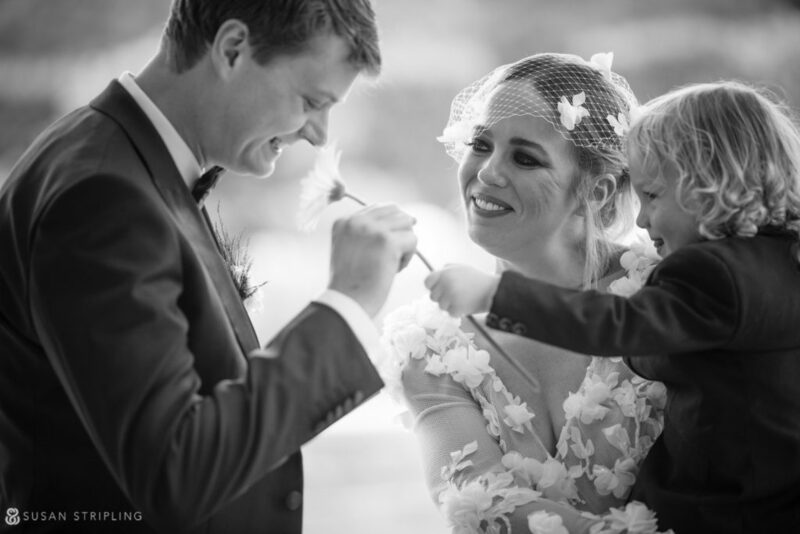 Weddings are full of many moments, both big and small. 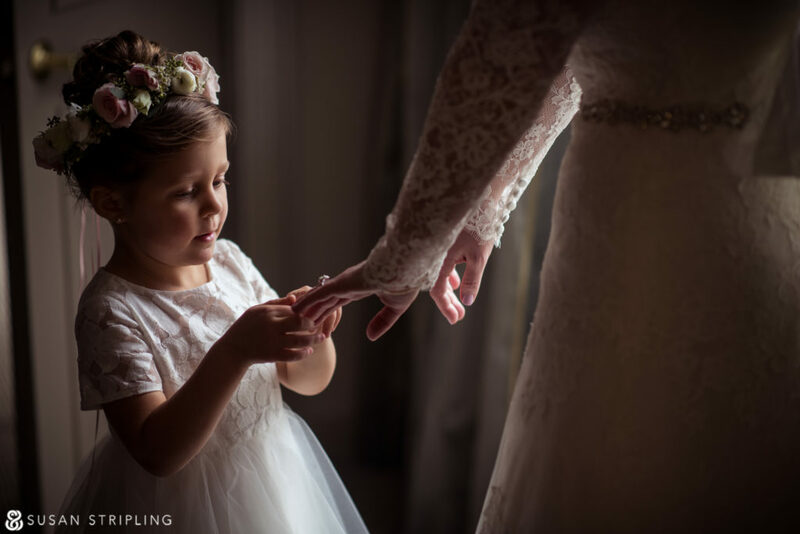 I love this quiet moment with the flower girl while she looks at the bride’s ring. I love it when couples opt for striking getaways at the end of their wedding reception. 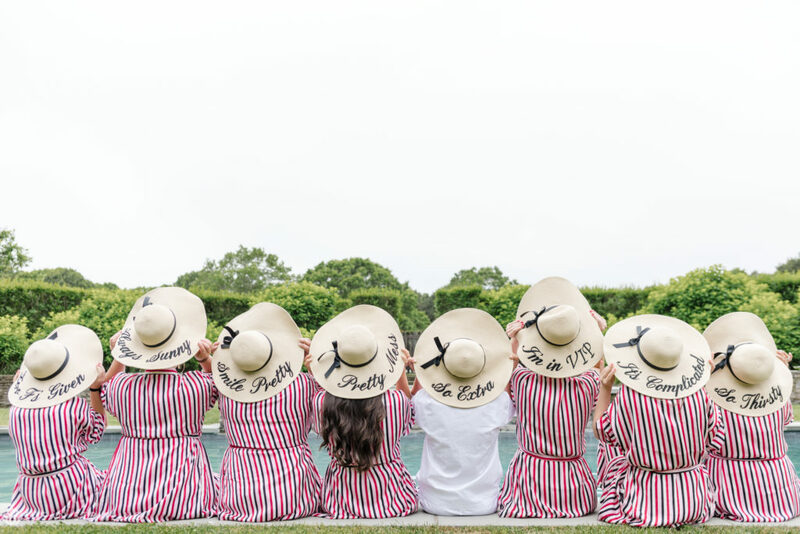 The bride and groom chose to spend this moment with their bridal party, which resulted in a dramatic (and very personal!) moment. 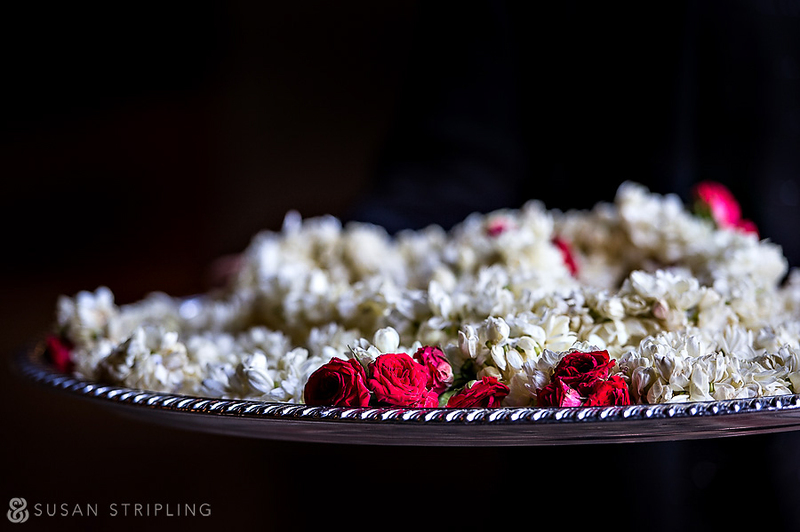 To see more teasers from this Whitby Castle wedding, check out our Instagram! 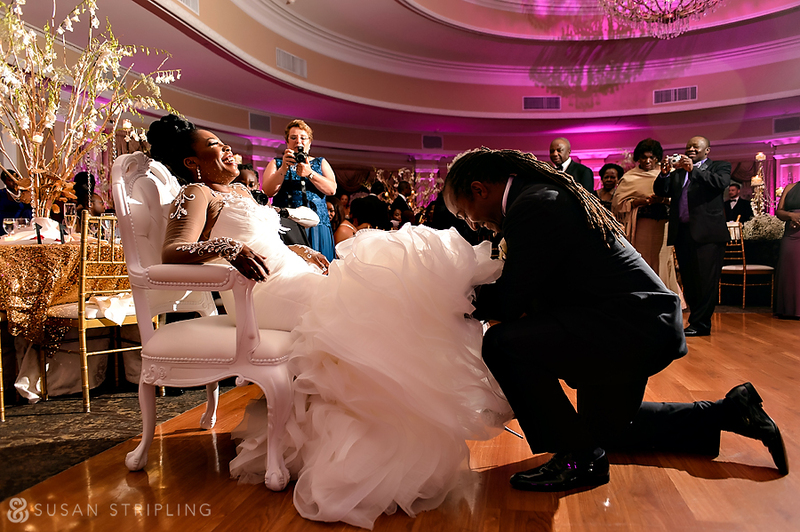 A Pleasantdale Chateau wedding isn’t your average, ordinary wedding. There is something so special about Pleasantdale, and every time I’ve been there I’ve been so sweetly impressed. I clearly remember my first Pleasantdale Chateau wedding, which took place during an actual hurricane. 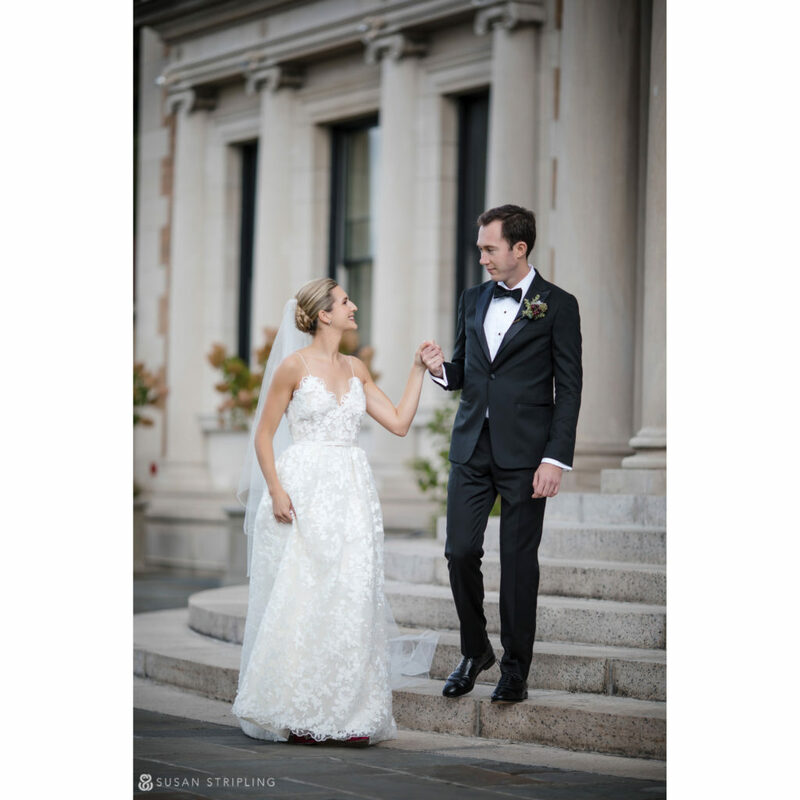 Hurricane Irene landed right on top of a past client’s wedding date, and I was blown away by how seamlessly the Pleasantdale staff handled such a crazy day! 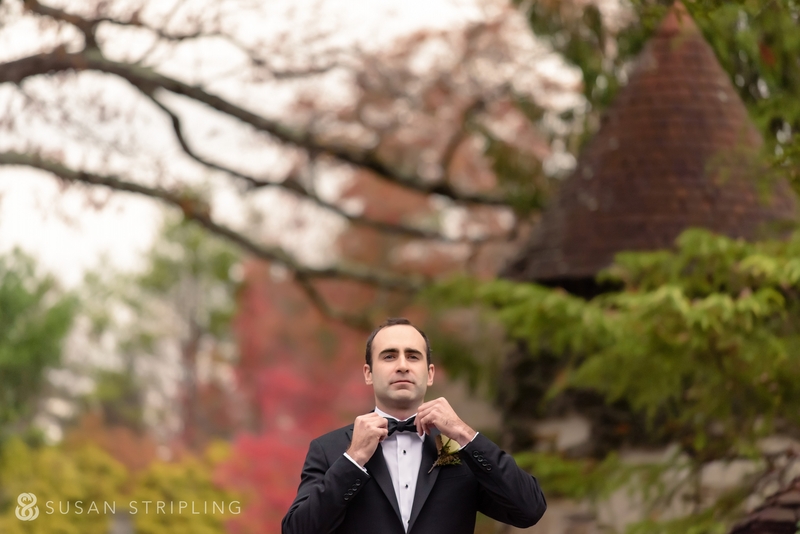 I’ve been to Pleasantdale Chateau weddings in the rain, the fog, the sun, and on this brilliant fall day, in the beautiful moody autumn weather. 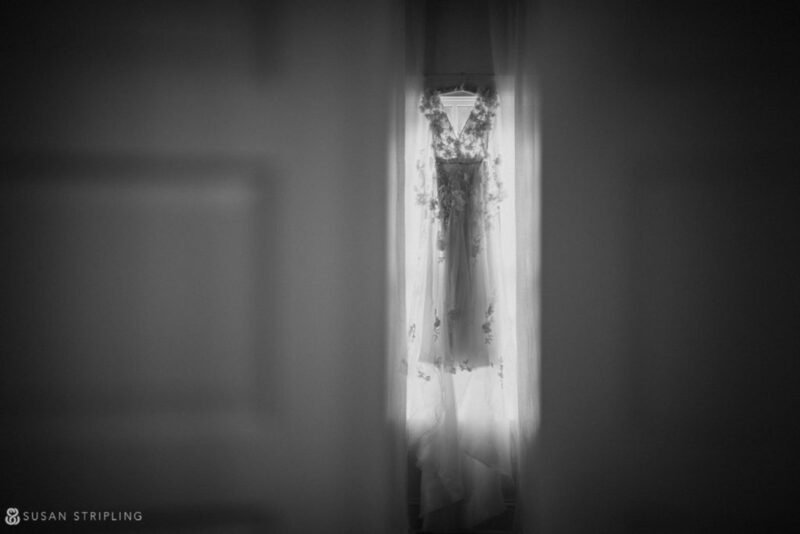 We started the day in the Pleasantdale bridal suite. I am a huge fan of the cheerfully patterned wallpaper, the abundance of natural light, and the variety of locations for photography. 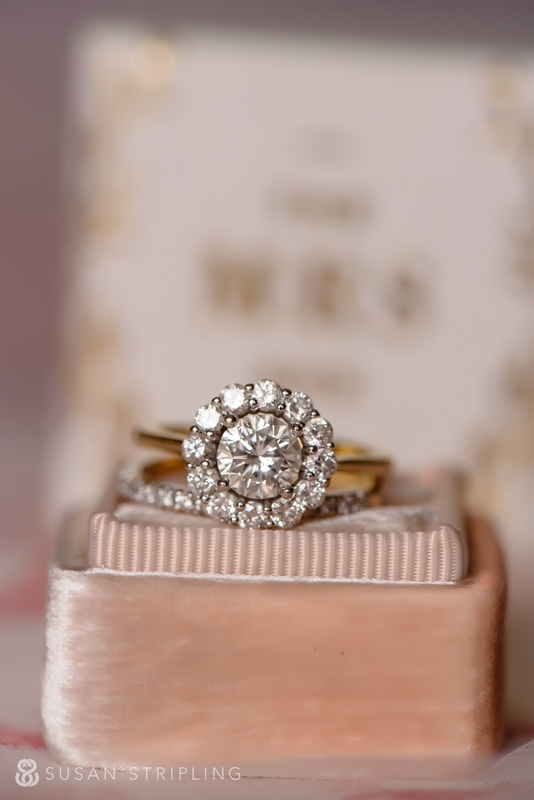 I was able to spend a few minutes with the bride’s gorgeous engagement ring and delicate band, not to mention her super-sweet, super-tiny, super-darling blush peach Mrs. ring box! 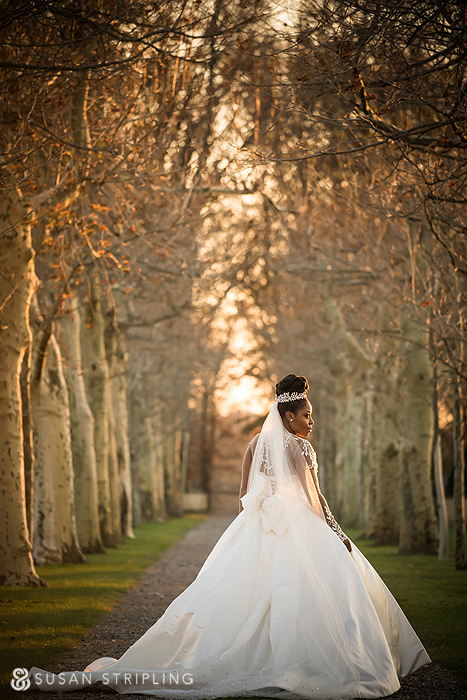 One thing I love about a wedding at Pleasantdale Chateau is the variety of backgrounds and locations for pictures throughout the entire estate. The wallpaper in this room is a particular favorite of mine. It looks almost like an old master background from a classic portrait studio! 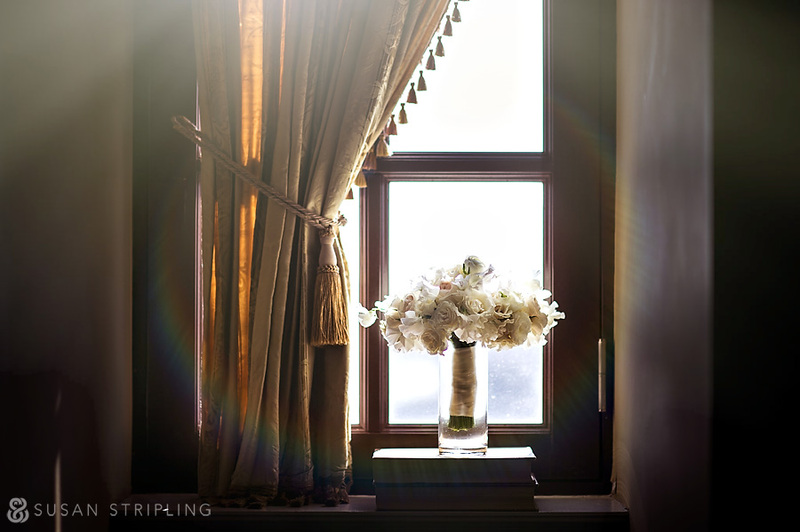 I love how the warmth of the background adds a warmth to the image itself, and how the soft light spilling through the window adds to the golden hue of the space. 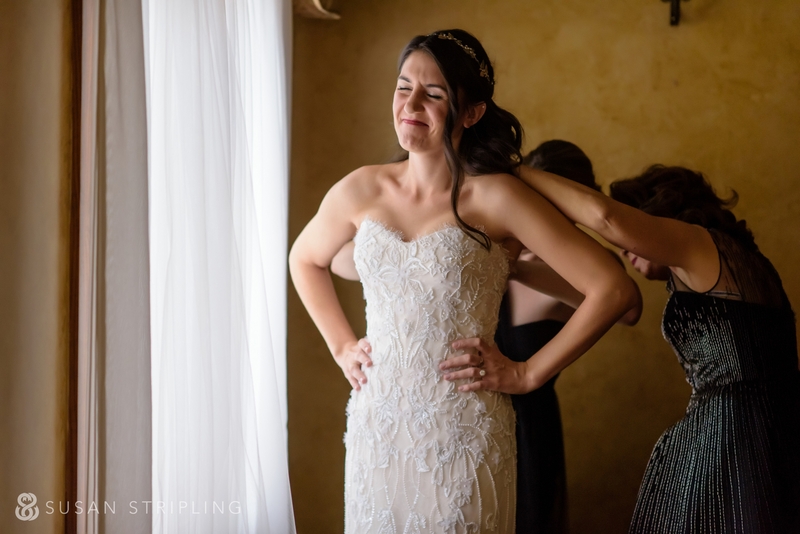 The getting-ready portion of the wedding day is always a wonderful opportunity to document moments! I love the dozens (if not hundreds!) 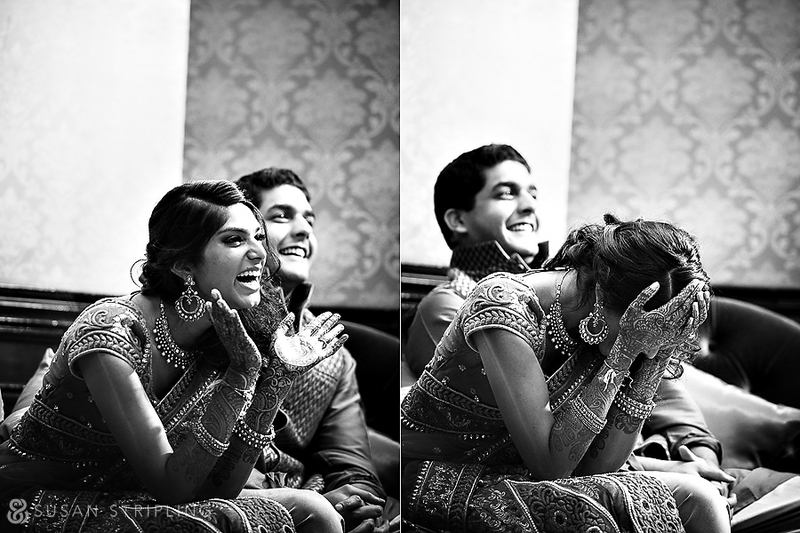 of expressions that cross a bride’s face while she’s putting on her dress. This is one of my favorites! I am such a fan of the Mrs. box! 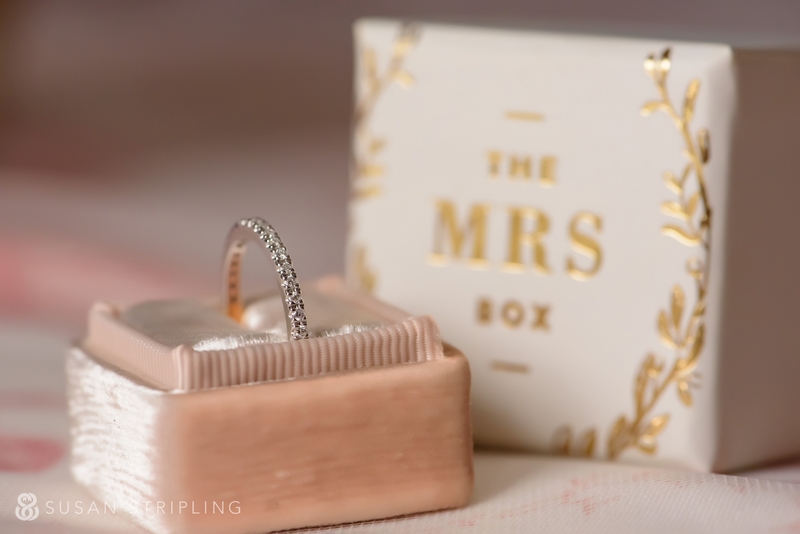 It’s a wonderful alternative to an old-fashioned ring box from the jewelry store. 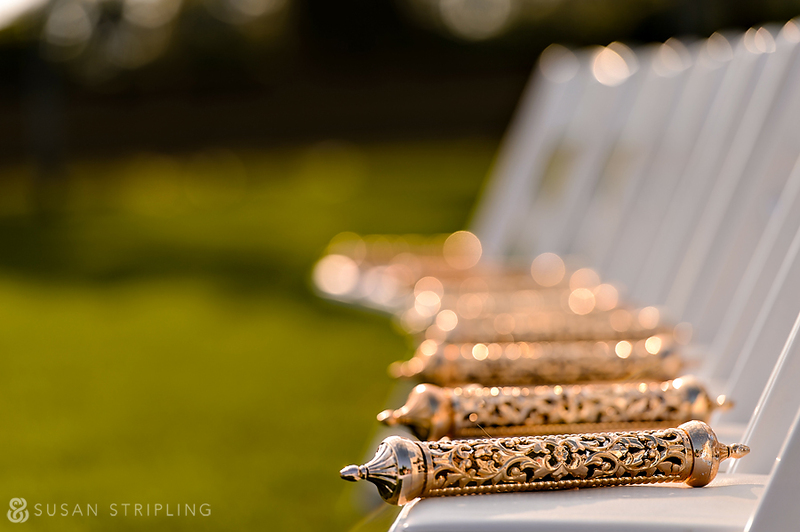 They have so many colors that you can choose from, it’s easy to customize your box to the colors of your wedding! 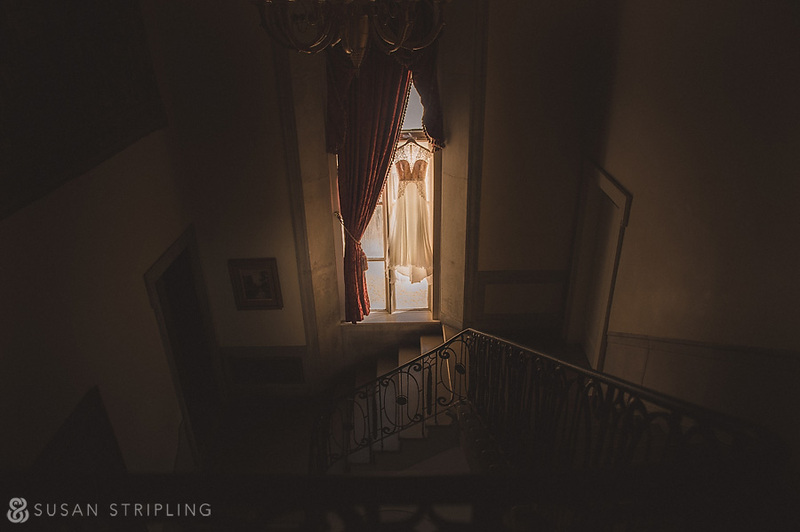 Even though it was overcast outside, the light coming in through the windows was still direct and dreamy. 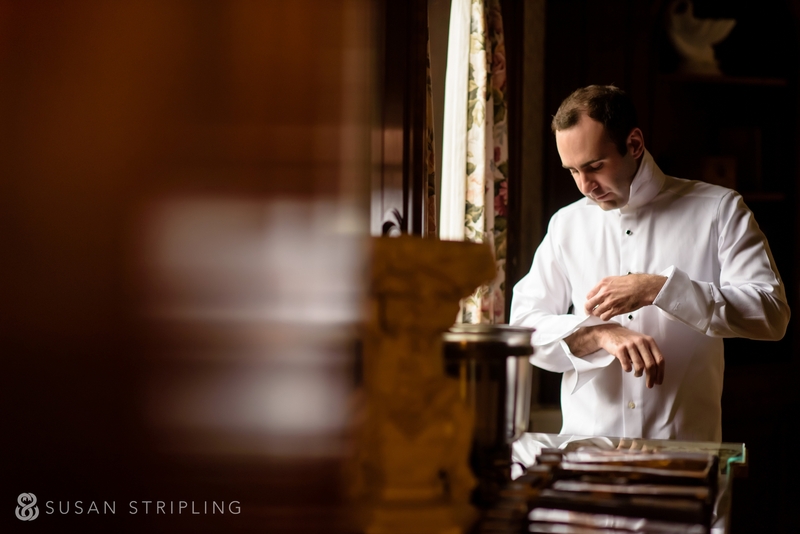 I love these last few moments of preparation before the day really takes over and everything gets exciting and chaotic! 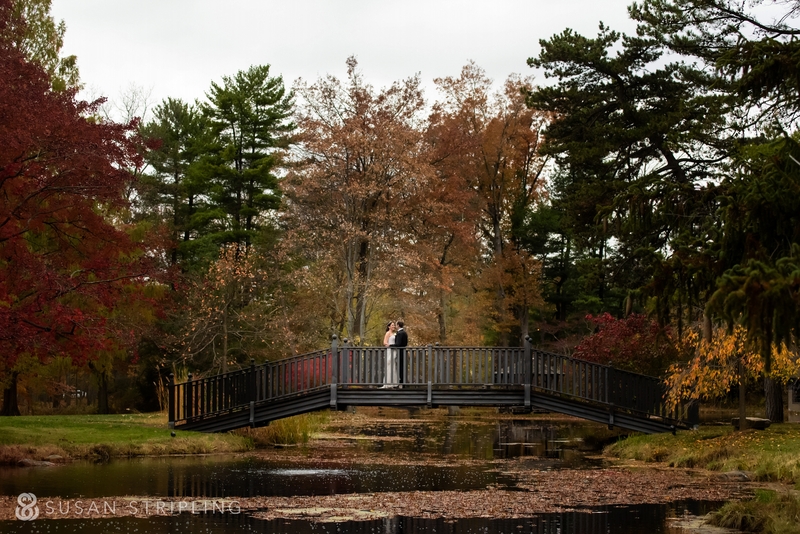 I absolutely and completely love fall weddings. There is something so magical about the fall foliage. 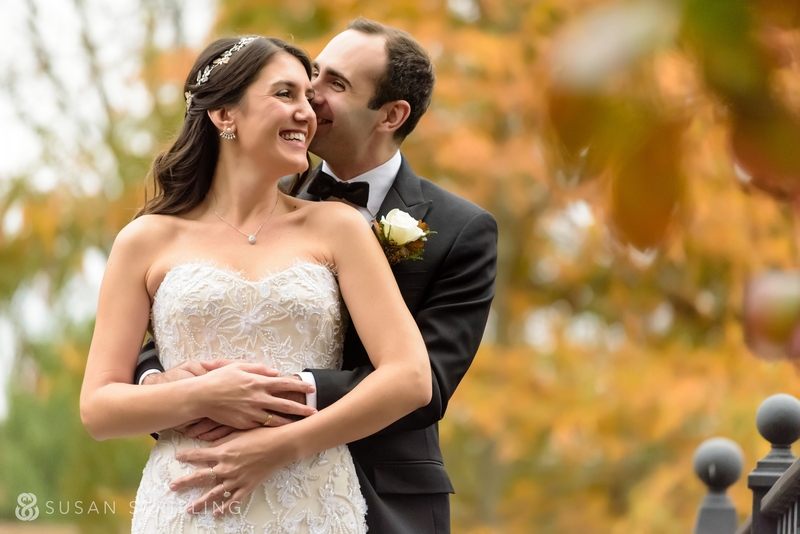 A Pleasantdale Chateau wedding is the perfect place to be in the fall. 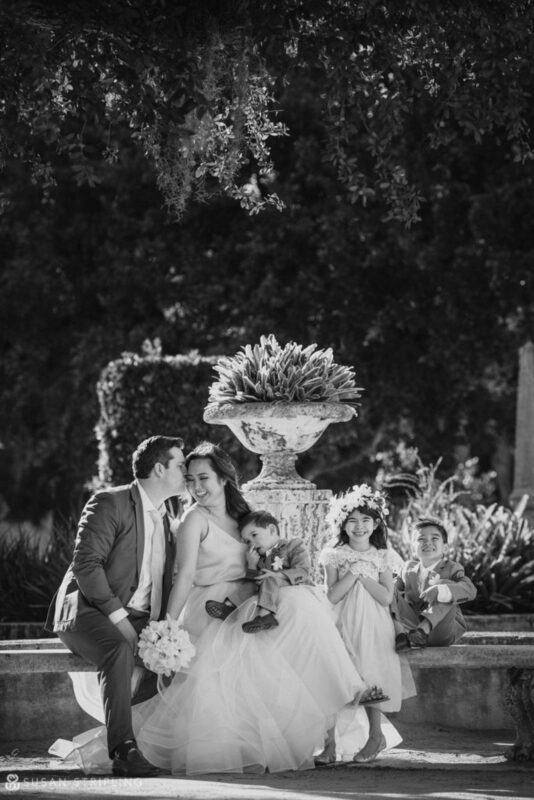 I love the turret peeking out of the foliage in the back of this image. 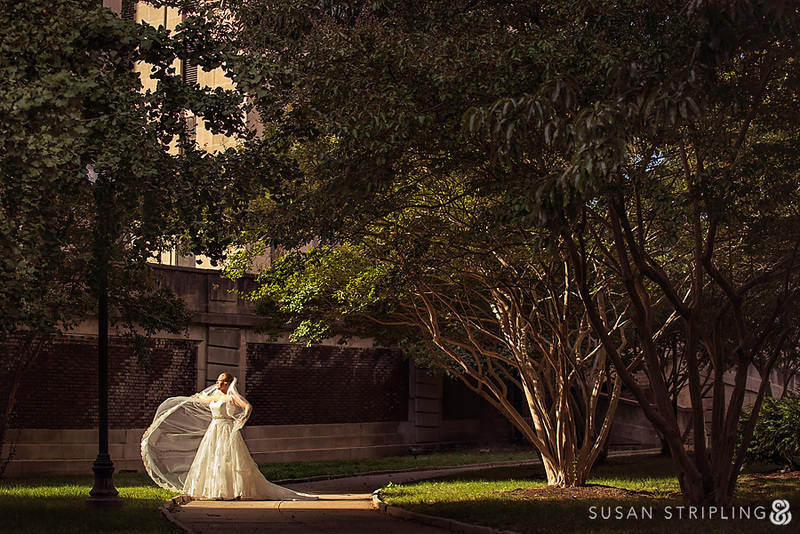 It is such a gorgeous location for portraits! 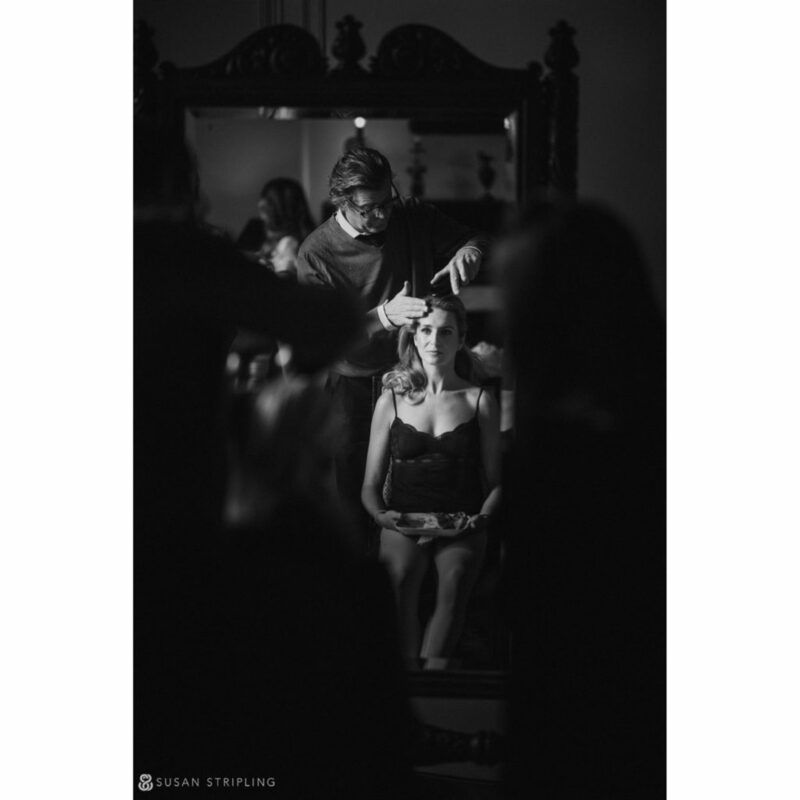 My clients often ask whether or not they “have to” do a first look, or whether or not they “should” do a first look. I truly believe that is not my decision to make for you. 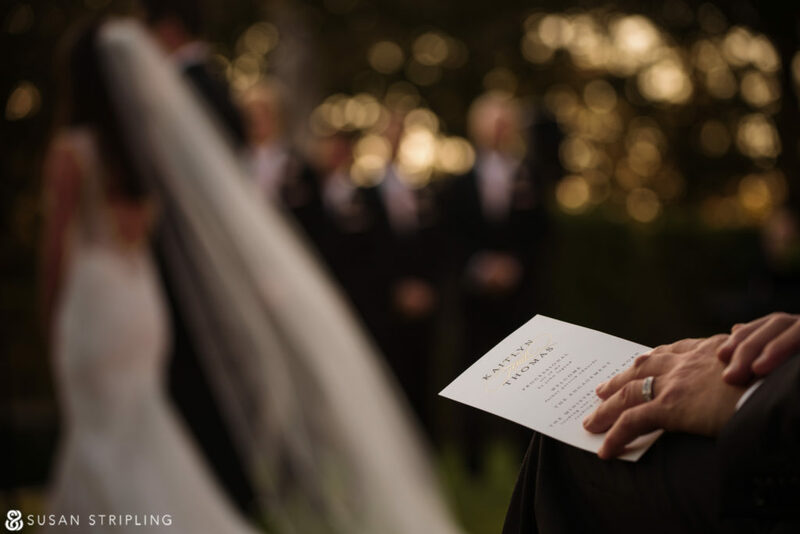 Whether you want to see each other before the ceremony or not, I can help you with a list of pros and cons for each decision. We will make it work, whatever you decide. The day is about YOU, and I truly do want you to choose what works best for you! 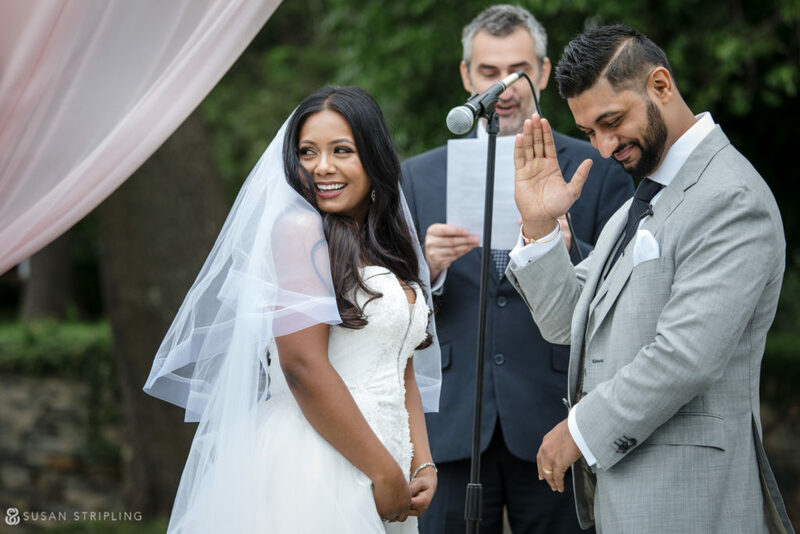 At this Pleasantdale Chateau wedding, the first look worked best for these clients. I love their reaction to seeing each other for the first time! 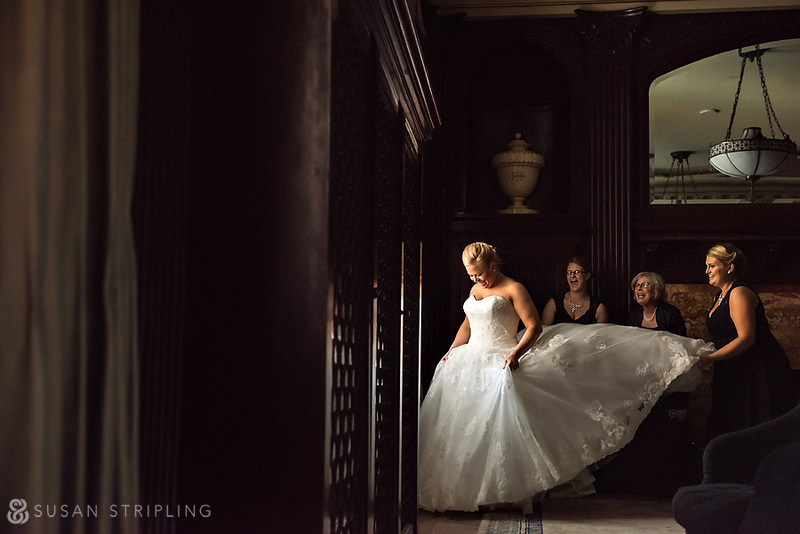 This image is a wonderful example of how, as a wedding photographer, you have to stay on top of the unfolding moments! Beautiful moments often lead to other beautiful moments. If you blink, you might miss them! Isn’t it amazing when all the details you’ve planned for months come together? 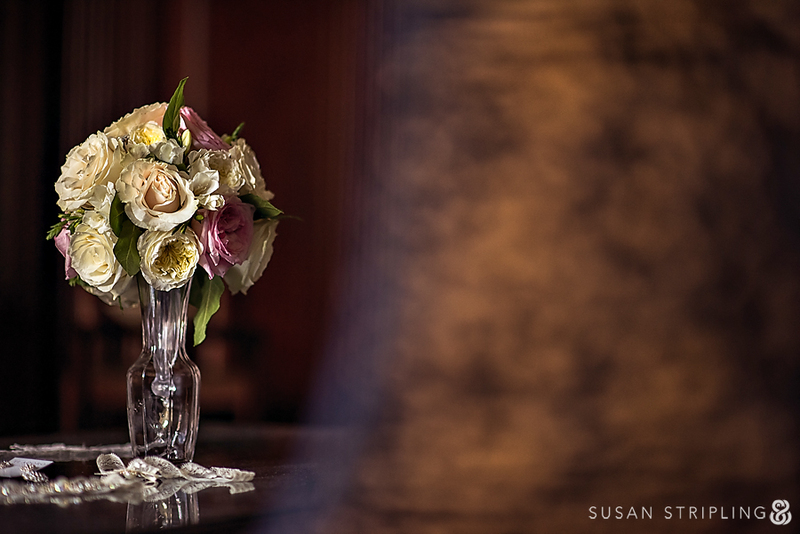 The floral team did a stellar job with matching the flowers to the rest of the wedding’s vintage glam aesthetic. While we had no sun for portraits, we did have marvelous scenery. 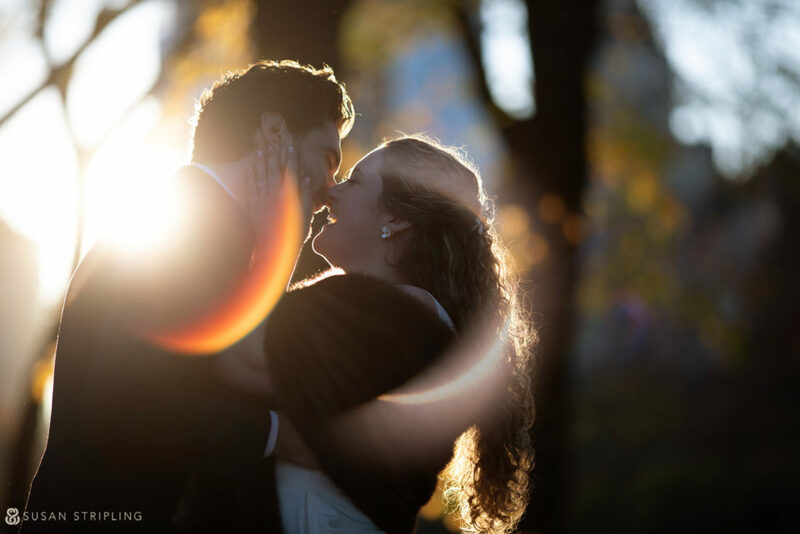 I love the fall foliage and the dreamy light in this portrait! 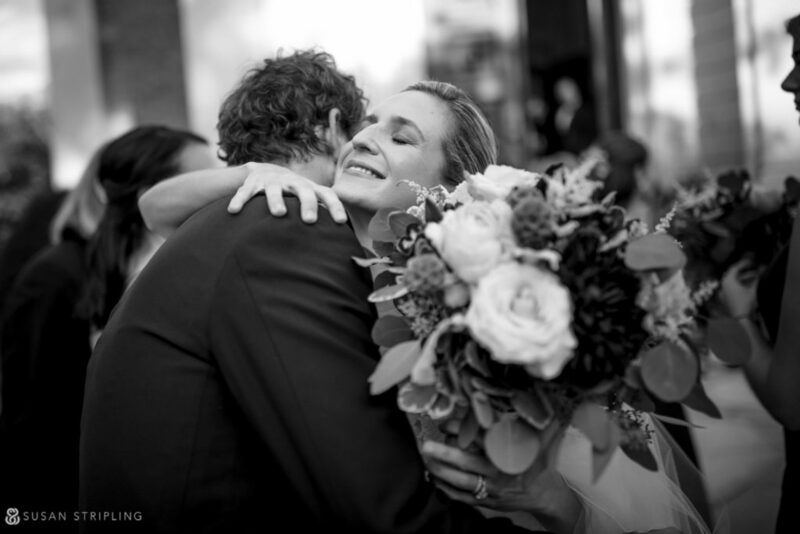 The bride and groom were so sweet with each other. Completely natural, joyous, and truly present in every moment. It was lovely to behold, and even lovelier to document! Every year, clients ask if I have suggestions as to when the fall foliage will be at it’s peak. It’s usually sometime within the last few weeks of October, and the first weeks of November. 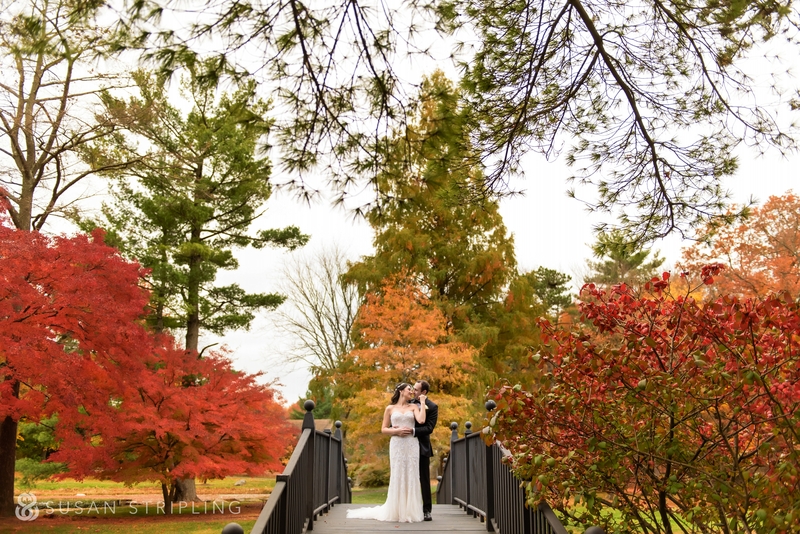 I was so glad to see that the trees were still holding their leaves for this wedding! 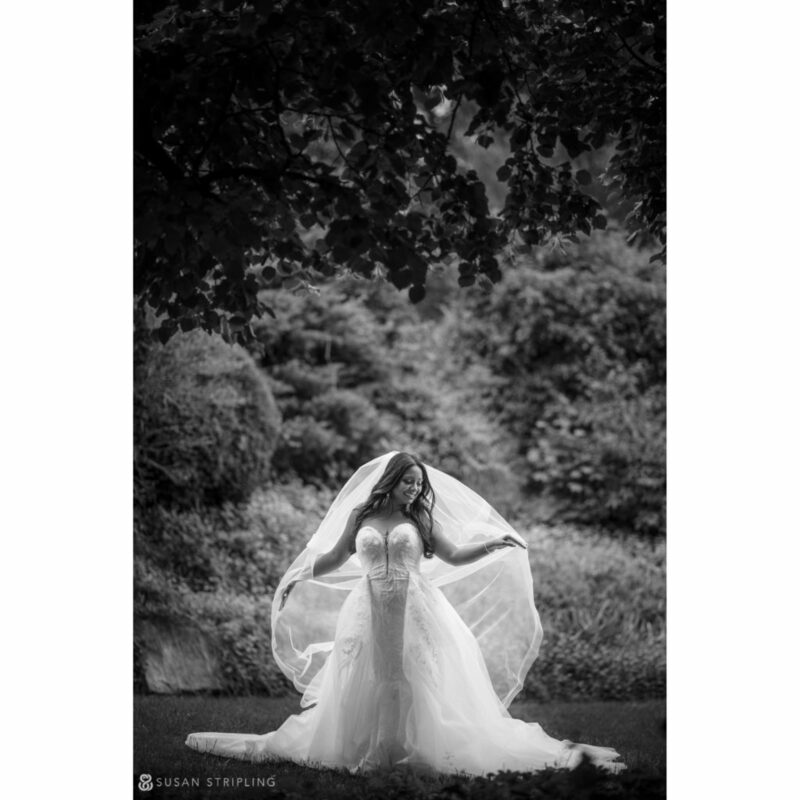 It provided a beautiful backdrop for the wedding day portraits of the bride and groom together. 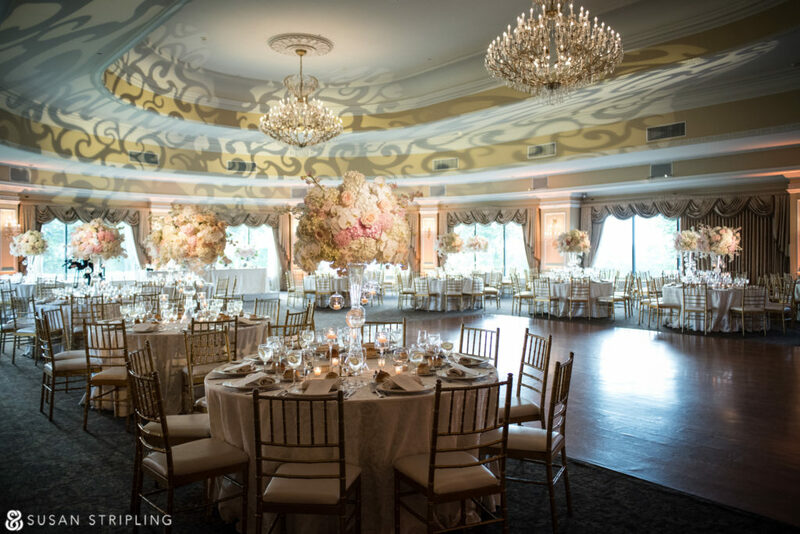 The decor was wonderful, marrying the bride and groom’s aesthetic sensibilities with the warm, welcoming atmosphere of Pleasantdale Chateau. 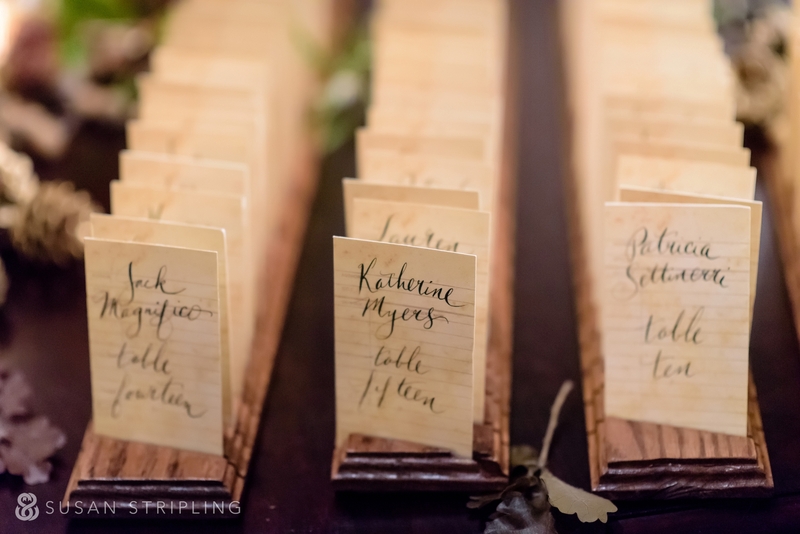 I love these vintage-styled cards for their seating card table! 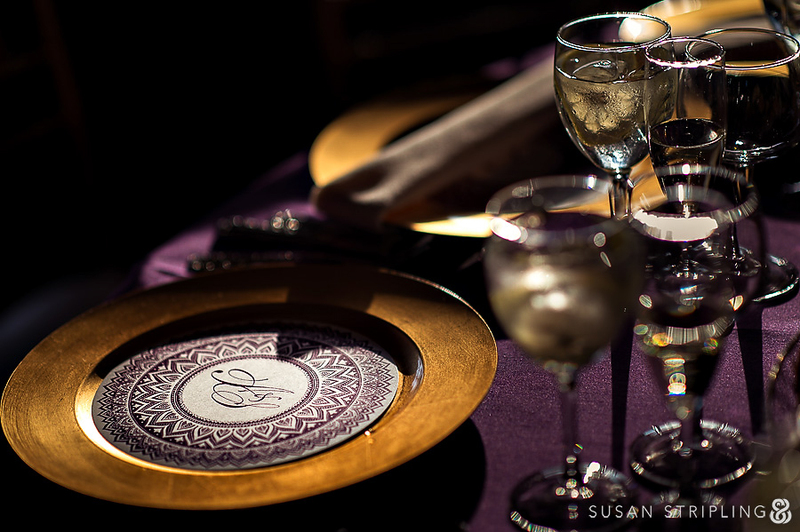 The decor for the reception also echoed that same aesthetic. Quietly glamorous, a little rustic, and infinitely welcoming. 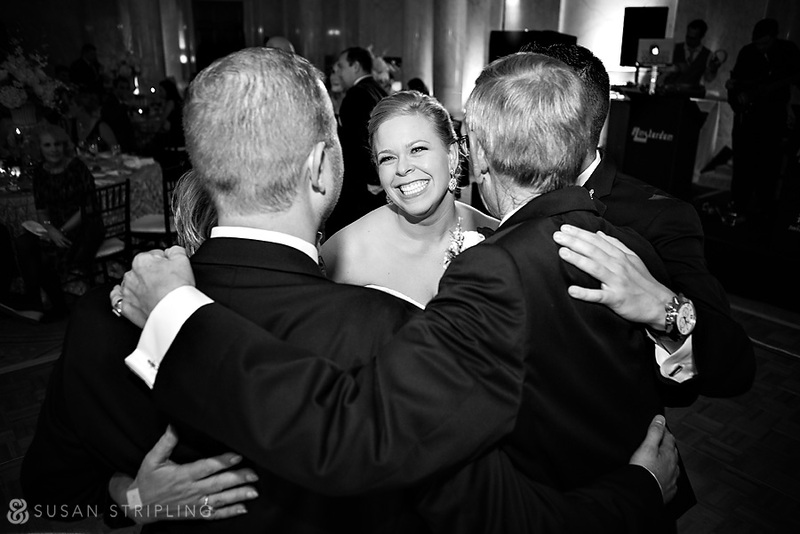 Some of my favorite moments take place during the introductions of the bridal party, family, and bride and groom. I love seeing their family and friends crowded around the floor, cheering them on! 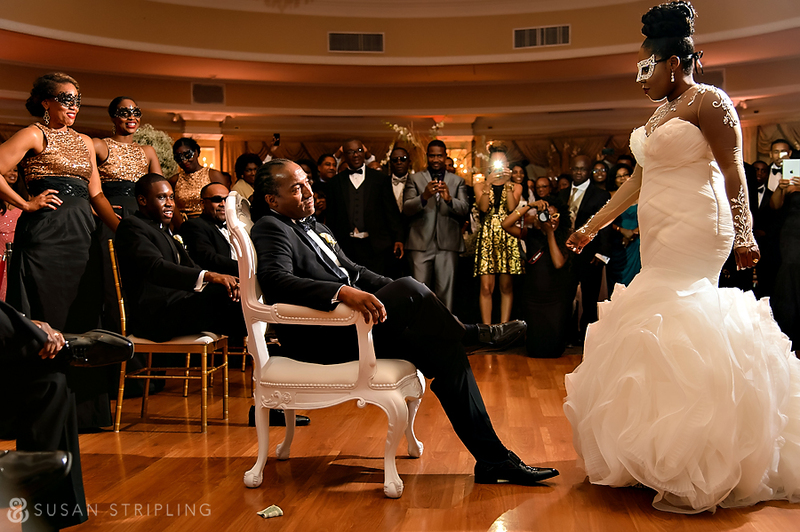 I know this image is during the first dance, but how great is the bride’s headpiece? 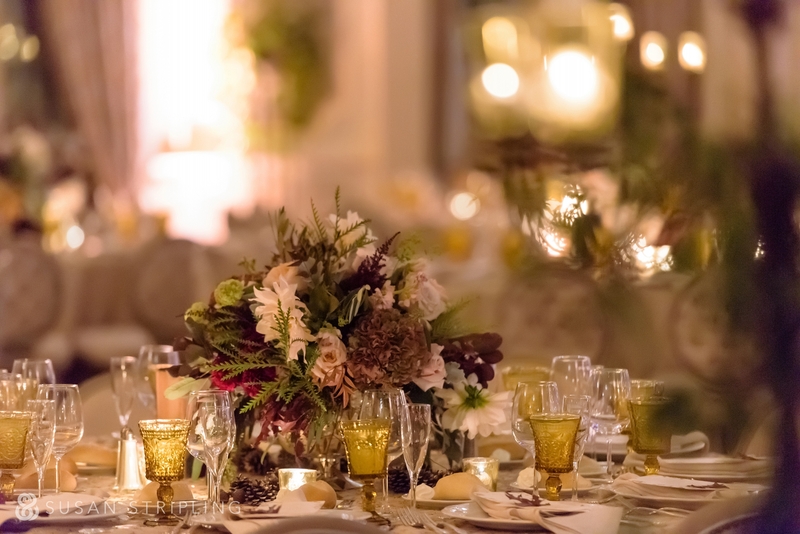 I loved the styling of her look, and how perfectly it fit in with the rest of the wedding decor and theme. 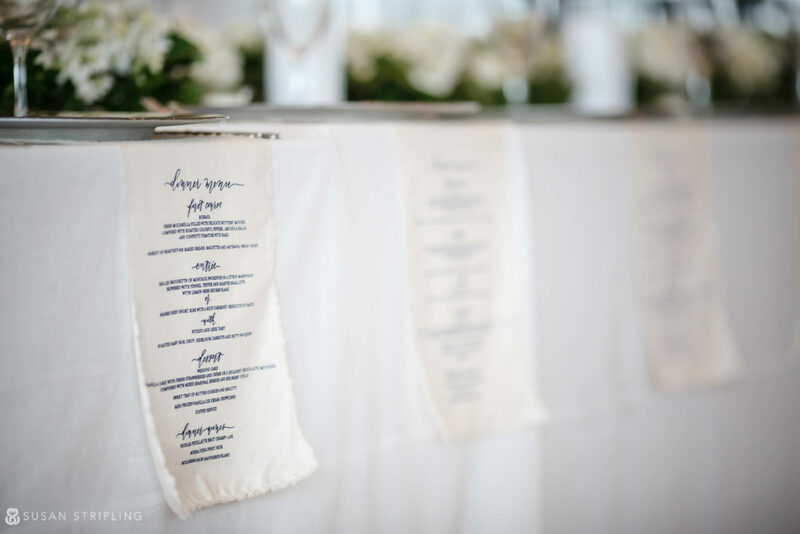 Back to the moments of the wedding day – how great are toasts? 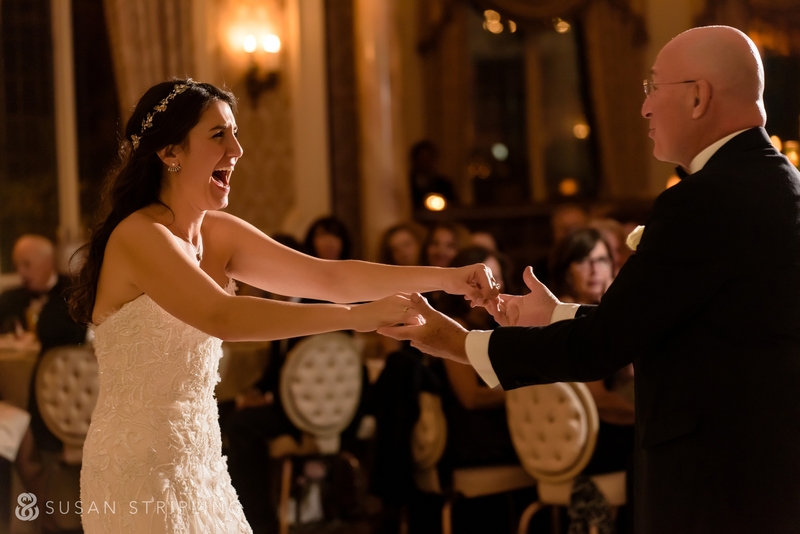 I think the bride’s reaction says it all! 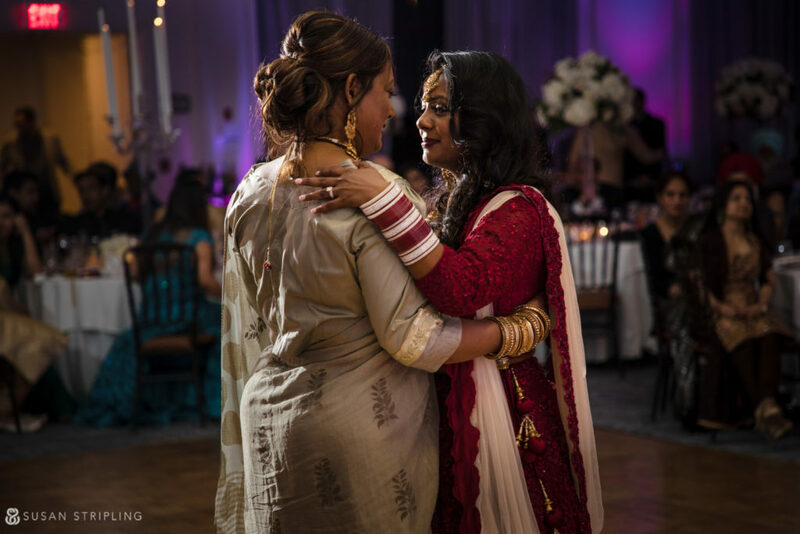 As a witness to so many beautiful moments between families, I am always so honored to be there. 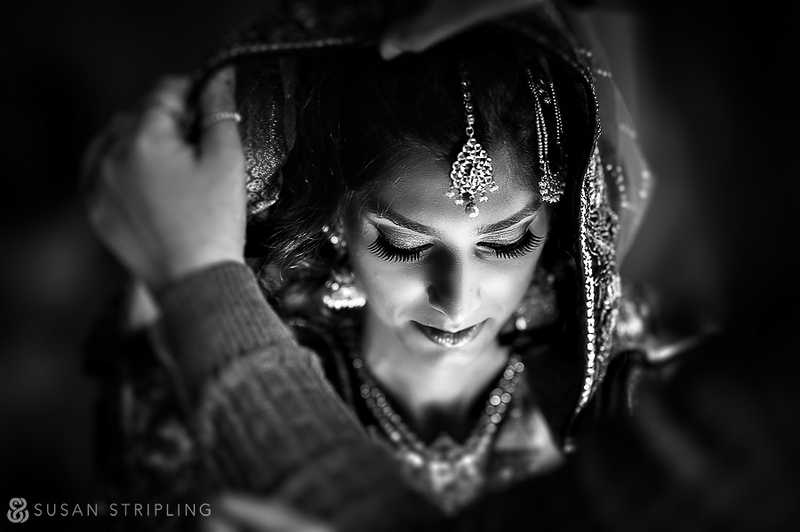 Creating images that will live in a family for generations to come is a responsibility that I take very seriously, and am always grateful to each client who hires me for their wedding day! 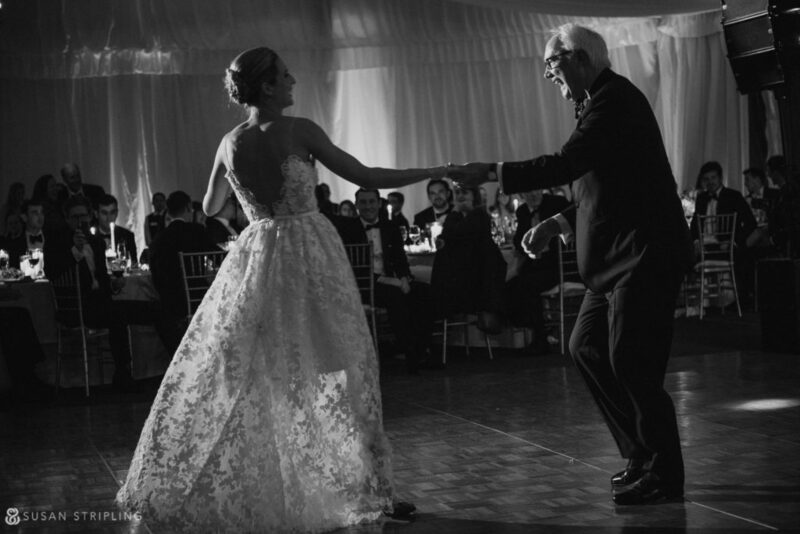 The bride’s dance with her father was full of so many stellar moments and reactions. It was hard to choose just two to post! 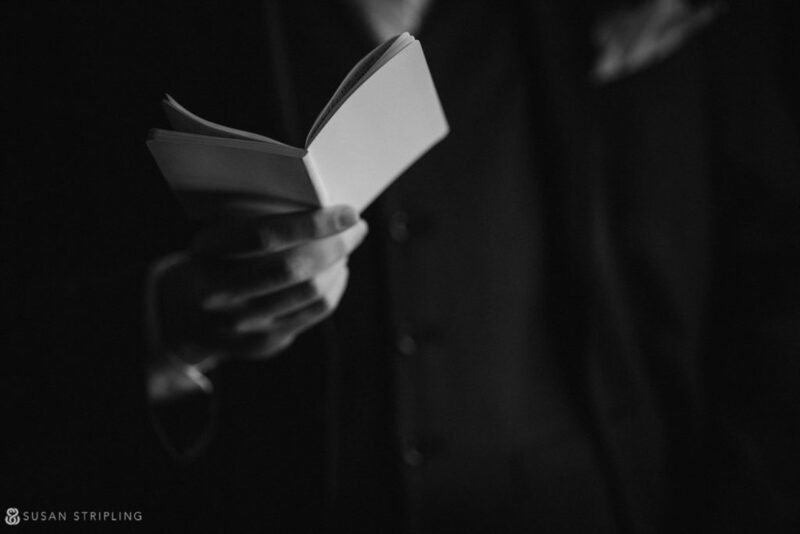 Quiet moments speak just as loudly as the more exuberant ones. Quiet, loud, subtle, or sweet, I love moments of all kinds! The party was lively all night long! I was so very honored to be a part of this day, and even now this image makes me smile. 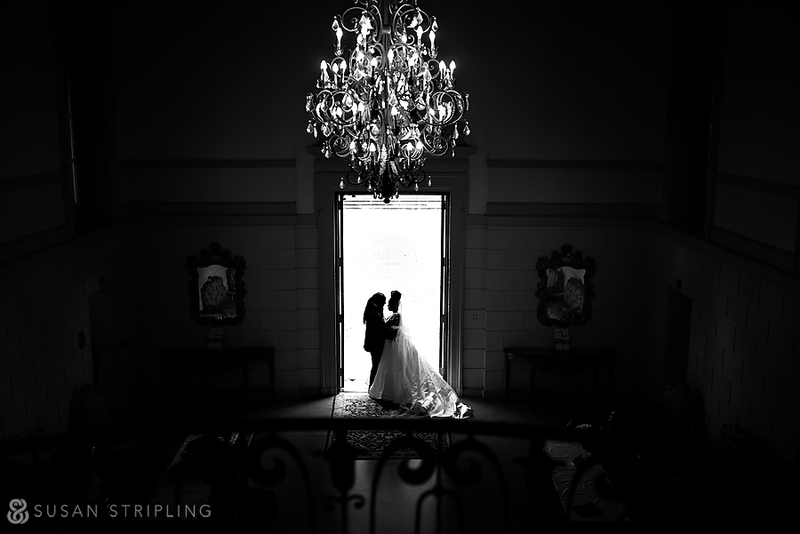 I often get asked if I remember all of the weddings that I shoot. The answer is yes, I really do. When you spend week in and week out with such glorious people, how could you ever forget? 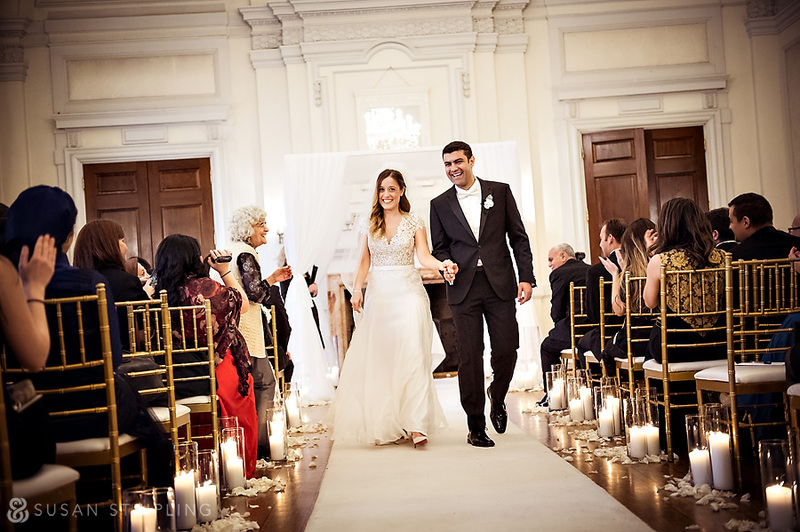 Guzey and Ali’s event was not my first wedding at Oheka Castle. 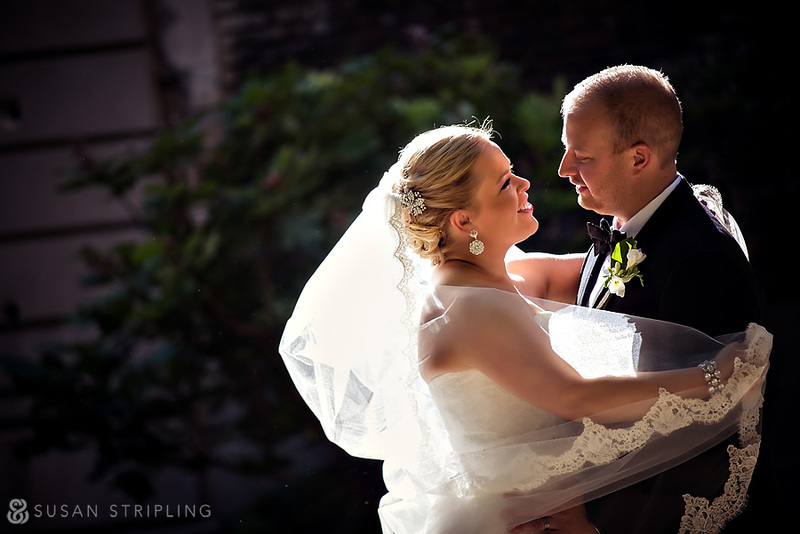 I shot there for the first time in the summer, and the next wedding I shot there was also on a hot summer day. 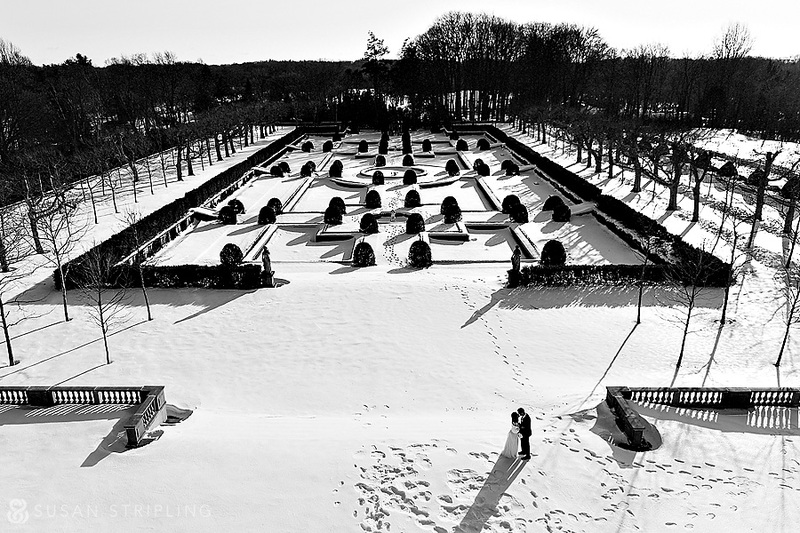 While Oheka is flawless in warm weather, it’s absolutely magical in the snow. The air was crisp and the light was brilliant. 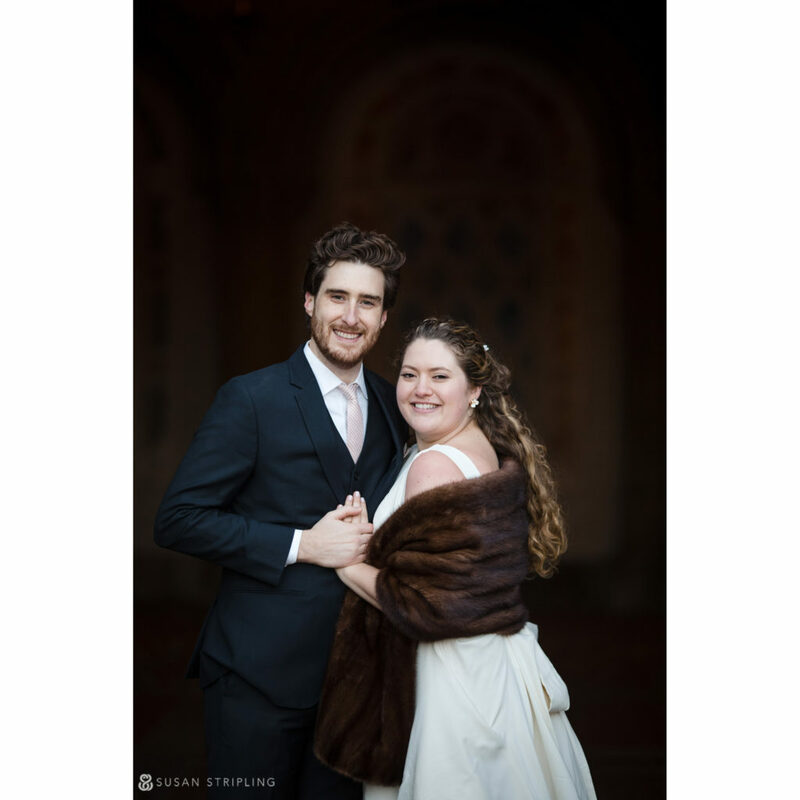 Add to that an amazing, deeply in love couple who was willing to brave the single-digit weather for some outdoor portraits, and you’ve got the perfect wedding to begin the 2015 wedding season! 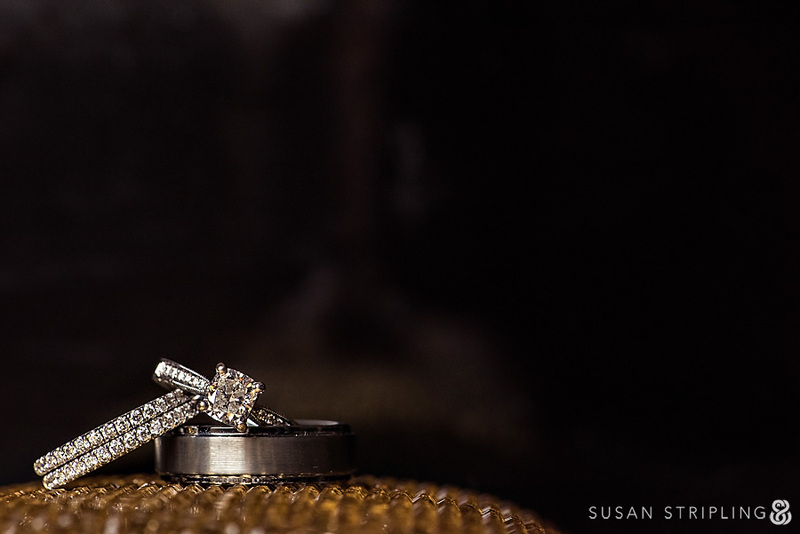 I started the day with the bride and groom’s wedding rings. 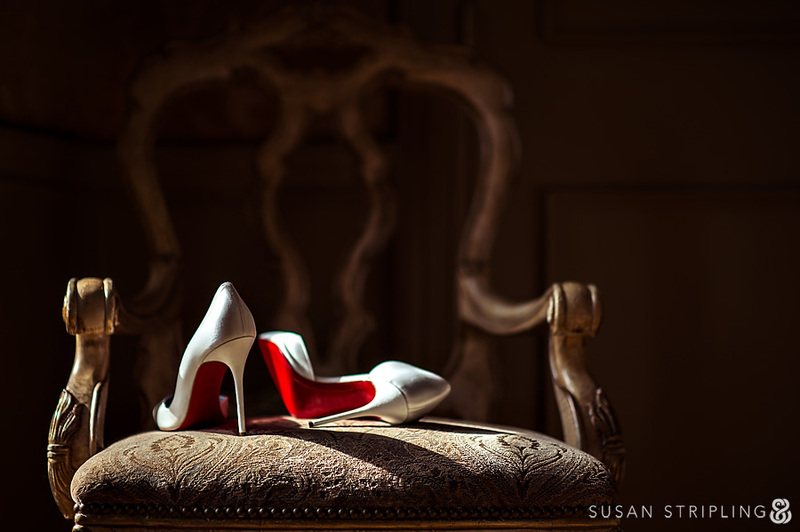 The beautiful swoop of white in the background is the delicate arch of Guzey’s pristine Christian Louboutin wedding heels. 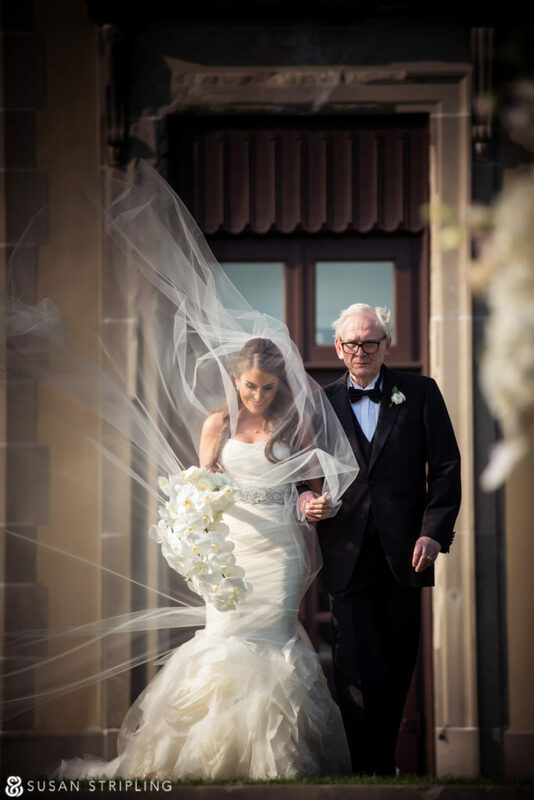 The bride’s Reem Acra dress was flawless. It almost makes me want to get married again, just to wear THIS dress. 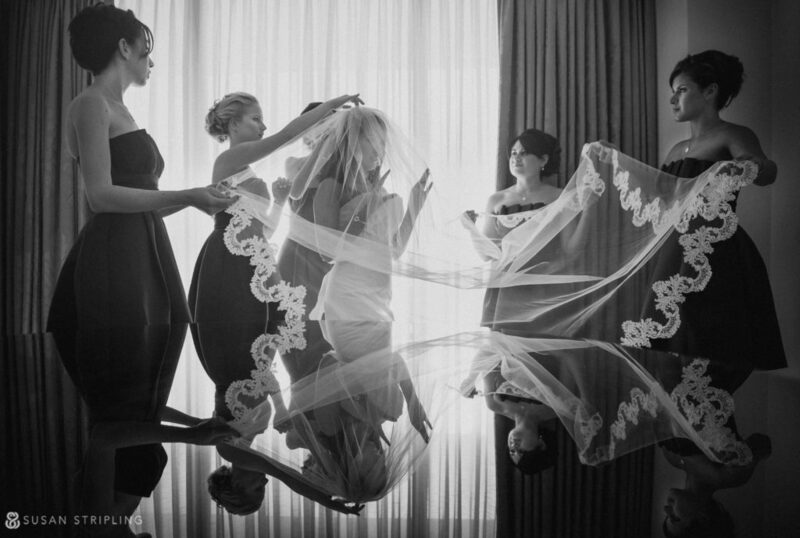 The bride was surrounded by the women she loved the most while she got ready. 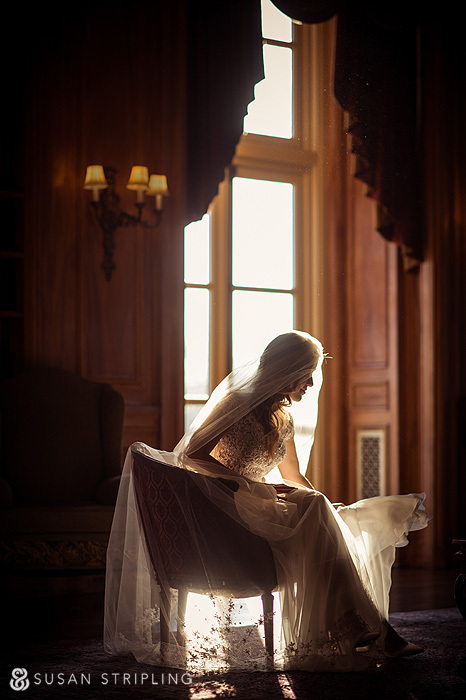 The Oheka Castle bridal suite is phenomenal, and gets the most exquisite light. 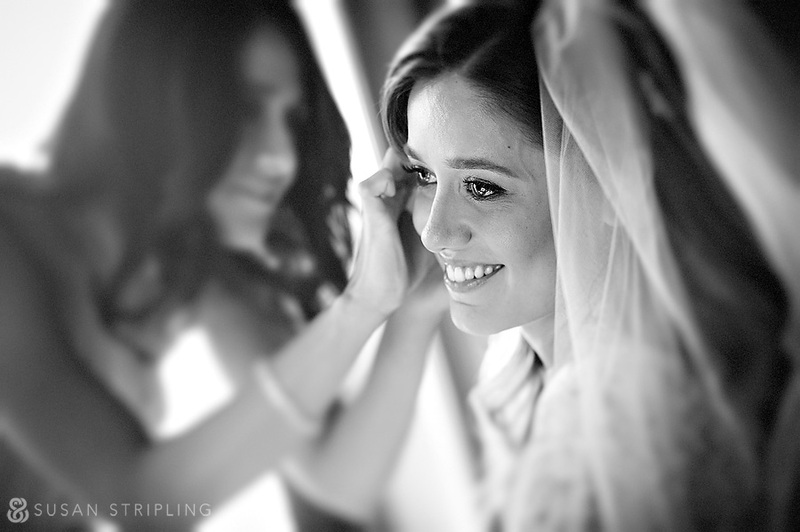 The bride’s getting-ready robe was really beautiful. I loved the vintage lace trim. 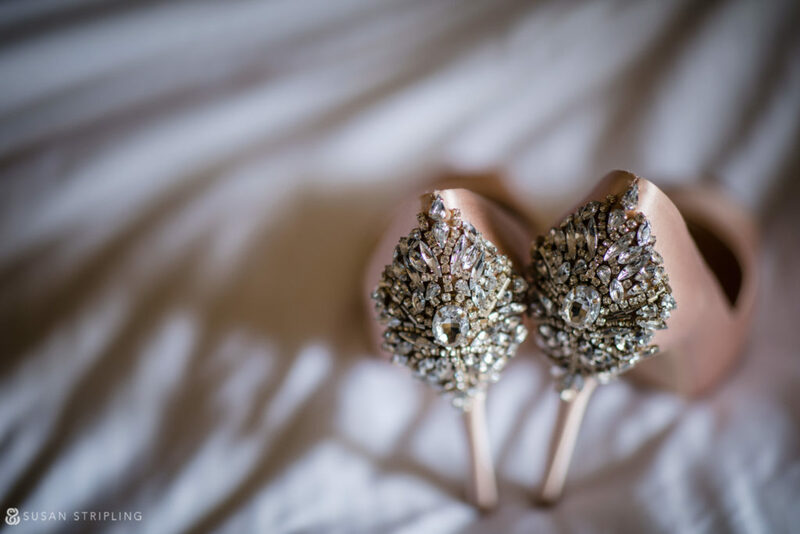 It seems like I see the same wedding shoes week in and week out, but these Christian Louboutin heels really made me sit up and take notice. They were so architecturally crisp and sleek. 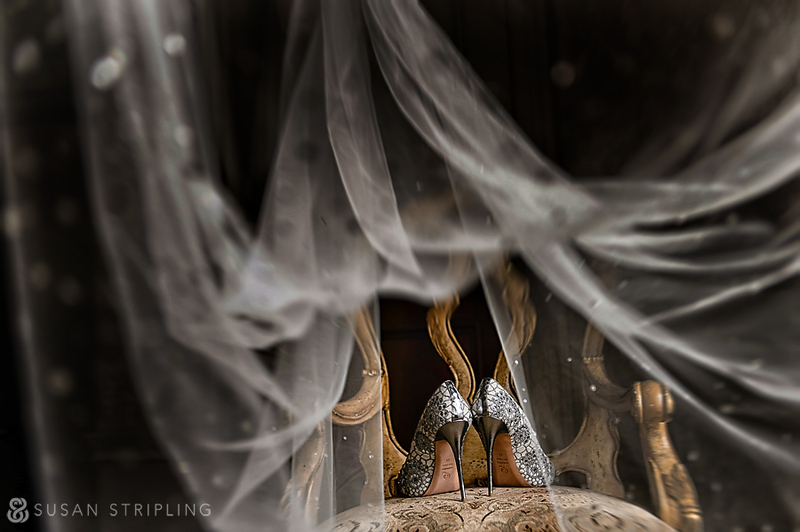 I’d want some for myself, except for the fact that there is NO WAY I could ever walk in them! 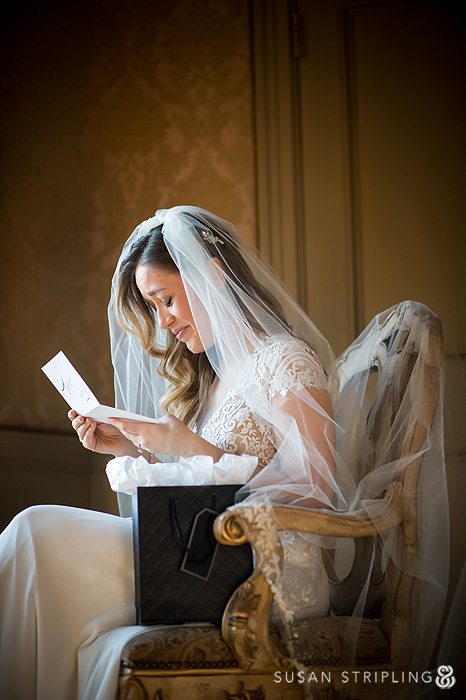 I’ve mentioned several times on this blog how much I adore the bridal suite at Oheka Castle. 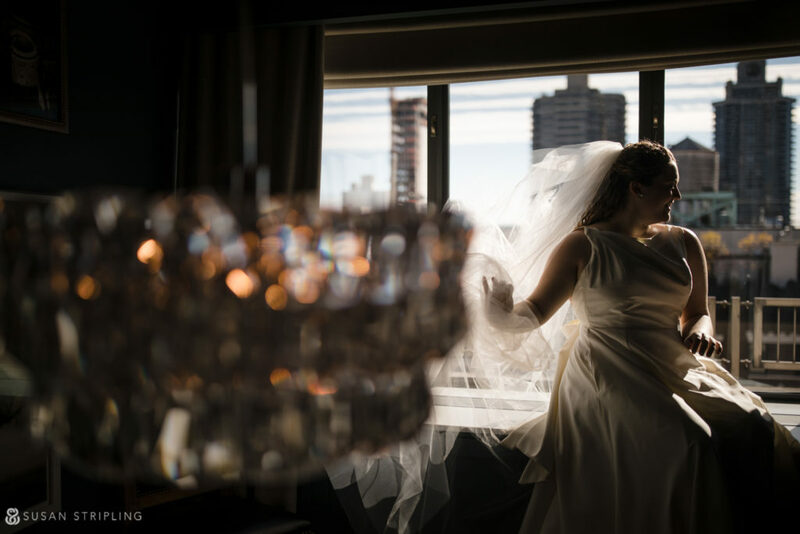 They have an actual stage for the bride to get ready on, right by beautiful windows. What more could I ask for? 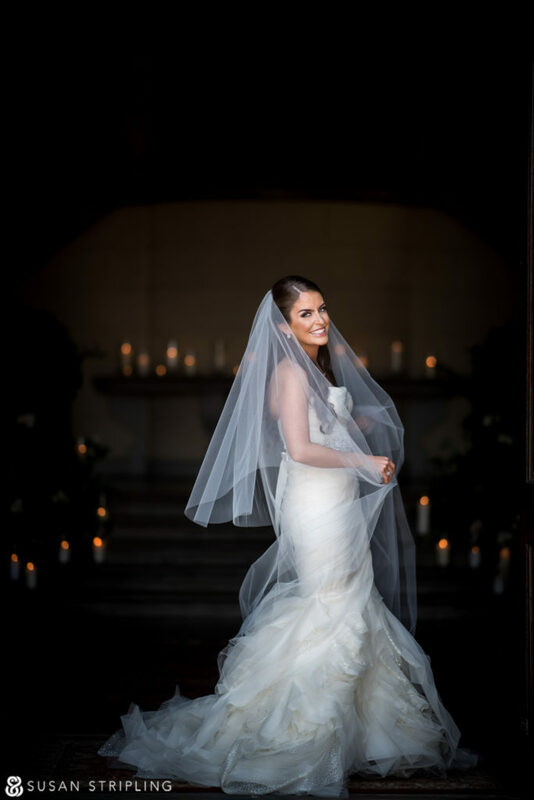 Sally Perez and Sally Duvall did a wonderful job with Guzey’s sweet, simple wedding day look. I love that she left her hair down, and I LOVE that Reem Acra dress! 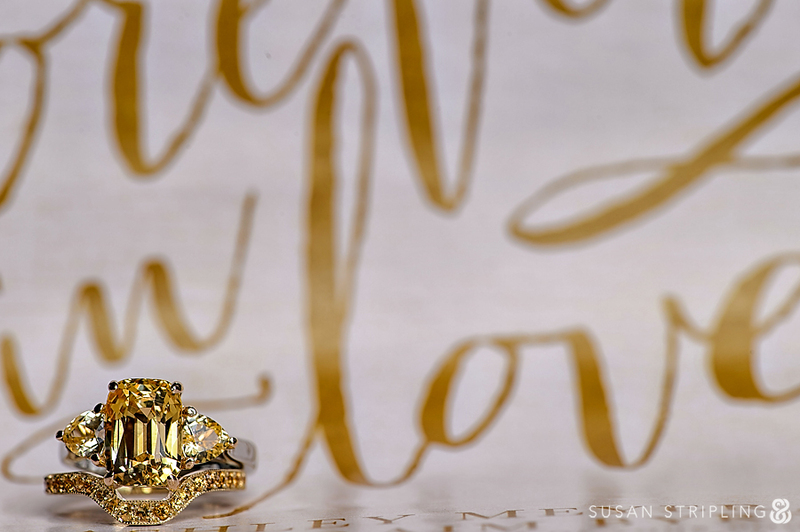 The bride and groom exchanged gifts before the ceremony. I love her reaction to his letter! Guzey is bright and beautiful, kind, and so so sweet. She has one of the most beautiful faces I’ve ever seen, and it was a joy to photograph her! Guzey gave Ali a watch for a wedding gift. I think he liked it! 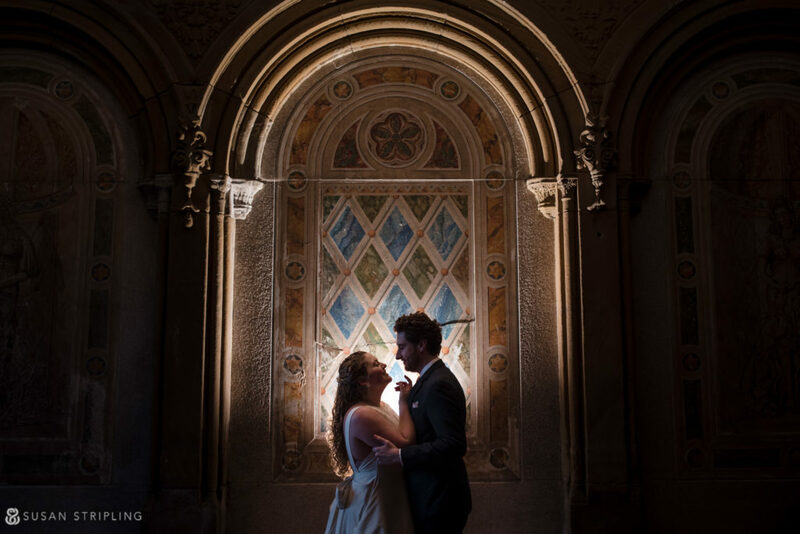 I love the portrait time for any wedding at Oheka Castle. There is such gorgeous light everywhere, so many beautiful places to shoot, and it’s amazing whether you’re indoors or outdoors. 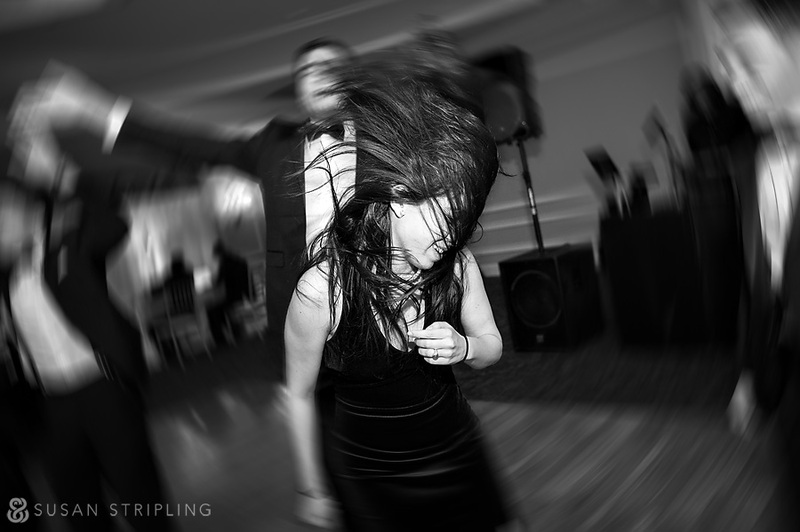 I strive to make a picture at every wedding I shoot that I’ve never made before. I get overwhelmed by emotion, and the interaction of friends and family members. 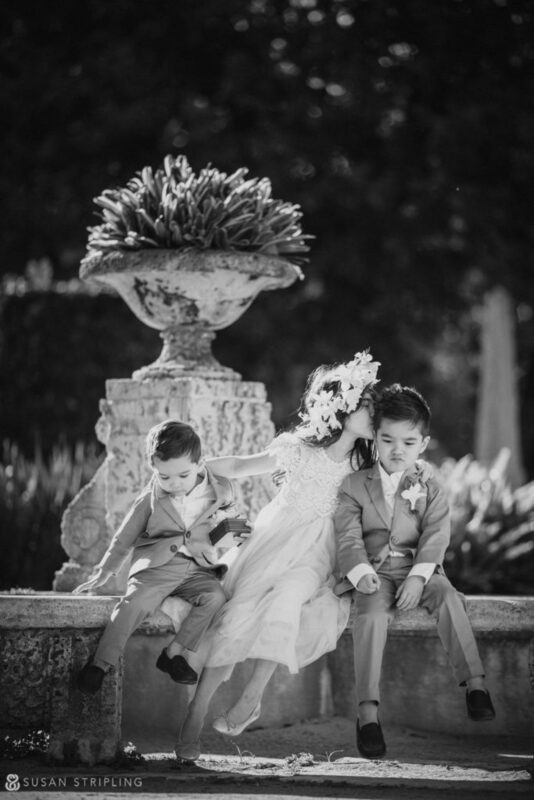 This image of Guzey with her sweet ring bearer is a picture that I’ll remember for a long time. The light! The moment! 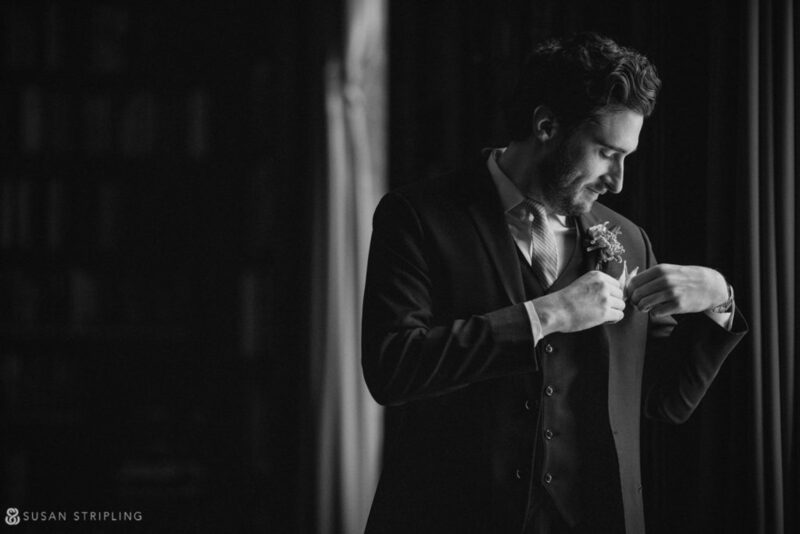 Everything came together perfectly, and it was an honor to document it. Pretty sure it was about six degrees outside when we took this picture. 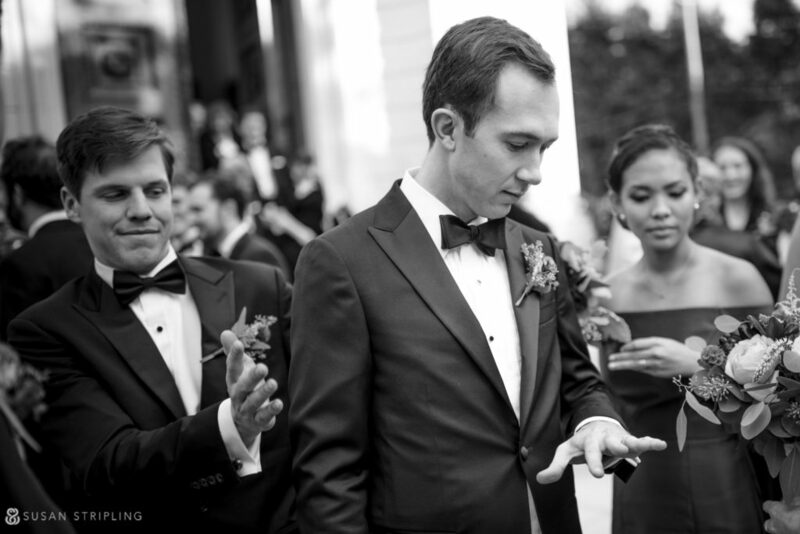 I was on the balcony of the bridal suite, and I was communicating with the bride and groom by texting my assistant, who was in the library. Whatever it takes! I can’t believe how cold it was outside. I also cannot believe how brave Guzey and Ali were! I never want a client to be uncomfortable, and I kept telling them that we could shoot indoors if they didn’t want to be out in the winter chill. They were total troupers, and for that I thank them! 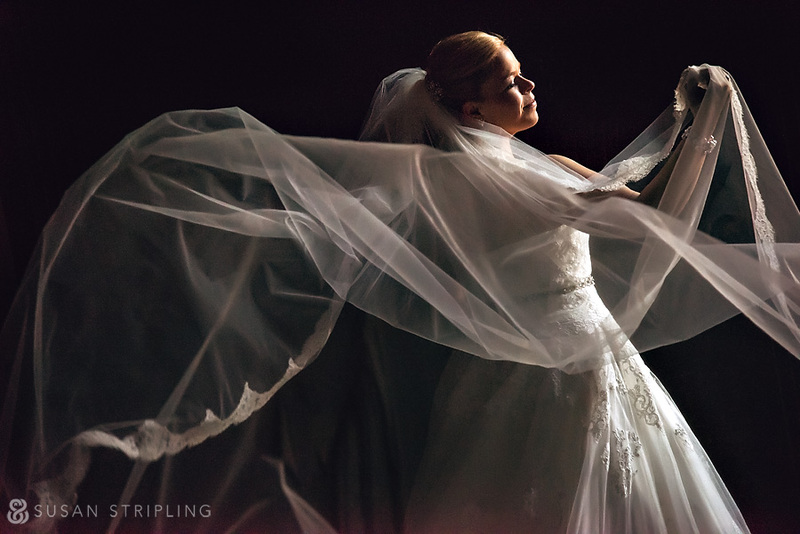 What really makes a wedding photographer skilled is his or her ability to make beautiful pictures anywhere, both indoors and outdoors. 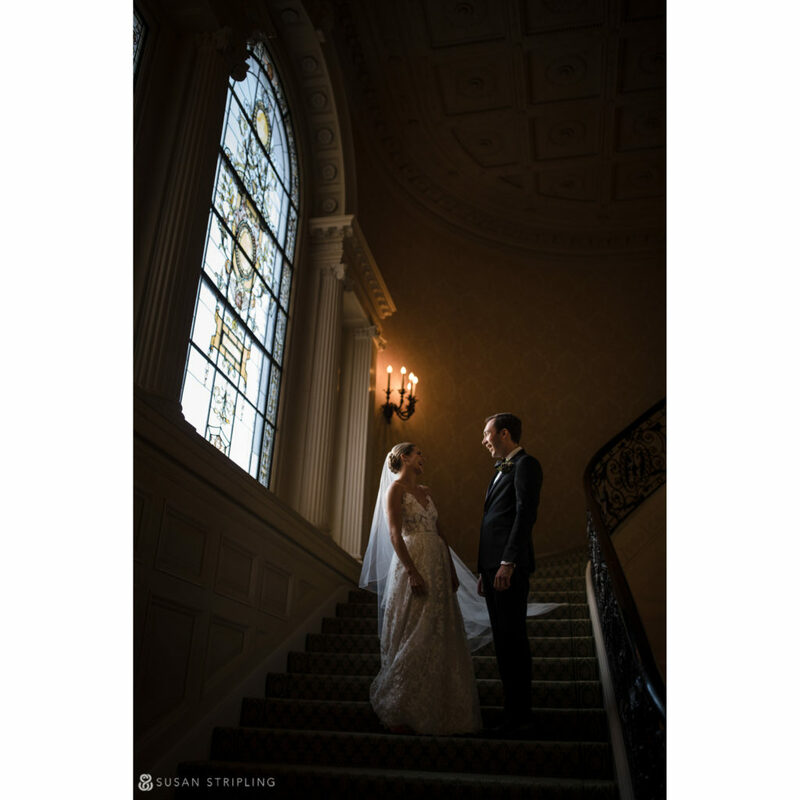 I love shooting indoors, and Oheka Castle makes it really easy! 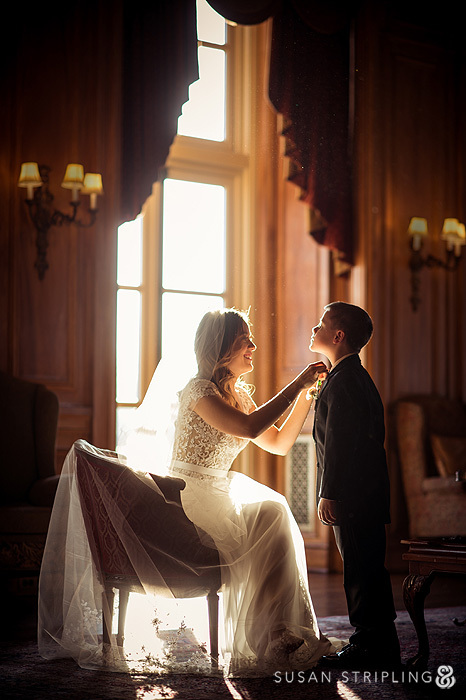 There are so many opportunities at Oheka to create different, dynamic portraits. 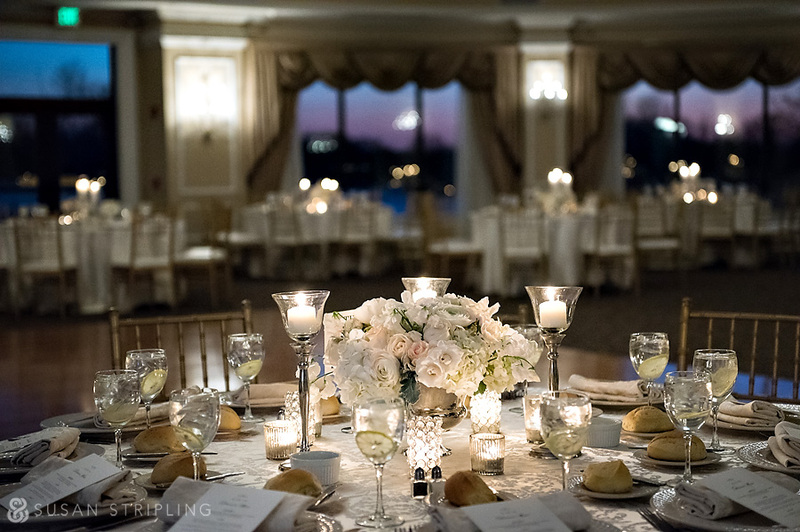 One of the lovely things about Oheka is the light, both indoors and outdoors. As the sun dips lower in the sky, the light spills over the gorgeous wooden floors and is simply luminous. 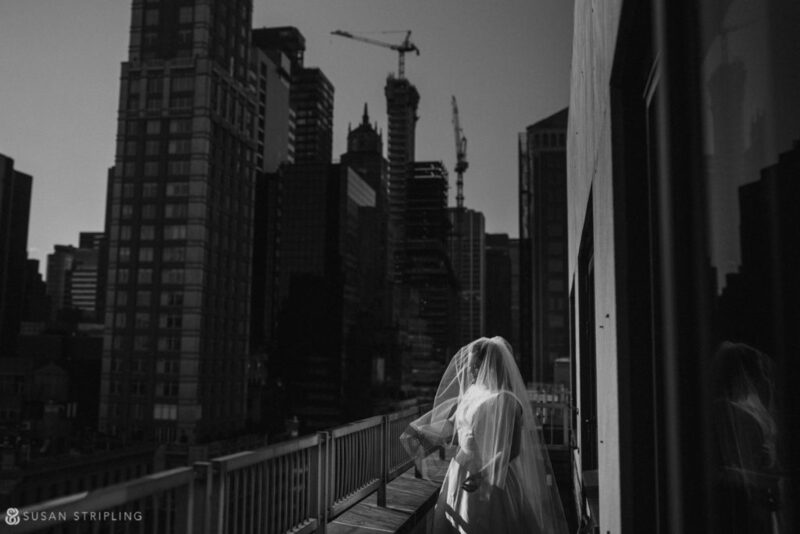 I love this quiet image of the bride alone before the ceremony. …and here is the same moment, a few seconds later, from another angle. See? Gorgeous light! 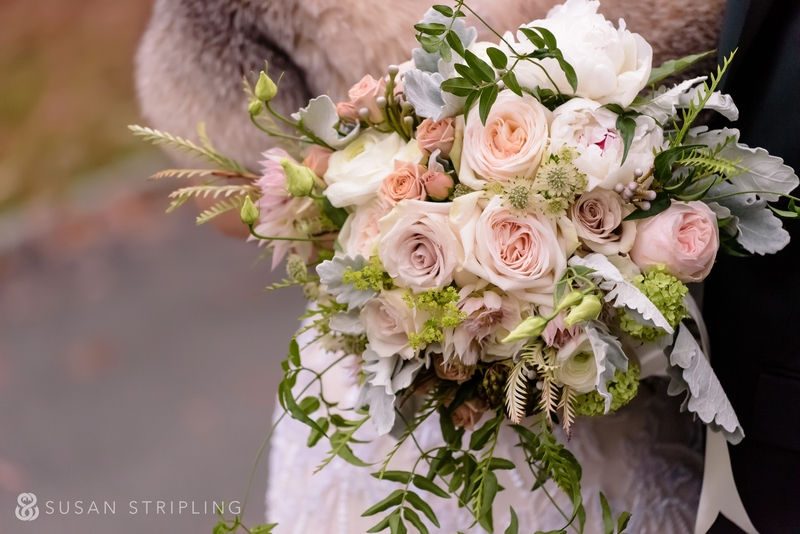 The bride’s bouquet was so gorgeous, and it perfectly suited her dress and the rest of the decor. 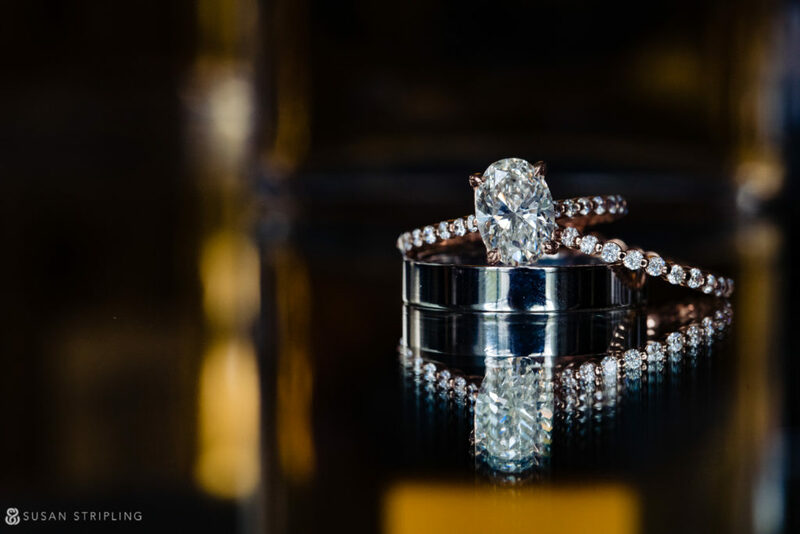 I try to always check the bride and groom’s wedding bands to see if there are any engravings! 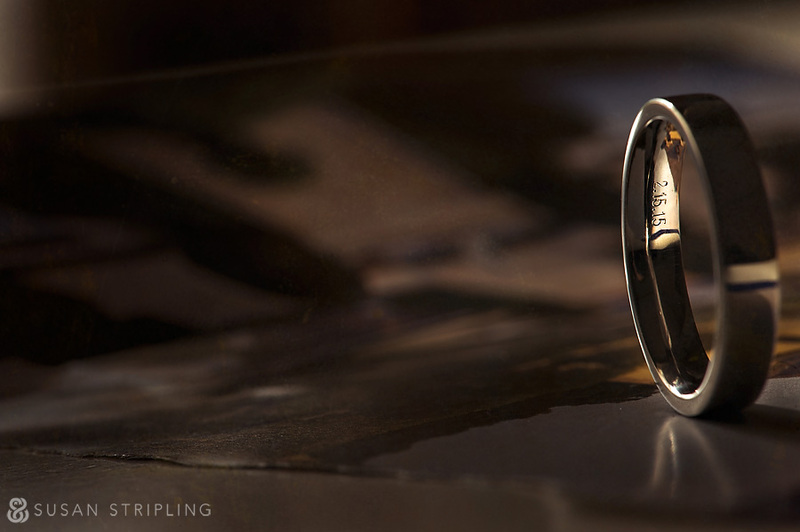 Engraving in wedding rings is such a wonderfully personal part of the details. 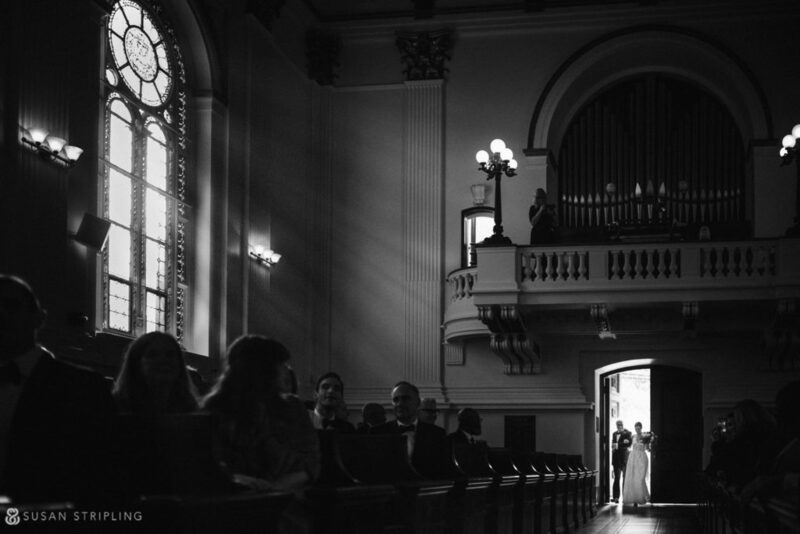 The light was perfect at the start of the wedding ceremony. 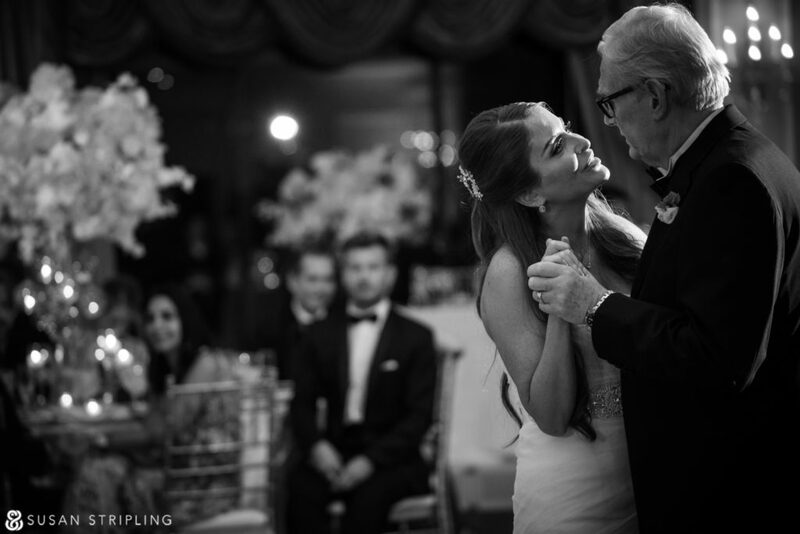 I love how it perfectly illuminates the face of the bride’s father. 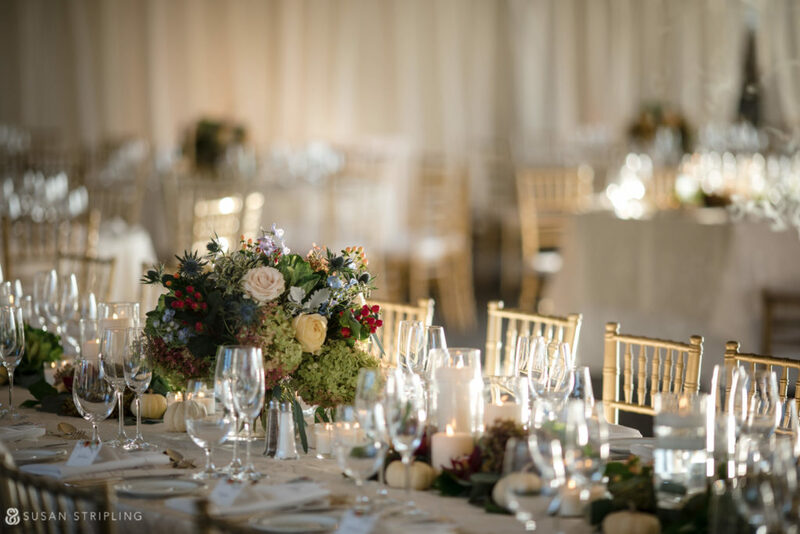 This gorgeous room was kept simple, which really drew your eye directly to the bride, groom, and their emotional wedding ceremony. 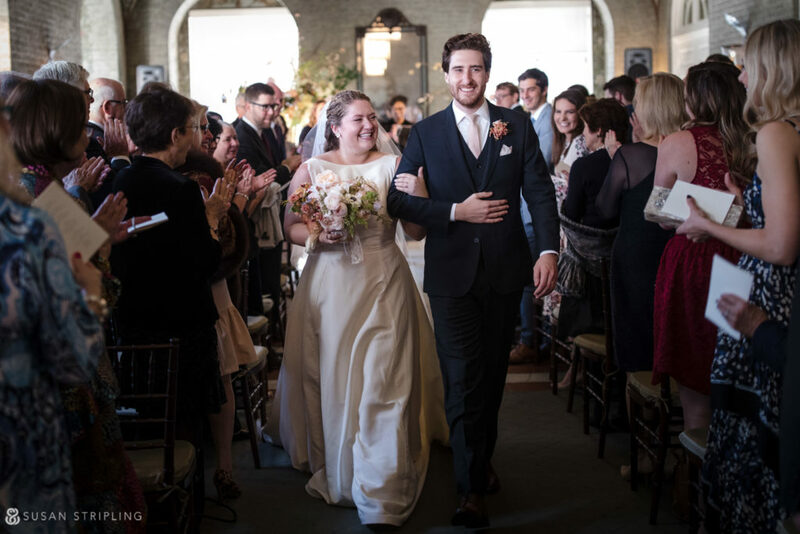 The recessional at the end of a wedding ceremony is one of my favorite times of the wedding day. 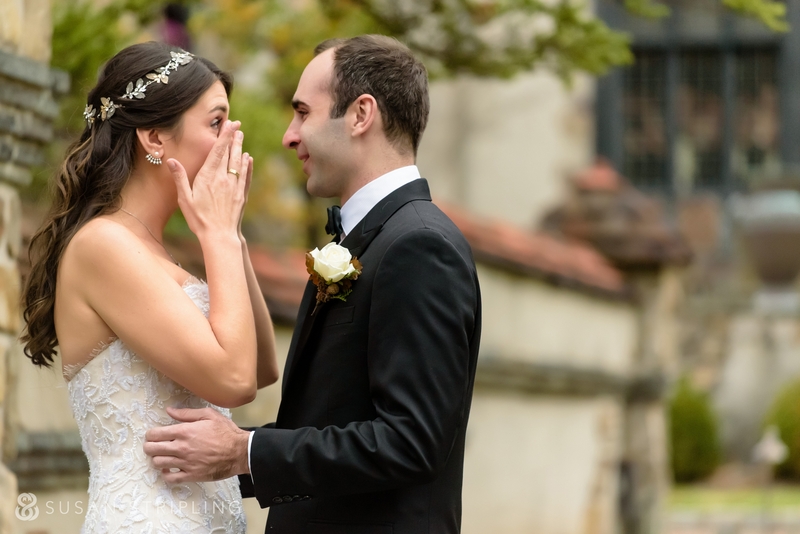 This is the first time the bride and groom are seeing many of their guests, and the facial expressions are always great! 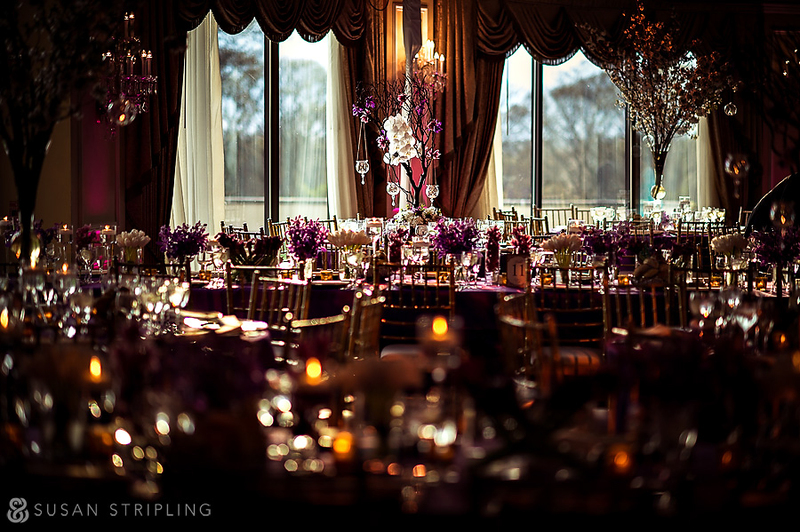 I love the Oheka Castle wedding ballroom. I especially love that the sunset is so beautiful and purple through the windows! 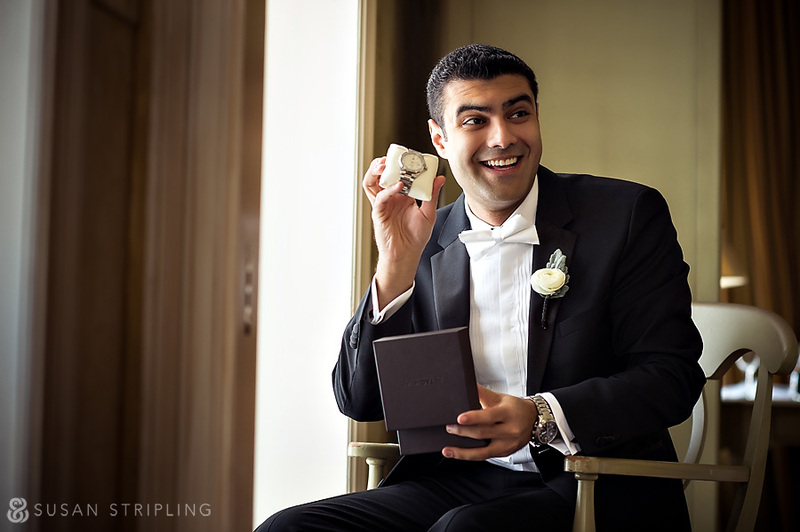 Ali was such a wonderfully expressive groom! 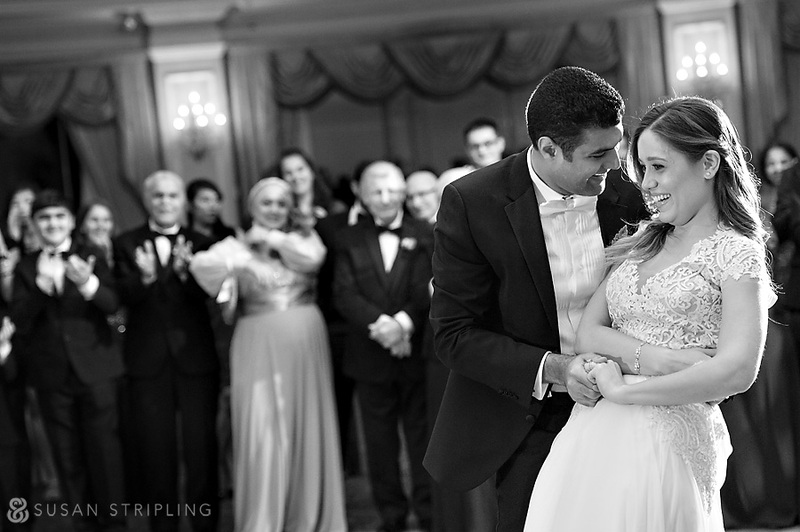 I love shooting into the crowd during the first dance. 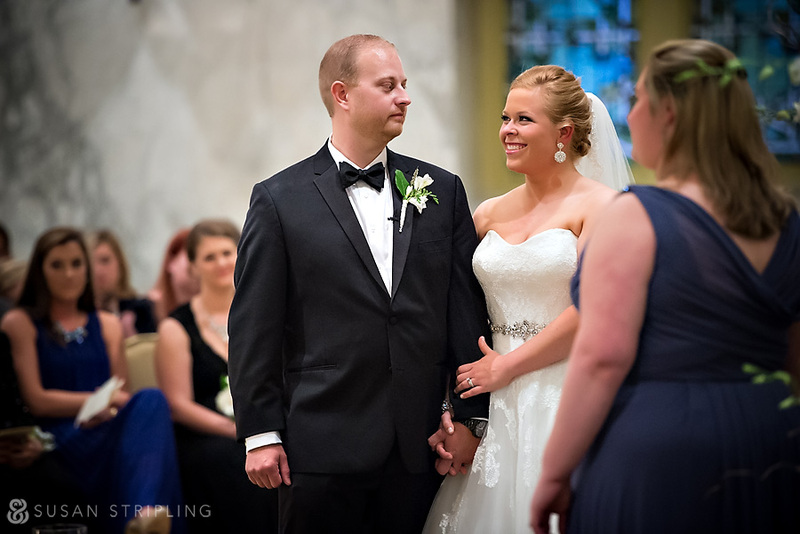 You can see the guests’ reactions behind the bride and groom, and I think that makes the images even more personal. 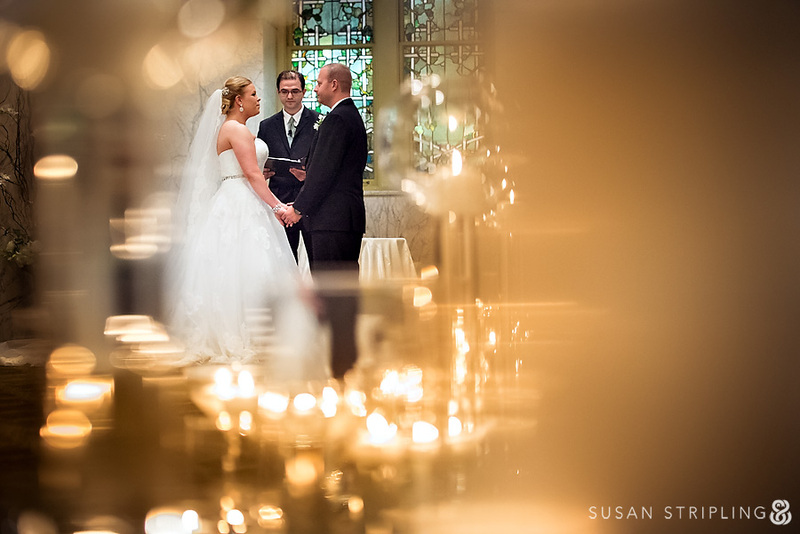 I love that you can see the groom’s father and sister in the background. They are so dear to him, and such an important part of the day. The DJ was great, and kept the crowd on the dance floor all night. Especially this woman! 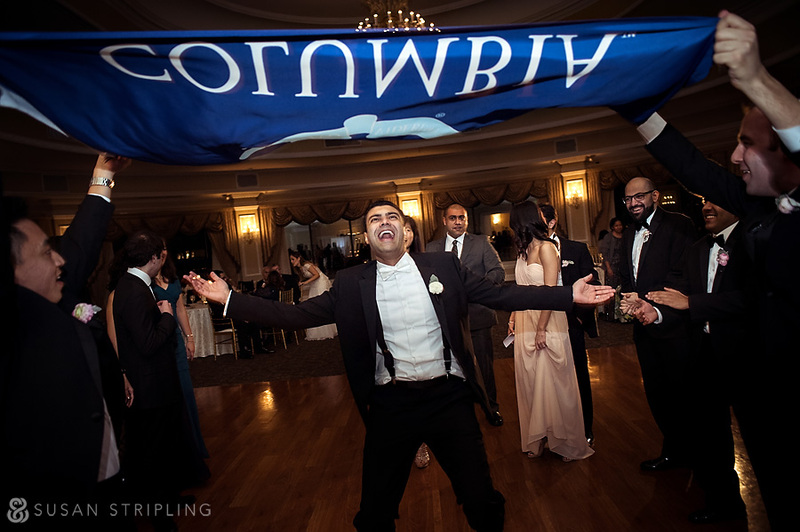 Shortly after taking an alumni photograph with the Columbia banner, it was used for a quick game of limbo! 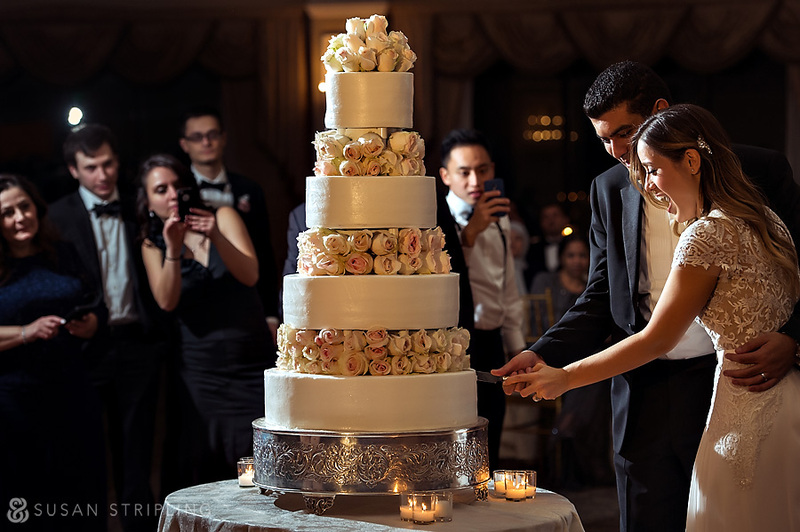 The cake was taller than the bride and groom! 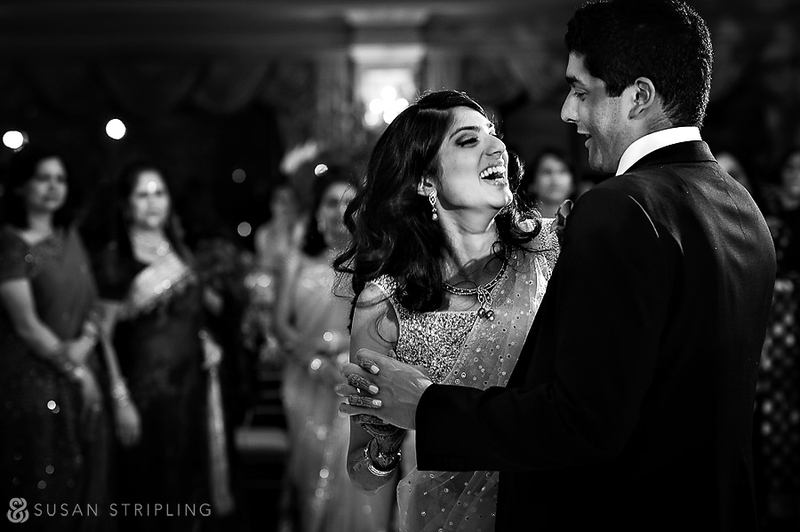 Again, I just love shooting into the crowds whenever possible to capture the reactions of the guests in the background. A candle burned all night as a tribute to Ali’s late mother. 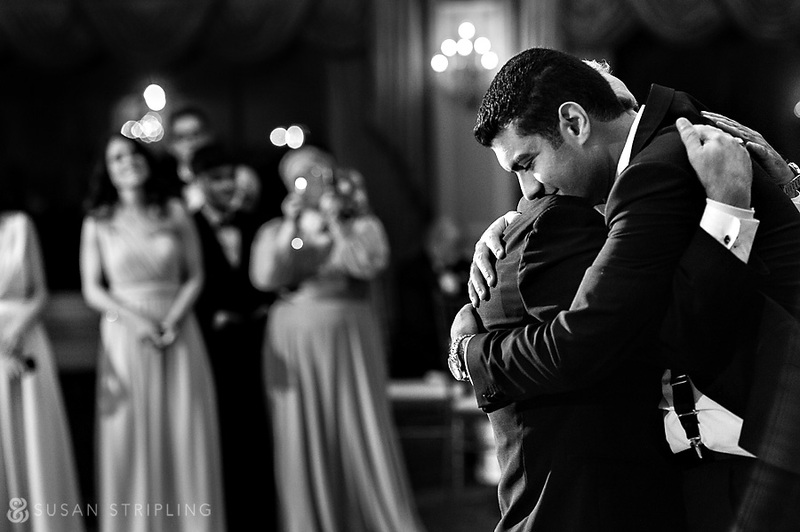 Instead of a mother/son dance, he shared a touching dance with his father. Guzey and Ali, it has been a joy getting to know you both. 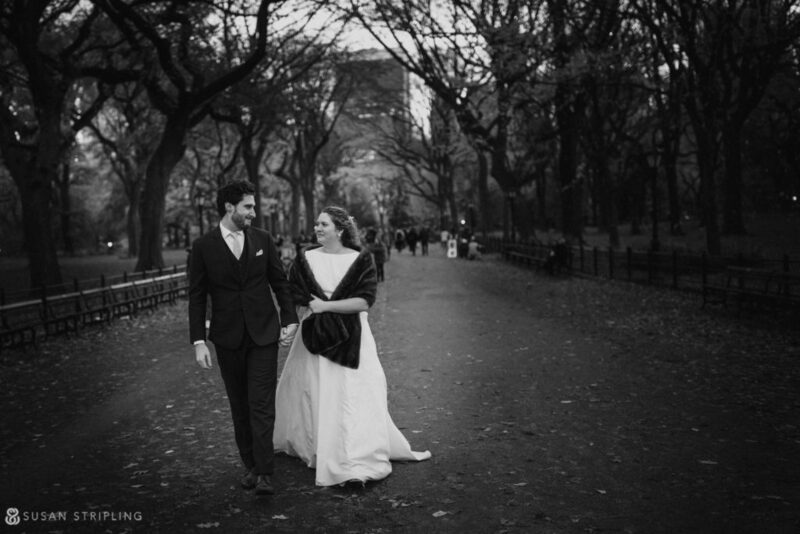 From our first meeting in my living room, to your engagement session in Central Park, I knew your wedding day was going to be warm and wonderful – and it was. It so was. Thank you for entrusting me with your memories! 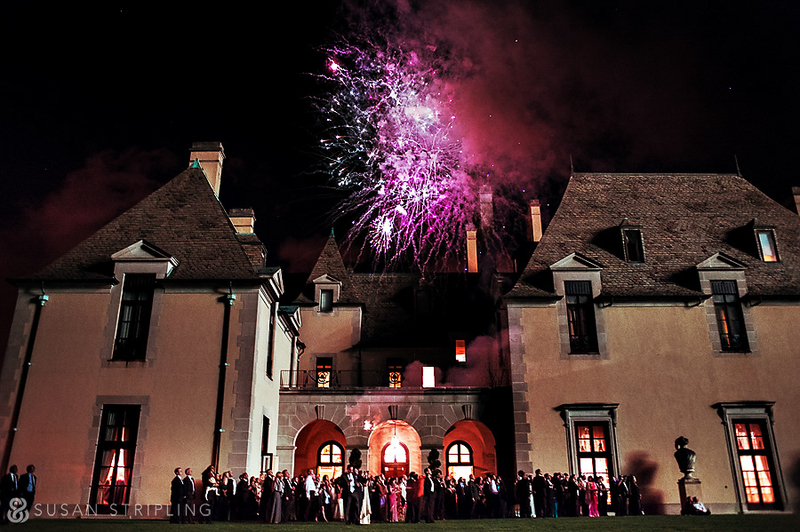 When my mind turns to an Oheka Castle Wedding, I never used to think of Taylor Swift. Oheka calls to mind television and the movies, having been featured in Citizen Kane, Gossip Girl, and Royal Pains. But Taylor Swift? 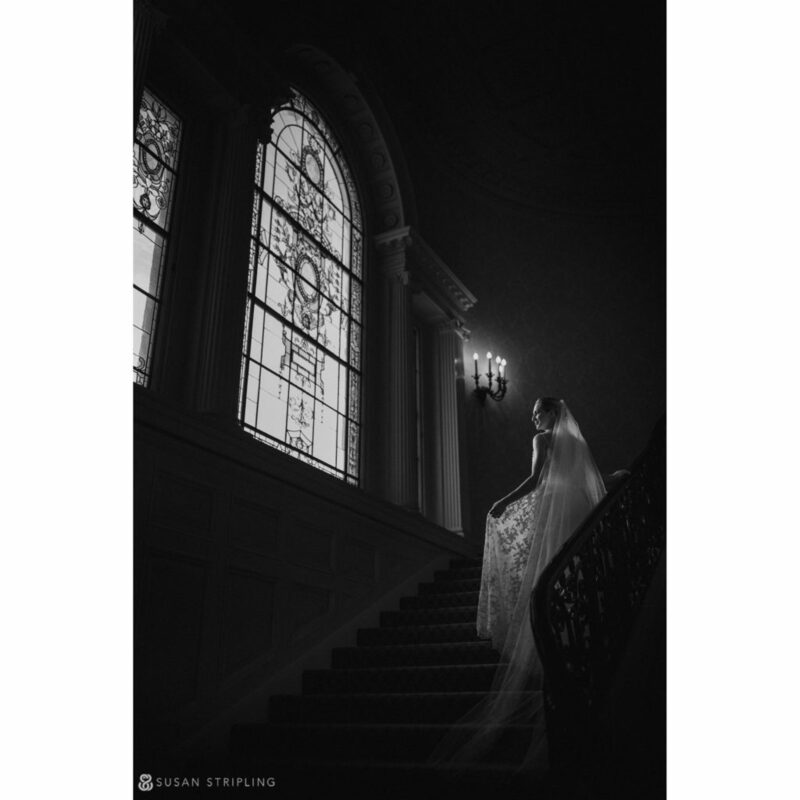 Not until recently, when she took over the Huntington, New York wedding venue to film the video for Blank Space. 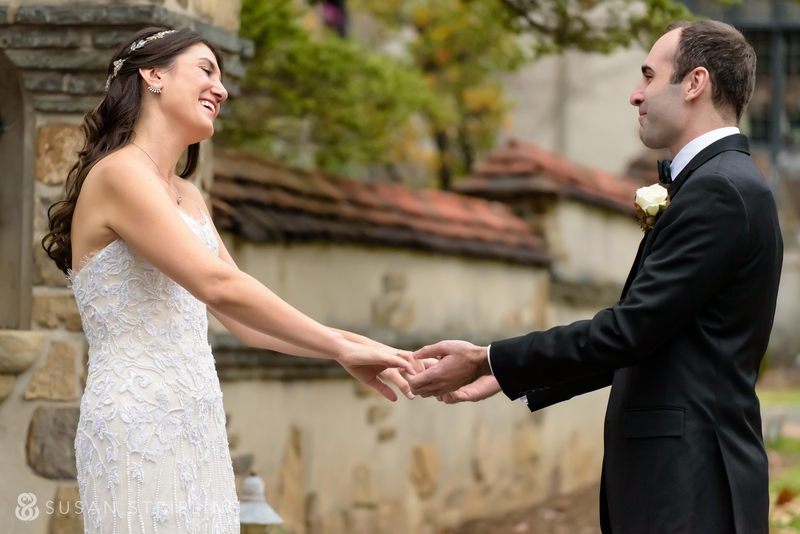 It was completely surreal to watch the video, seeing places like the Grand Staircase, West Gate Drive, Formal Gardens, and Grand Ballroom, places I’d photographed weddings at for several years now. 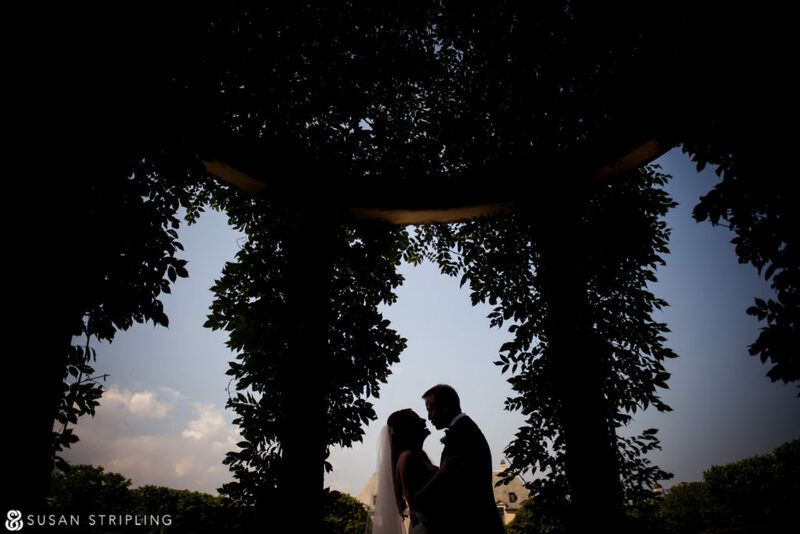 I was most recently at Oheka for Shella and Jamil’s completely flawless summer wedding. Gold glitter was everywhere, the Formal Gardens were awash with summer sunshine, and a Haitian band played well into the night. I can see why Taylor Swift was drawn to Oheka. There is something so magical about a castle that appears out of nowhere (if you’ve ever driven up to Oheka, you know what I mean!) 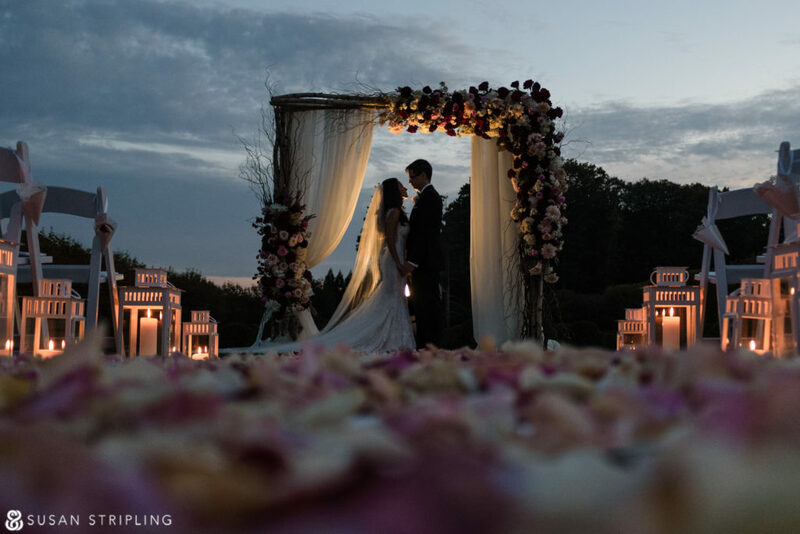 It was no wonder that Shella and Jamil chose it as their wedding location, as it really is that charming. 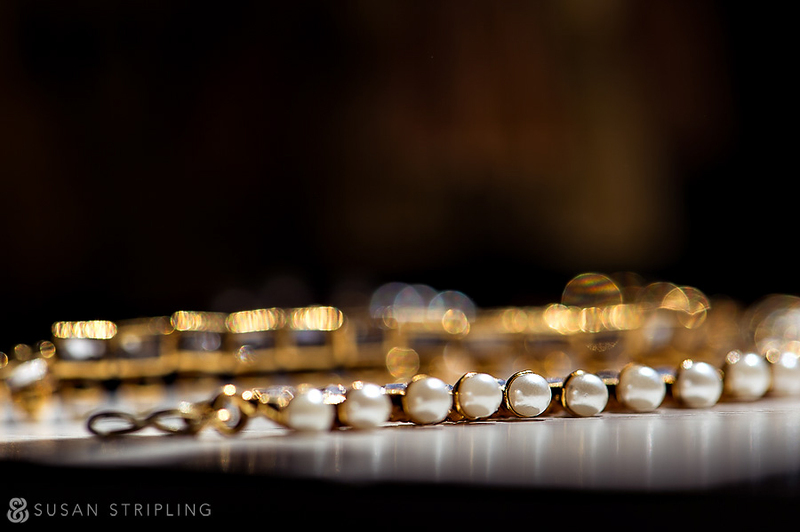 I started the day with Shella’s beautiful details. Her attention to the tiniest element of the day was really unparalleled. 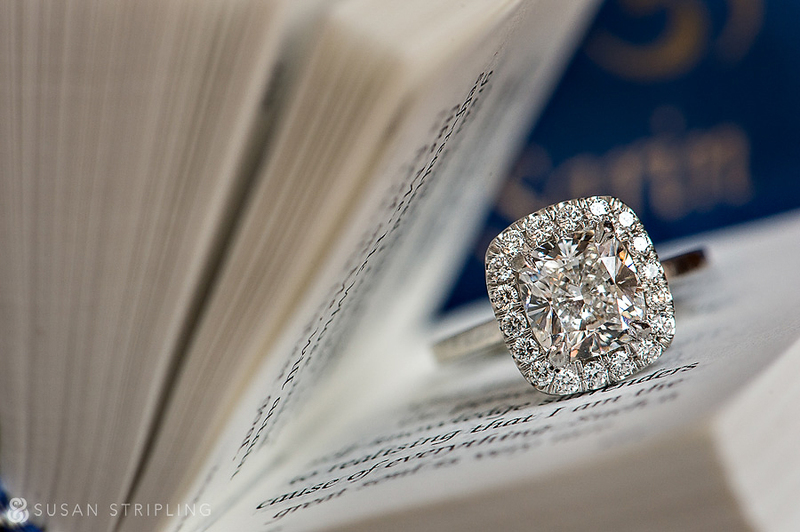 Is her engagement ring not incredible? And how about that wedding band? See what I mean about gold glitter EVERYWHERE? The team from Coordinated to Perfection did an extraordinary job creating and executing the day. 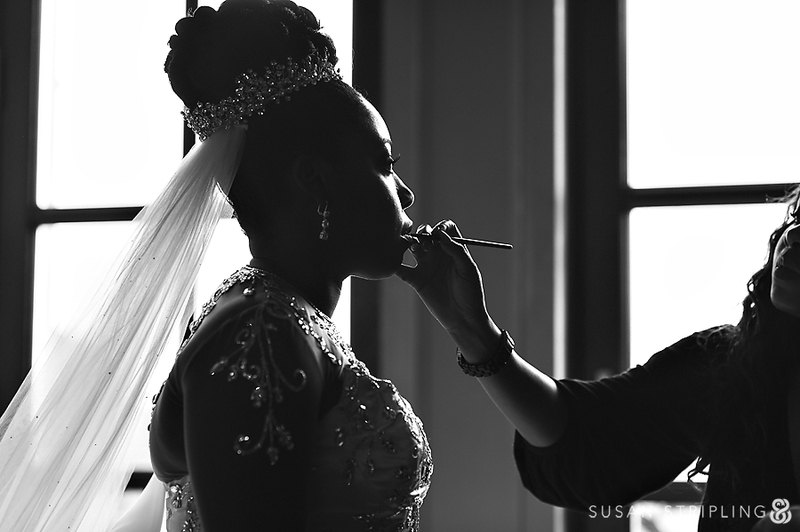 The Green Room and Shameika Bowman were on hand to create Shella’s wedding day look. 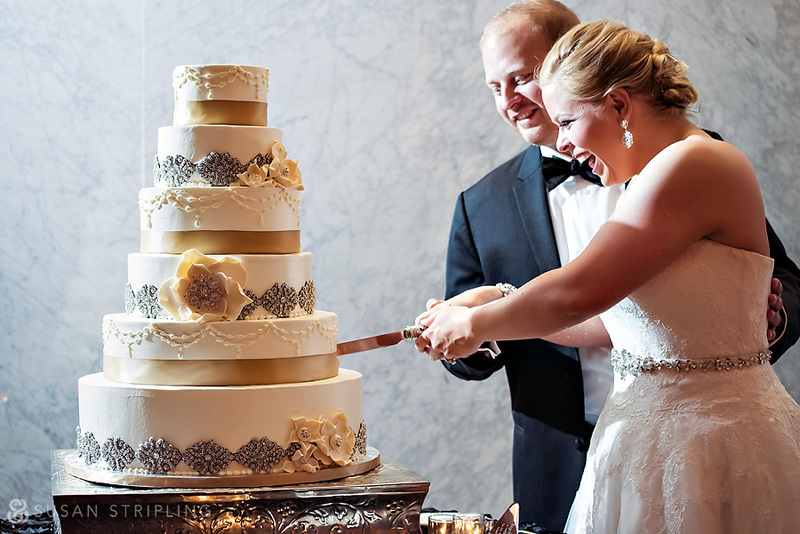 Her dress was so outrageously fantastic, her hair and makeup had to match – and match they did! 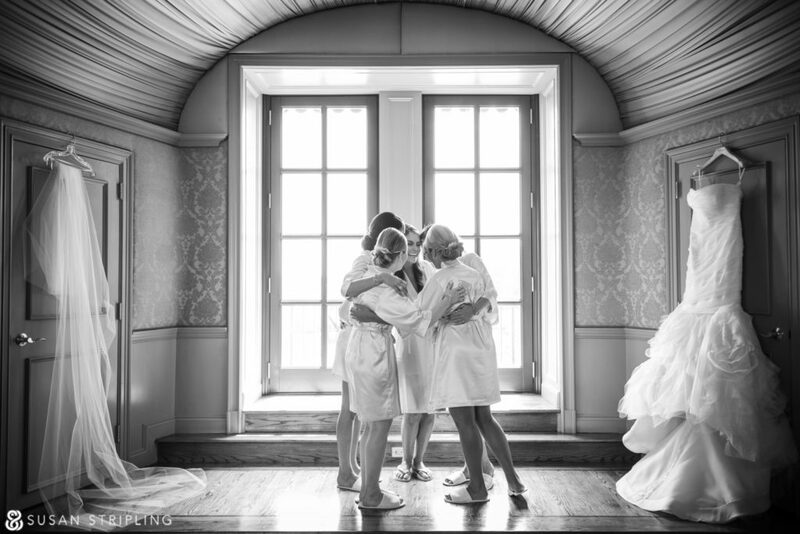 The bridal suite at Oheka Castle is one of my favorite rooms in the entire venue. I love the drapery framing the french doors. 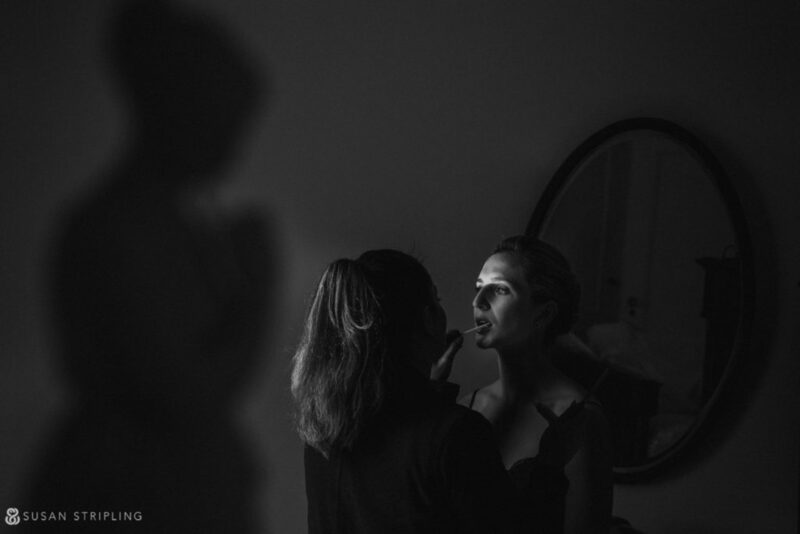 I also love that the light is perfect in there, no matter what time of day you’re getting ready. 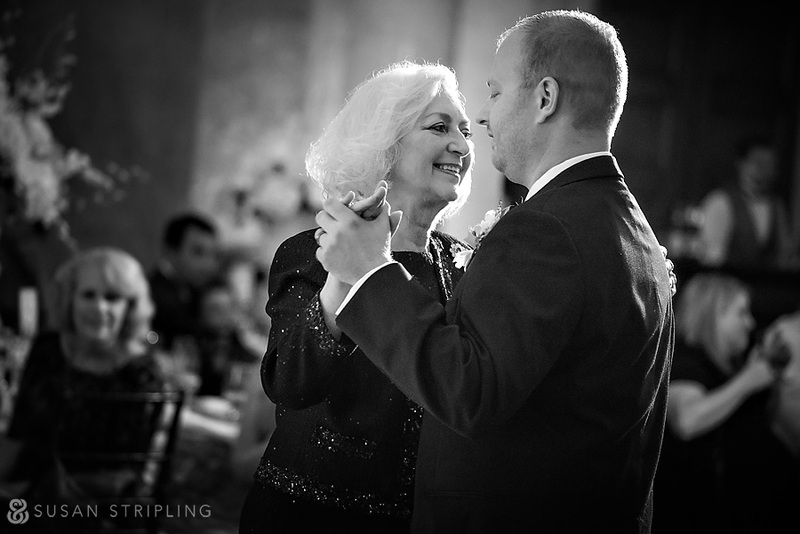 The bride’s mother was so elegant. 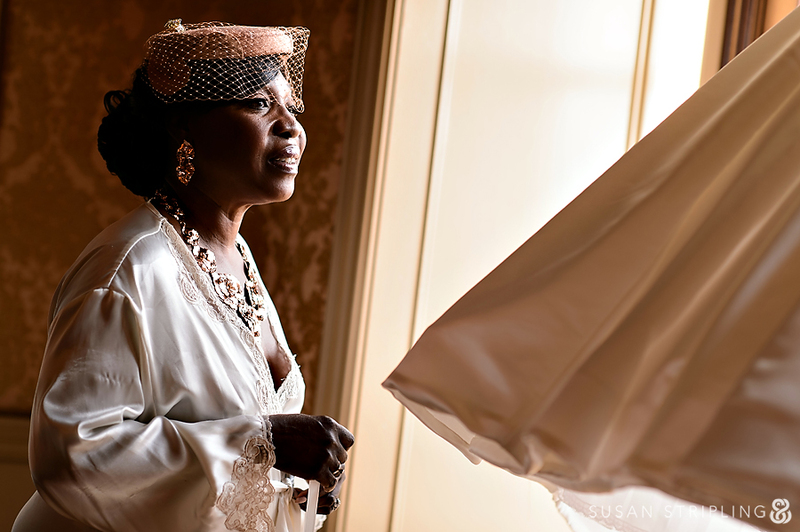 I adore her pillbox hat and veil. She was the picture of class and grace all day long. 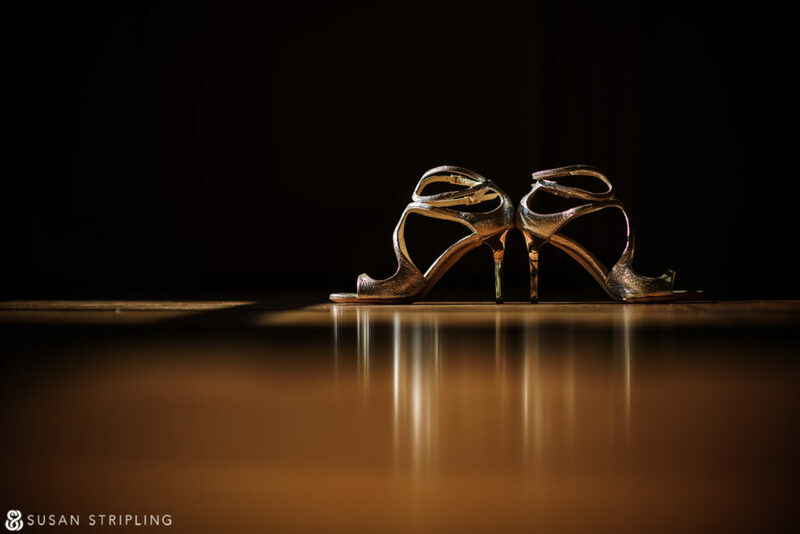 The bride’s Alexander McQueen shoes were completely flawless. 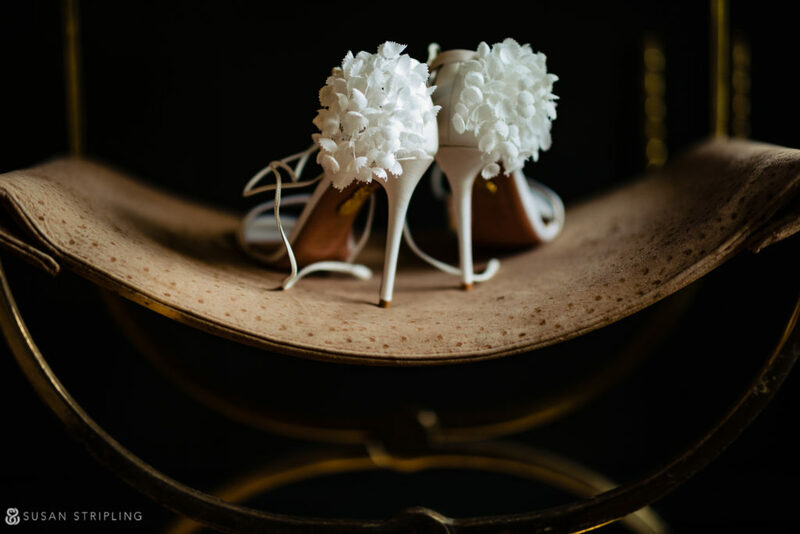 McQueen is one of my biggest inspirations, and I always love to see elements of the edgy-yet-classy McQueen style incorporated into a wedding day. 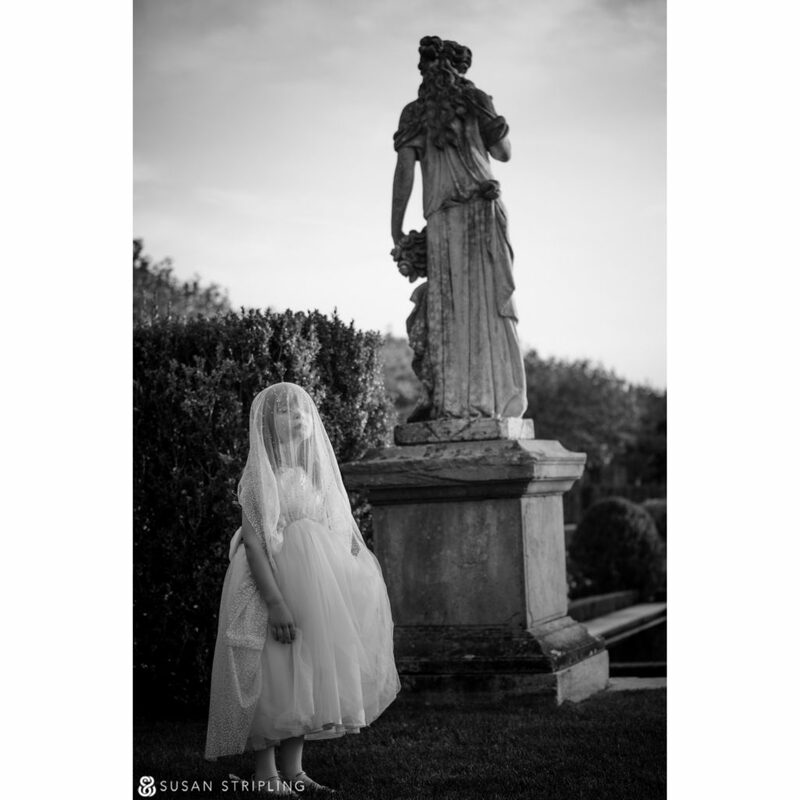 An Oheka Castle wedding would not be complete without some portraits out and about on their iconic grounds. West Gate Drive leads right up to the main courtyard through these gorgeous arches. The Formal Gardens overlook the sprawling Oheka Castle. 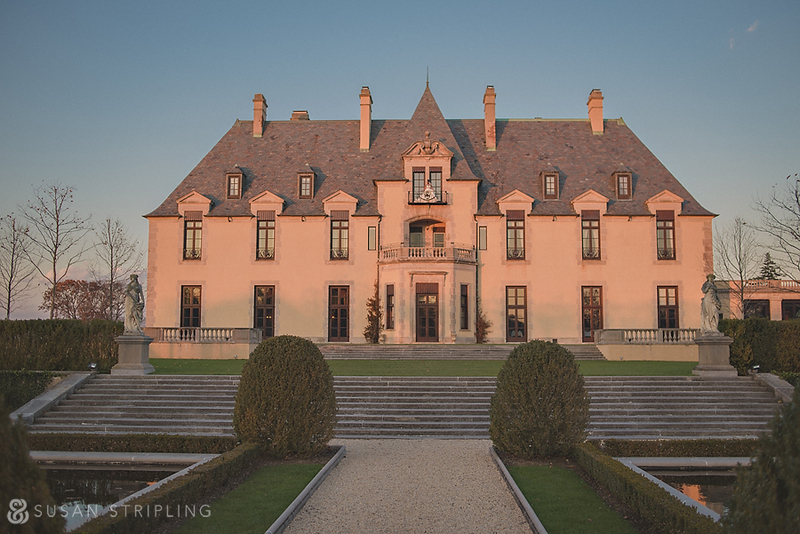 Rumor has it that Oheka was one of Baz Luhrmann’s inspirations for Jay Gatsby’s opulent Long Island mansion in his 2013 Great Gatsby remake. Shella stopped for a quick touch-up between portraits, then we were back out to the Formal Gardens for more portraits. 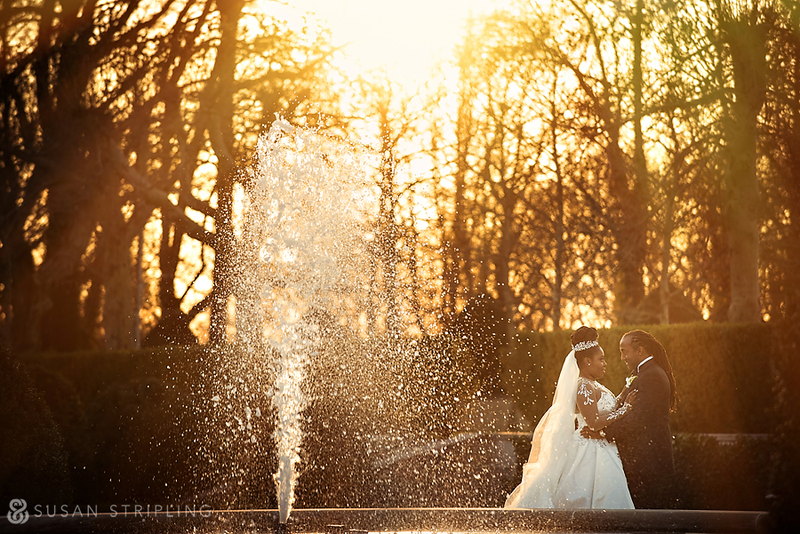 When the sun sets over an Oheka Castle wedding, everything is perfectly lit. The light skims across the Formal Gardens, deepens the shadows in the library, and illuminates the whole property with a really indescribable gold glow. 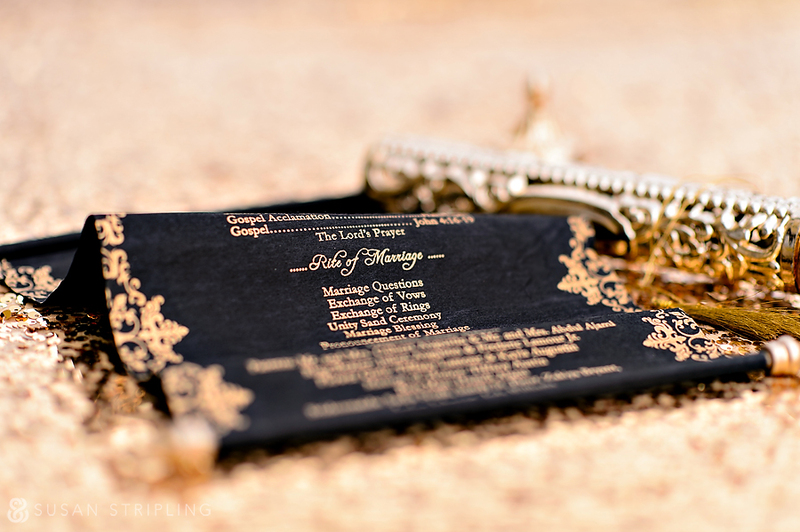 The programs were written on black parchment and rolled into these opulent gold scrolls. Beautiful, right? Shella’s dad was so sweet. 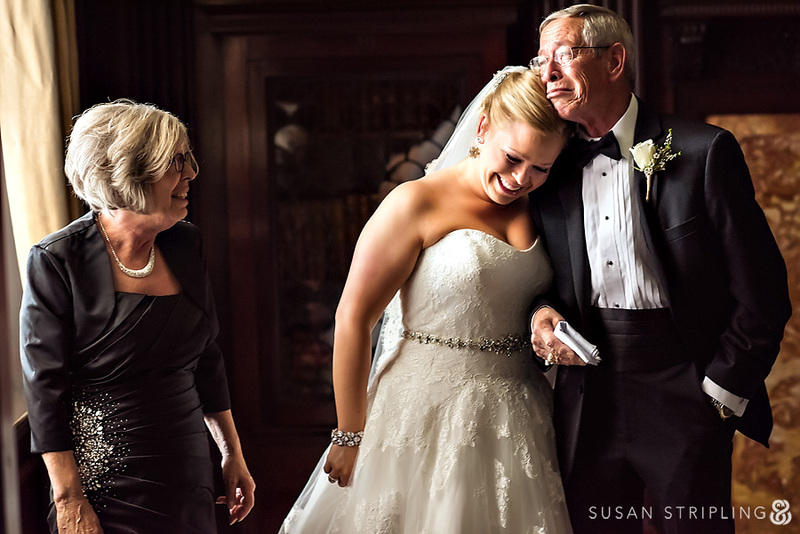 I love this image of him just after walking his daughter down the aisle. 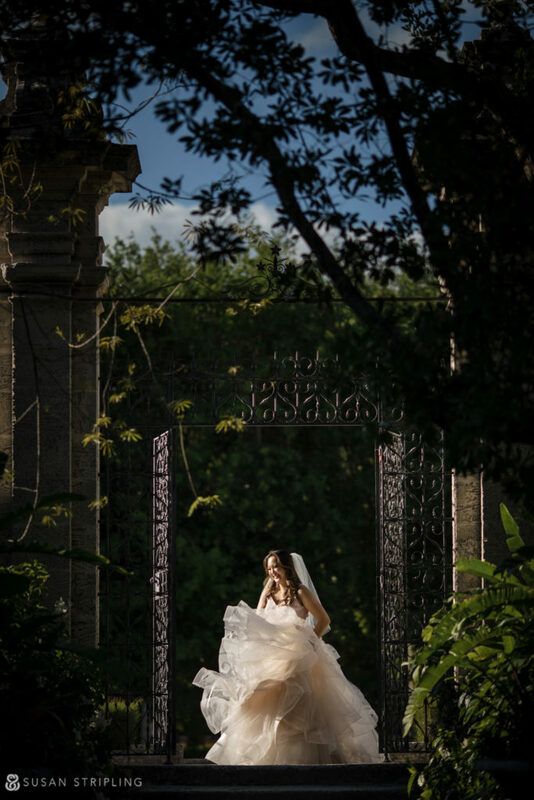 One of the lovely things about an outdoor ceremony is not being limited to where I can stand during the event. 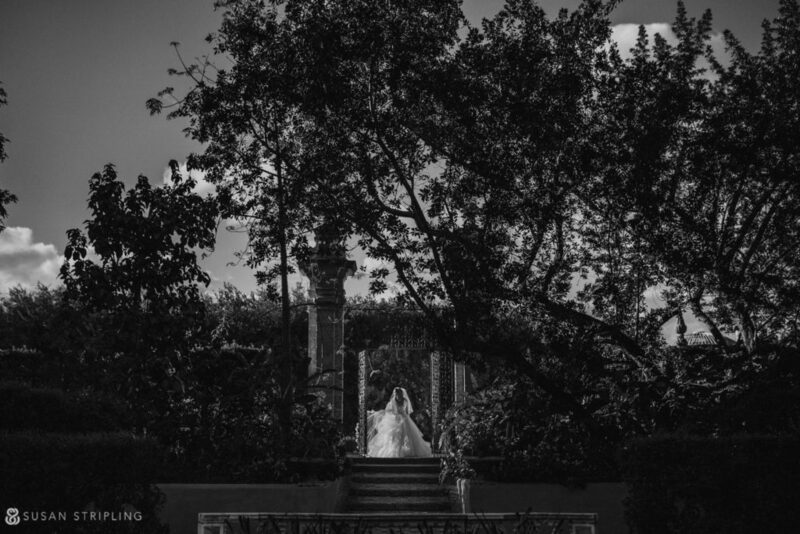 I love this vantage point of Shella and Jamil’s ceremony from down in the Formal Gardens. 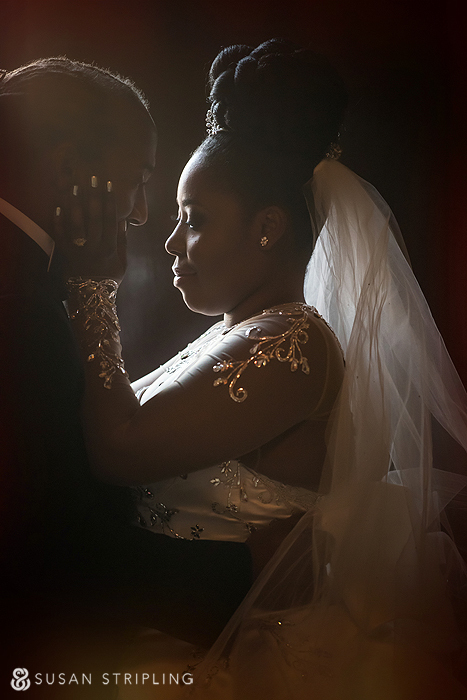 Shella requested pictures of herself and Jamil back in the bridal suite. Remember how I mentioned loving the way the sun sets over Oheka? This image is a great example of that. The light pours into the room, turning everything to gold. 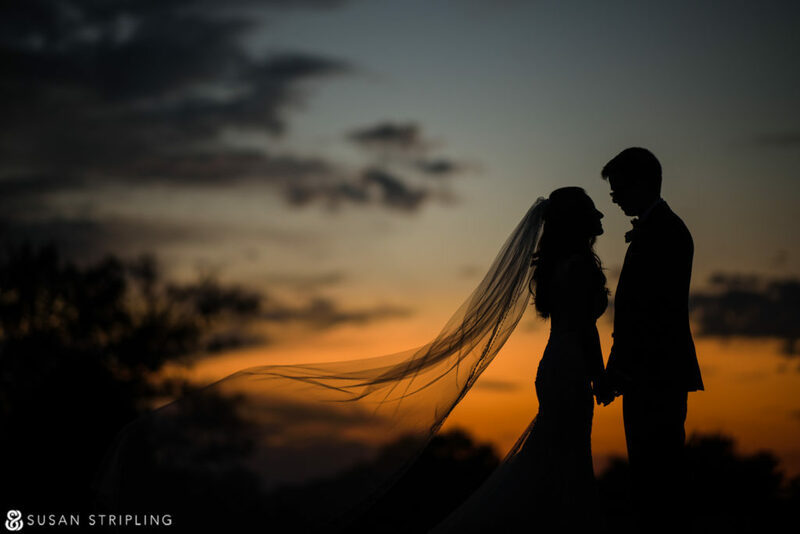 Before the sun was completely gone, we were able to go back out to West Gate drive for a few more portraits of the bride and groom together. 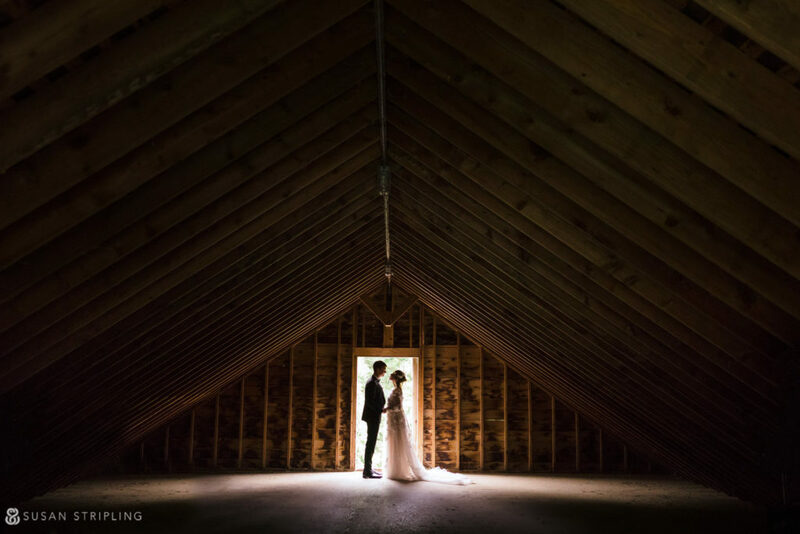 One of the things that I think that I do well as a wedding photographer is find light in unique places. Where is this at Oheka? I’ll never tell. But isn’t it beautiful? 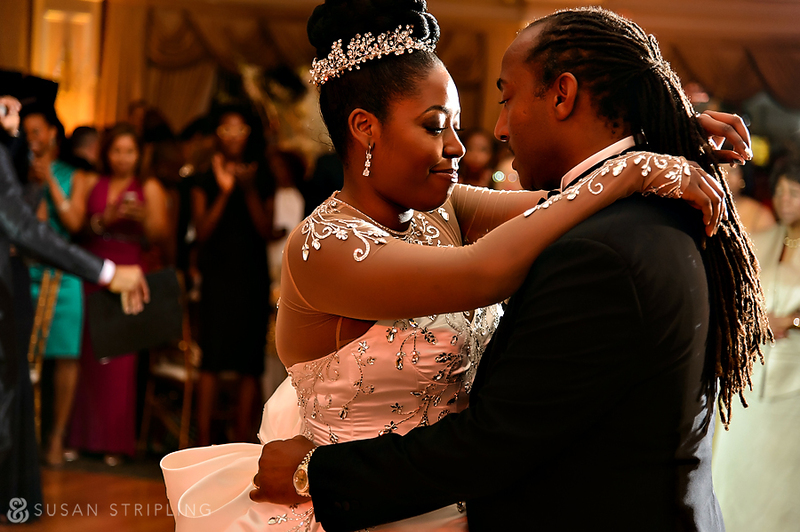 The bride paired a Pnina Tornai dress from Kleinfeld with a Pnina bodysuit. I’d never seen a bodysuit under a strapless dress before, and I really liked the unique look. The chandelier in the entryway is just one of the many beautiful details at Oheka. It’s such a stunning portrait location. The sun sets so quickly in the winter. In the summertime, the sun seems to take hours to crawl towards the horizon. 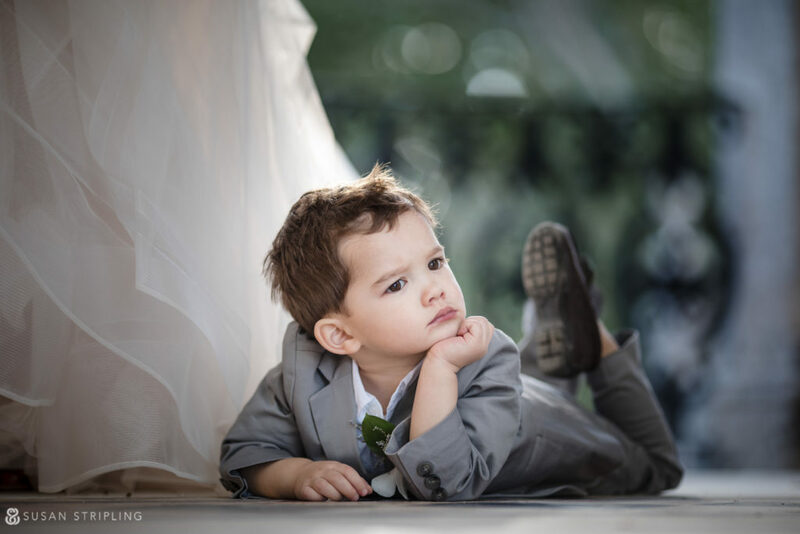 It gives us more time for portraits outdoors! Shella is so beautiful. Despite the hectic schedule of the day, she stayed calm and smiling. She and Jamil are really lovely together, kind to each other, and so very smartly funny. 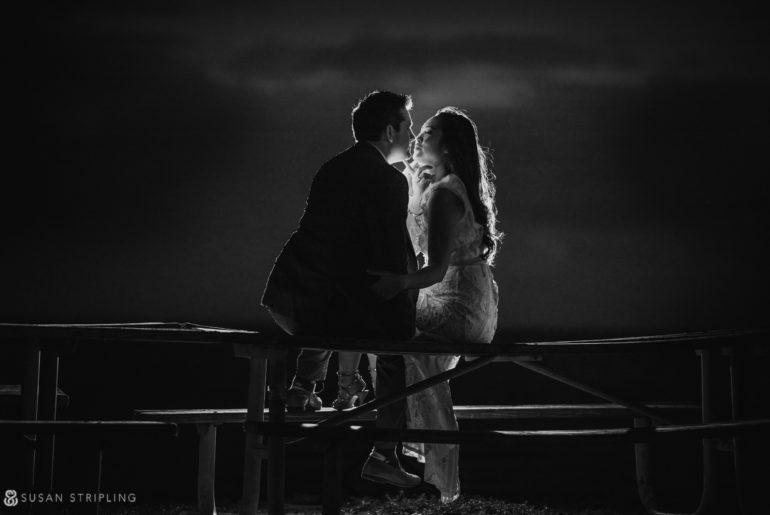 We worked with every single bit of the fading light for these portraits. This is back out on West Gate drive, the road that leads up to Oheka. 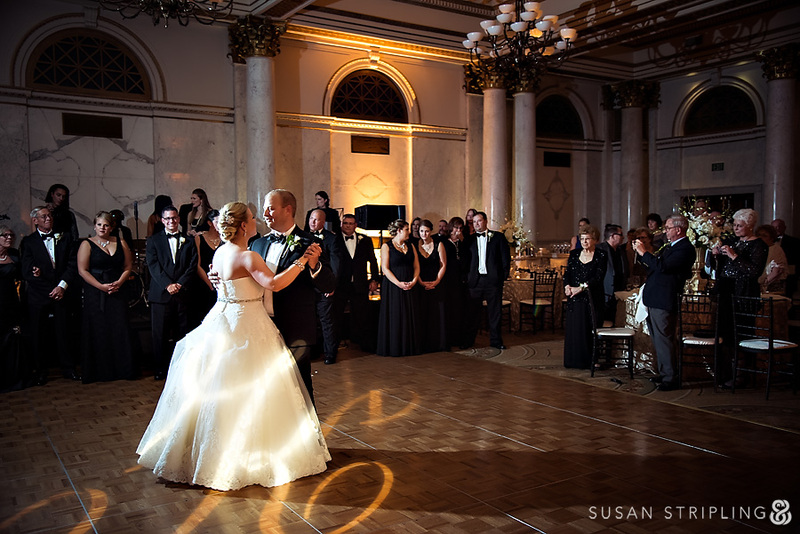 After some portraits with the bride, groom, and their families, we moved inside to the Grand Ballroom for the reception. 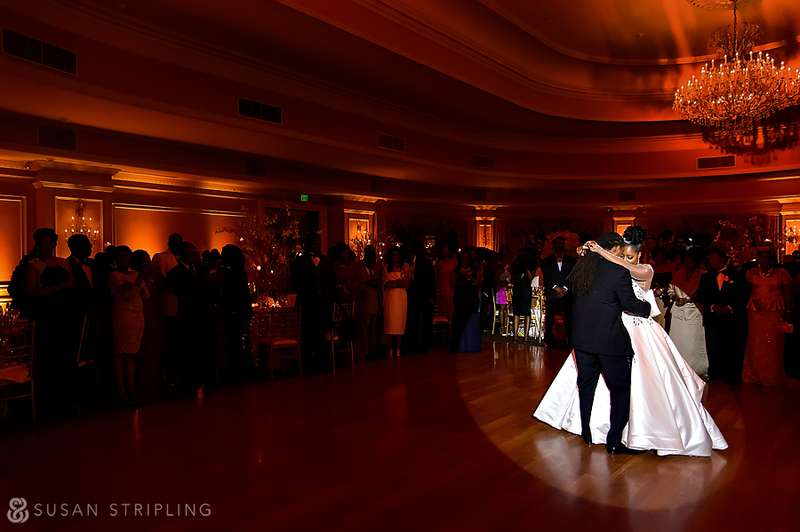 I love the dramatic spotlight on Shella and Jamil for their first dance. 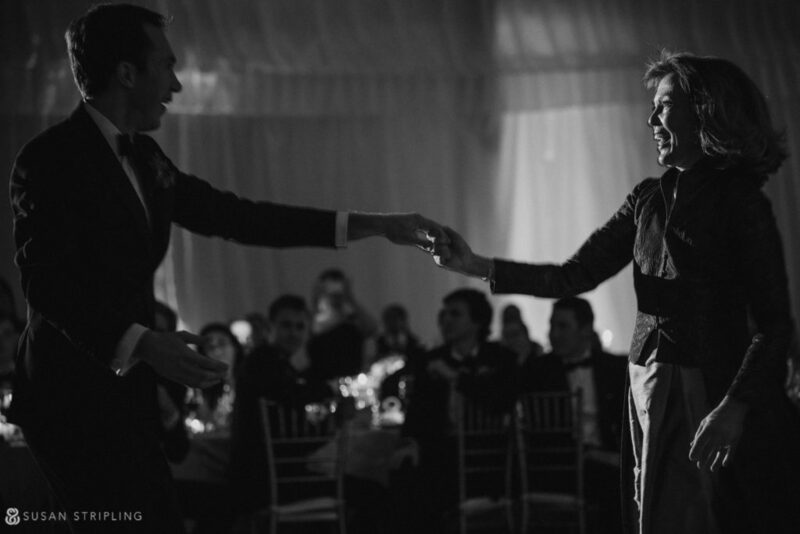 After a quick dress change, it was back into the reception for a second grand introduction. Shella has the greatest laugh, and she laughed all day long. 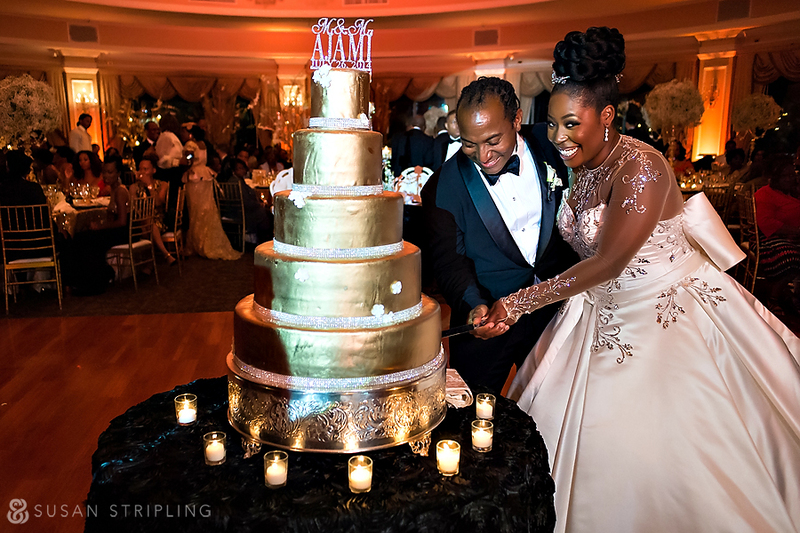 Since there was gold glitter in all of the decor, it only makes sense that the cake was pure gold as well! The night ended with an incredible display of fireworks. 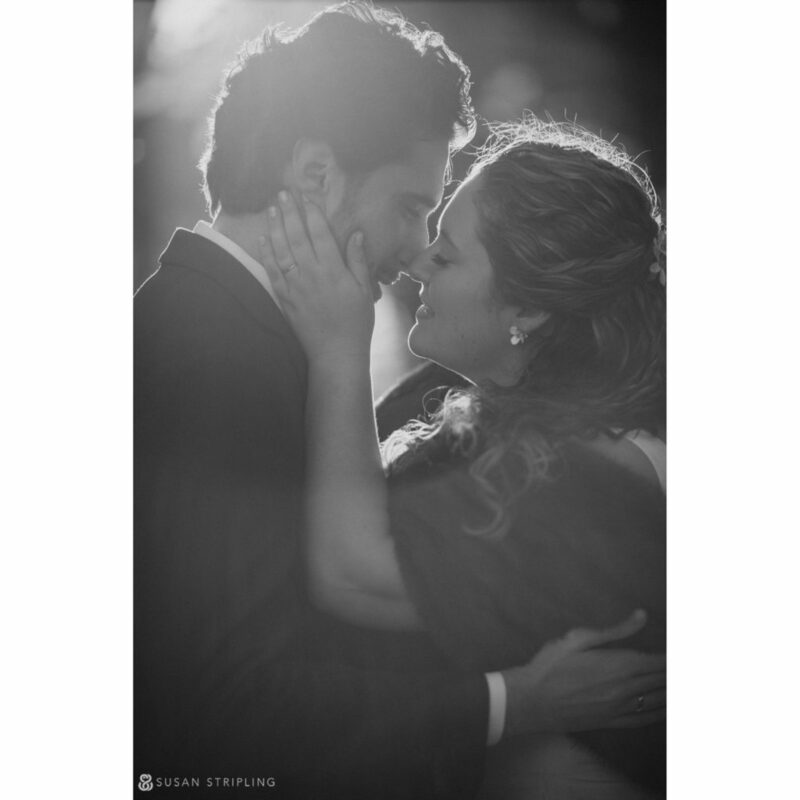 Shella and Jamil, thank you so much for having me as a part of your day. 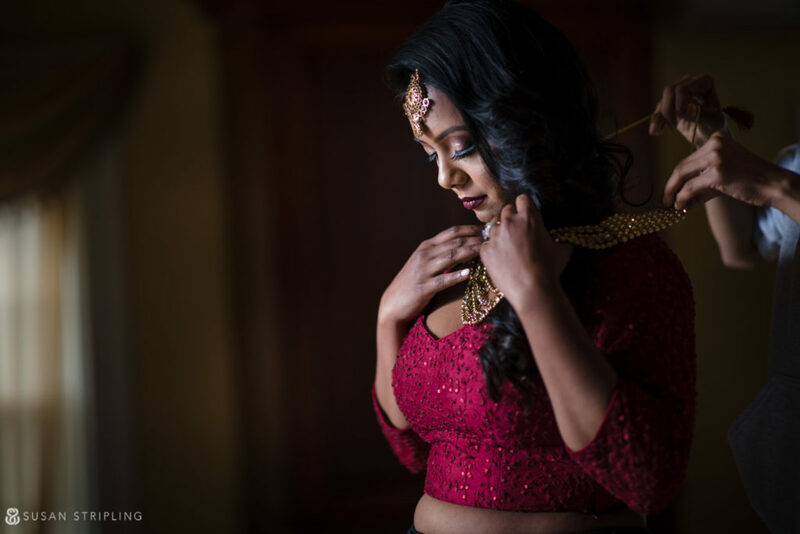 From your engagement session in my studio to the wedding, and then the post-wedding session, I’ve enjoyed getting to know you both. Shella, thank you for bringing your wild and fantastic style to every part of your days. 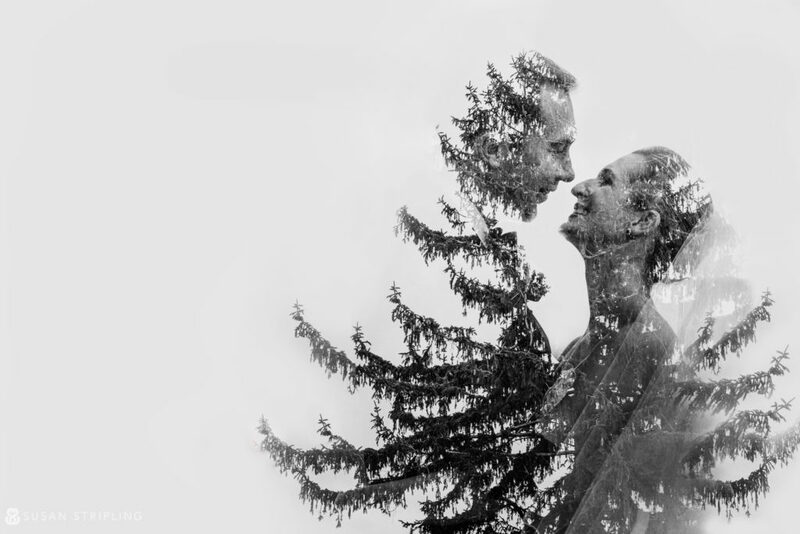 I hope you love these images as much as I loved creating them for you! 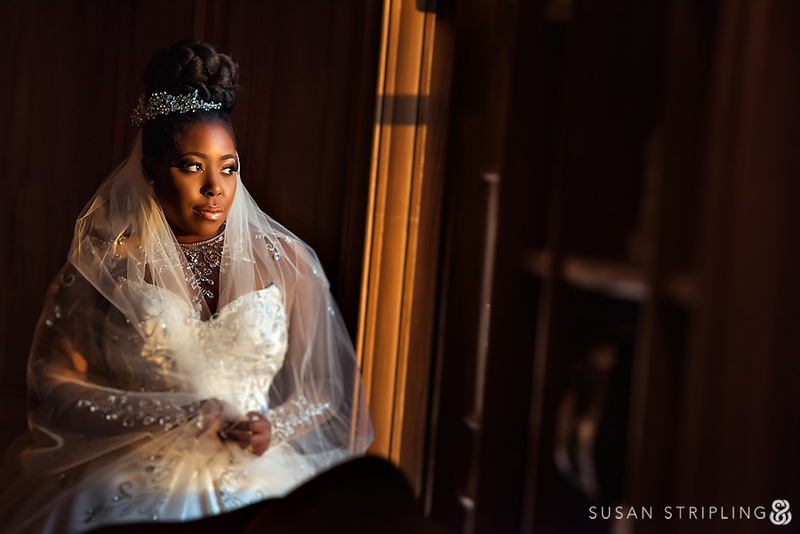 Angela and Rob were married at Baltimore’s Grand Historic Venue on a day that held the promise of fall. The Grand Historic Venue is a fascinating space, built by the Freemasons as the Grand Lodge of the Maryland Masonic Temple back in 1866. For more than a hundred years, this building served as the Maryland Freemasons’ headquarters. In 2005, it became the Tremont Grand. Modeled after the buildings of the French and Italian Renaissance, the building has a charm and warmth not often found in hotel-based venues. 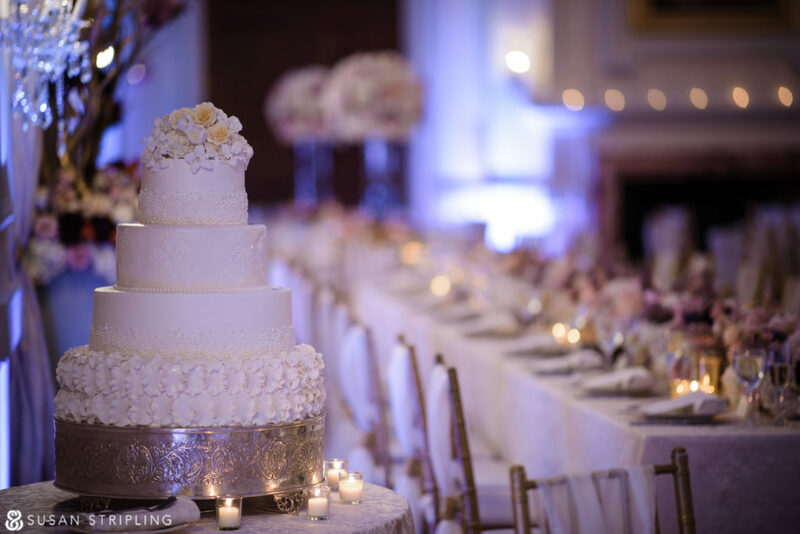 From the library to the Corinthian Ballroom, the Marble Room to the marble staircase, the entire venue exudes a hospitable, classic style perfect for a sweet wedding day. 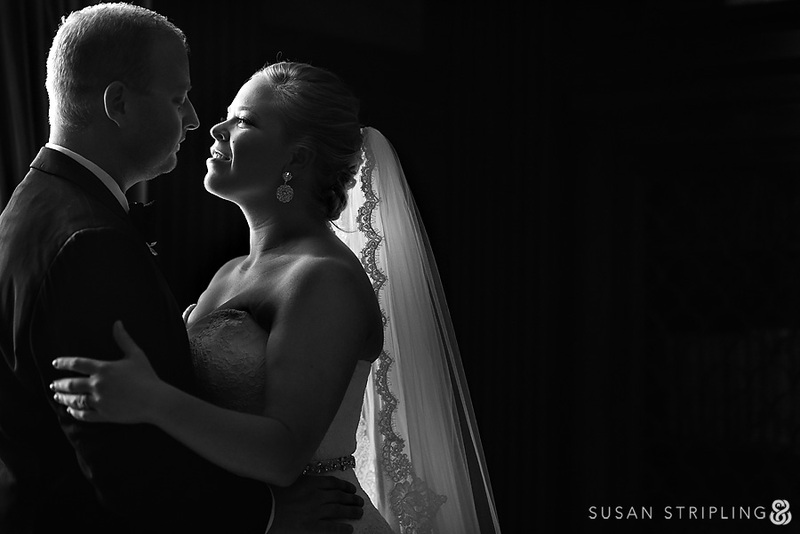 I got to spend some time with Angela in her room at the conjoined Embassy Suites before she got into her wedding gown. 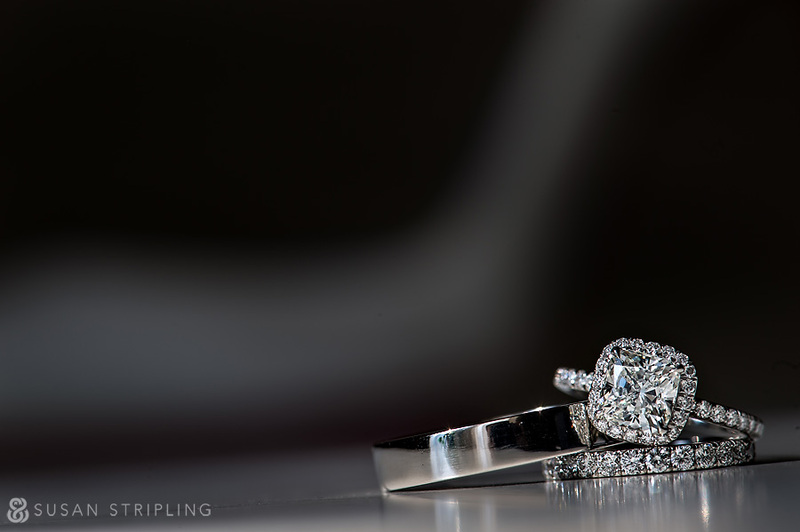 Starting the day photographing such beautiful rings was a true treat. 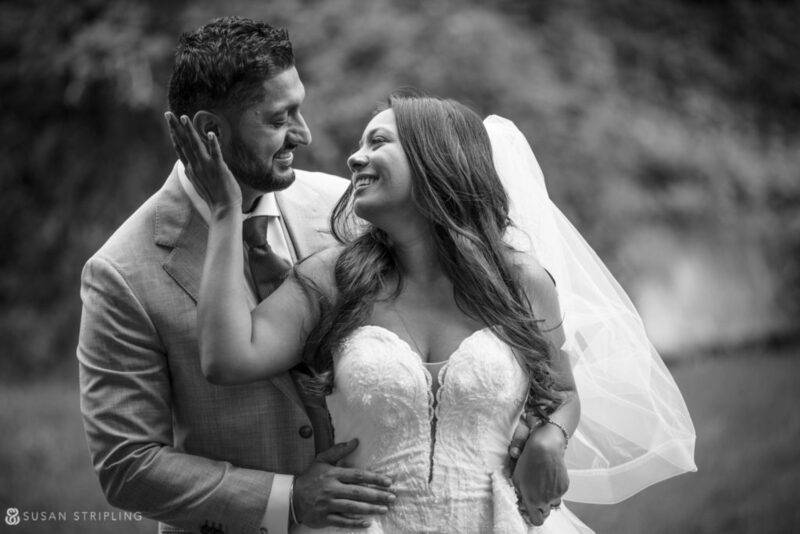 Angela’s Alfred Angelo bridal gown fit her like a glove. I love the dramatic skirt and classic sweetheart neckline. 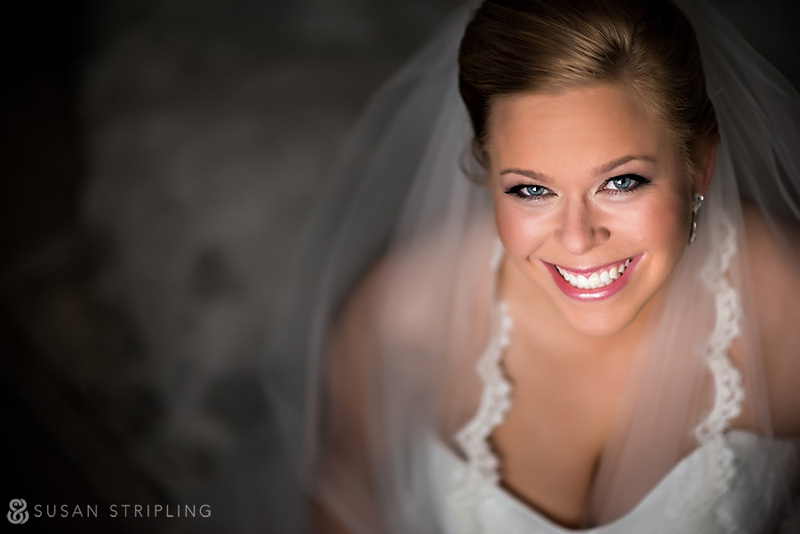 Up Do’s For I Do’s did a tremendous job with Angela’s bridal hair and makeup. 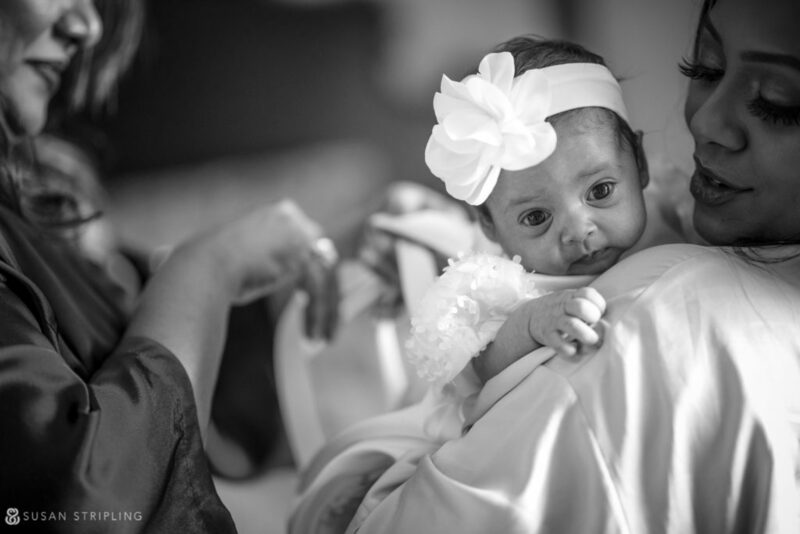 Before Angela saw Rob for the first time, she gifted each of her parents sweet cards. 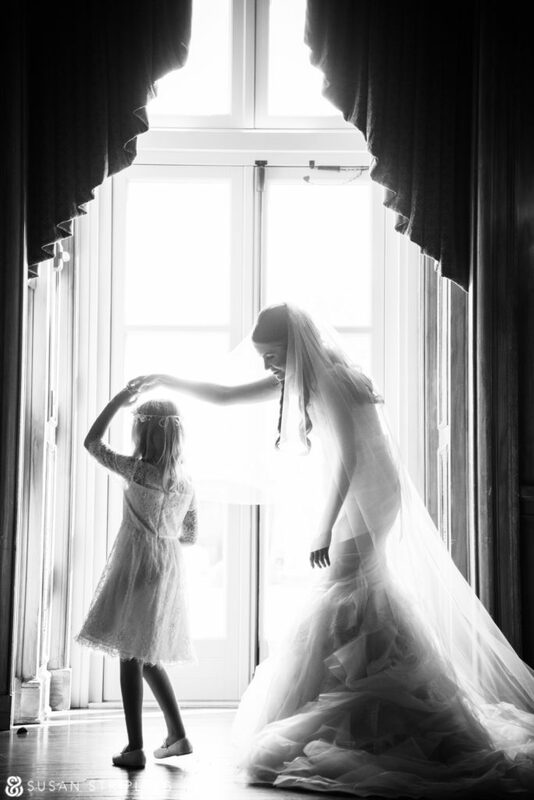 I love this quiet moment alone with her mother. 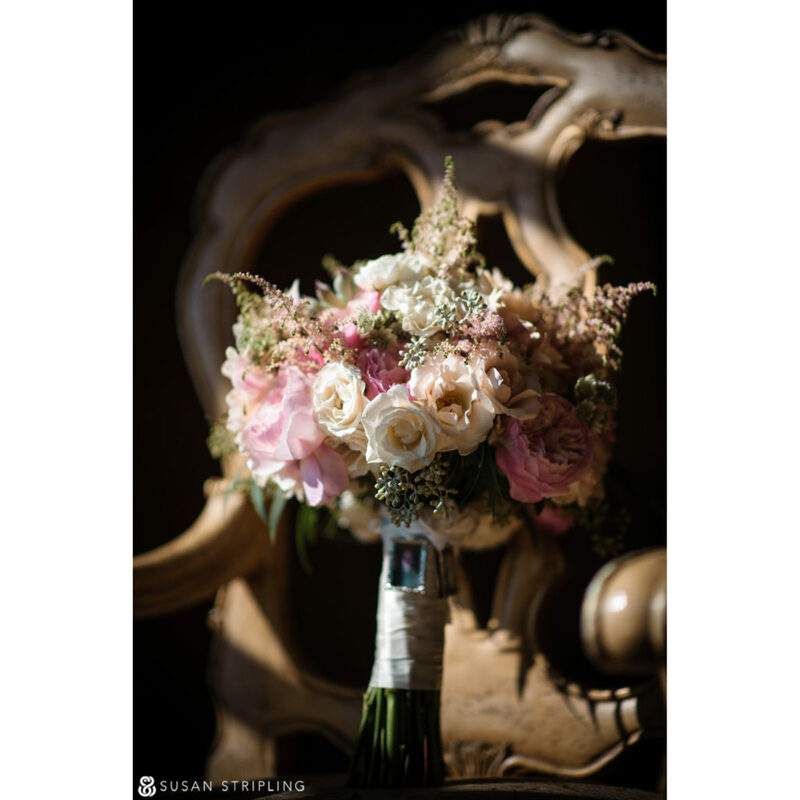 Botanique Events was responsible for the bride’s bouquet. 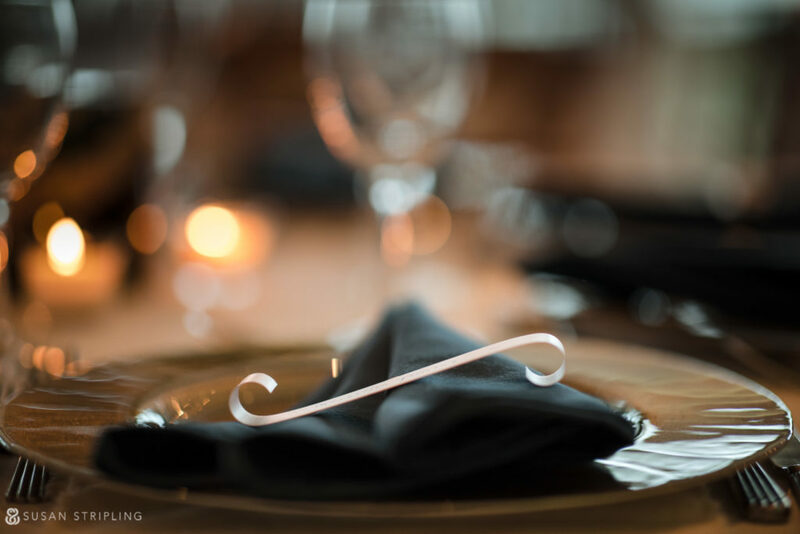 I love the classic, simple elegance of the design. Angela was a dream in front of the camera. 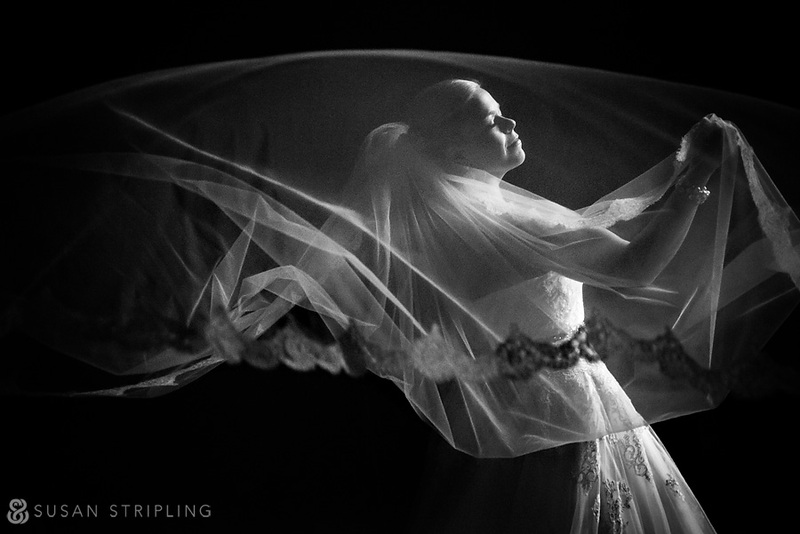 She was graceful, sweet, and so very happy that photographing her was a delight. 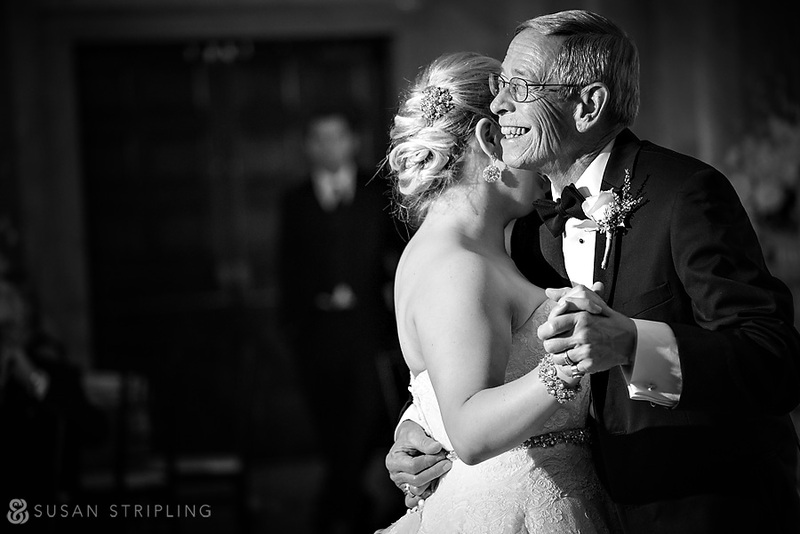 As a wedding photographer, moments are what fuel me. 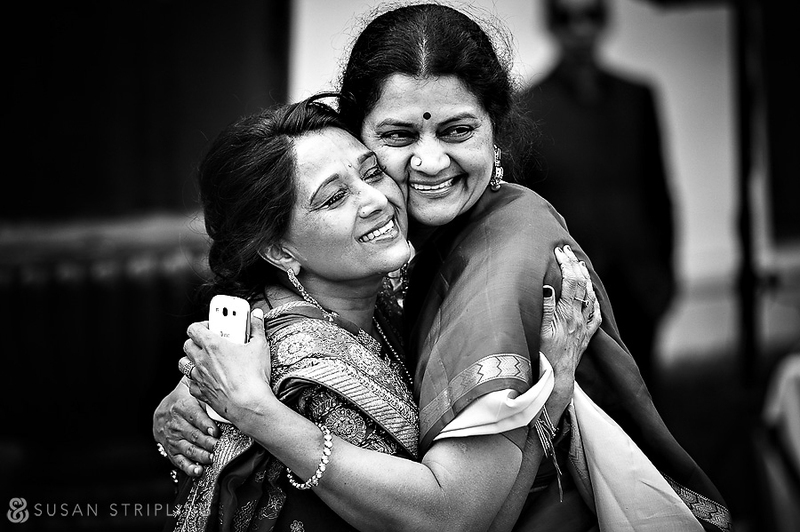 I am awed and amazed when beautiful moments occur between family members and friends, and I am trusted to document them. 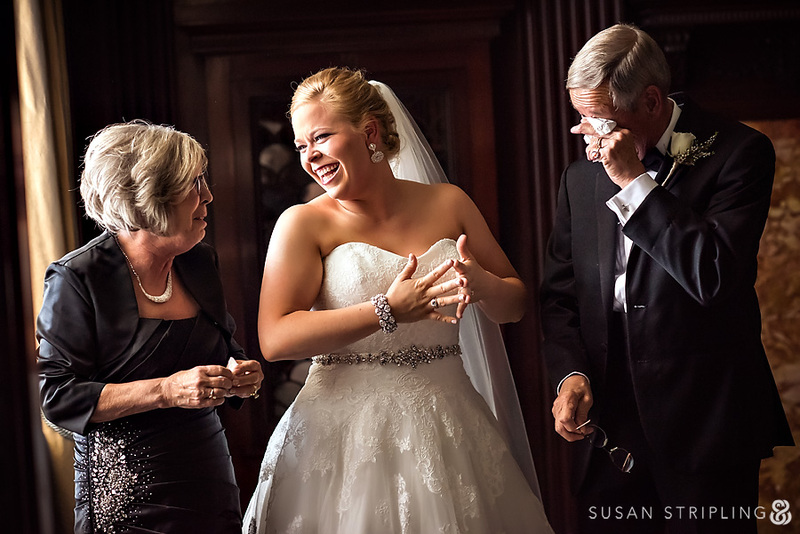 I hope that Angela knows what a dream it was to capture this moment between her and her parents. It remains one of my favorite photographs of 2014. 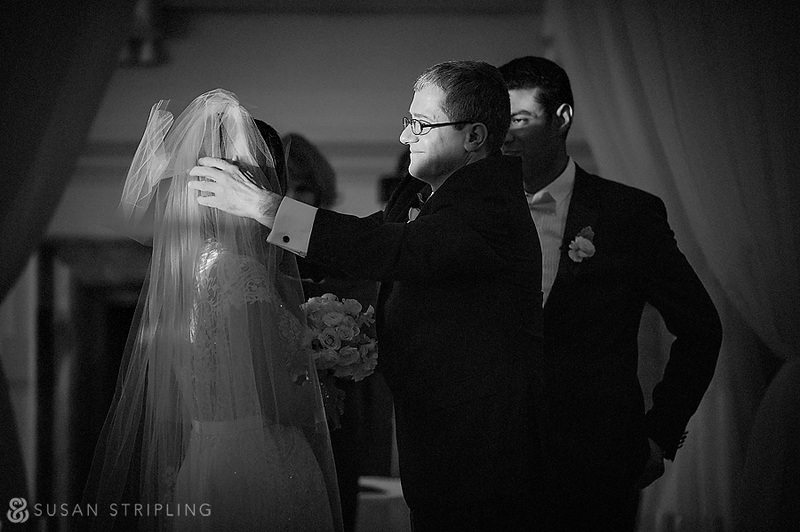 When a beautiful moment occurs, it’s often easy to document it and move on. This image shows that if you stay with the moment, sometimes you’ll find yourself in the middle of an incredible scene that is still unfolding. From tears to laughter in just a few seconds. 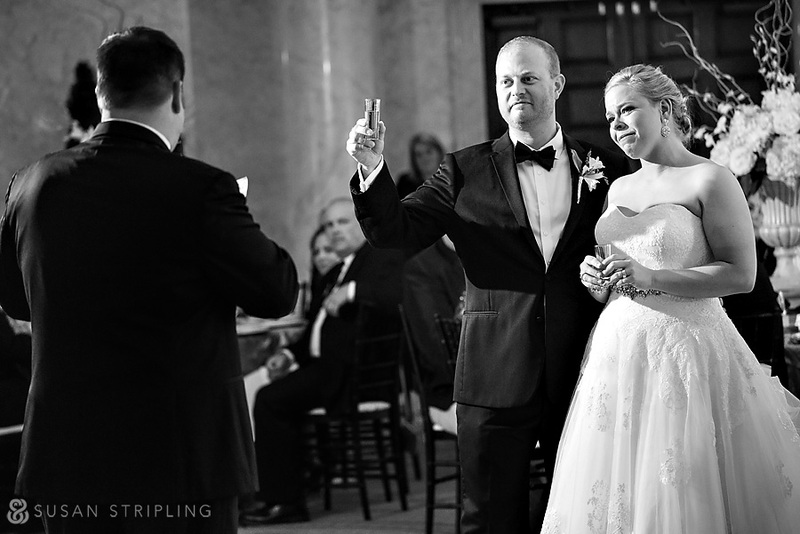 This, friends, is what wedding photography is all about. 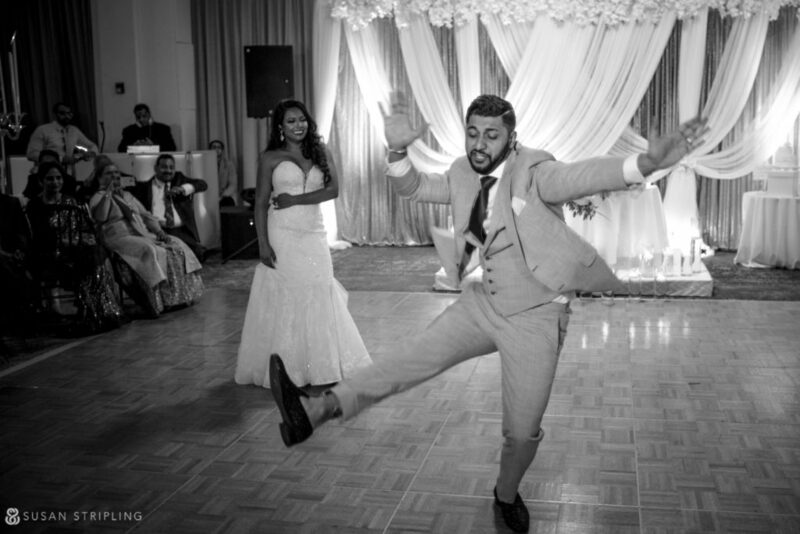 The groom is a very, very talented wedding photographer. 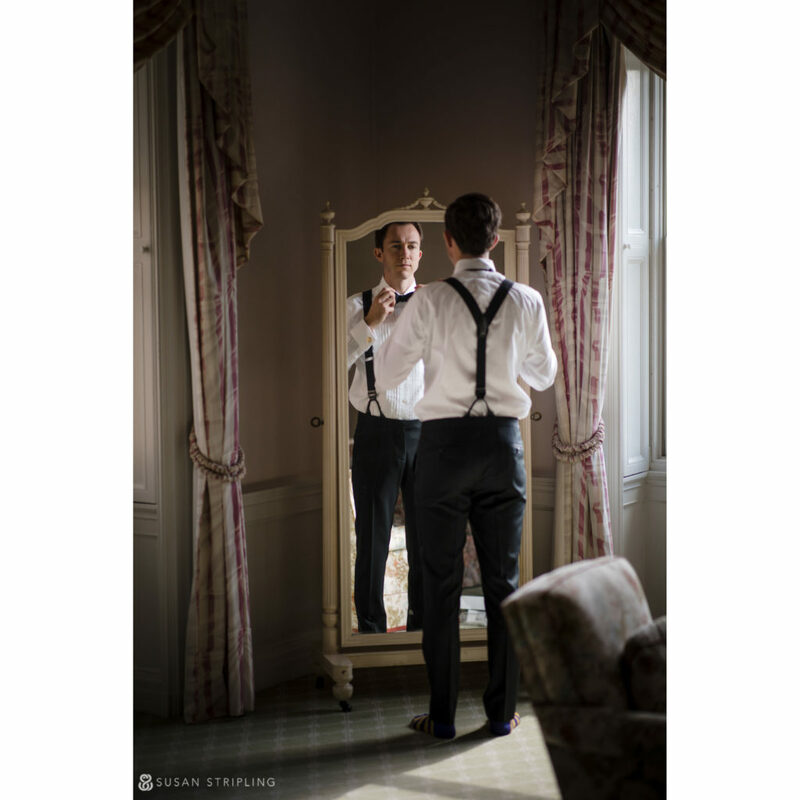 Being asked to photograph his day was extremely flattering, and I hope that they love these images as much as I loved creating them! Angela is fantastic, funny, bright, and dazzling. Her smile lights up an entire room. 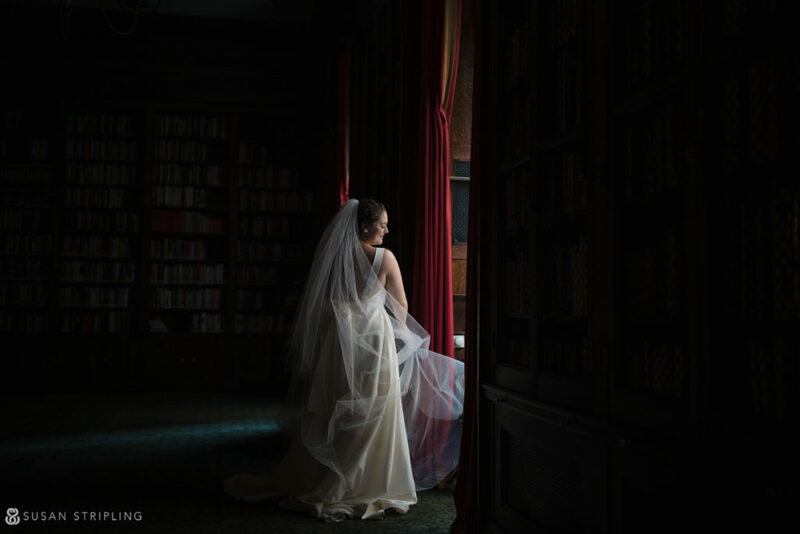 It’s no wonder that the groom wanted to photograph her himself – Rob, thanks for letting me eventually have her back for this portrait! 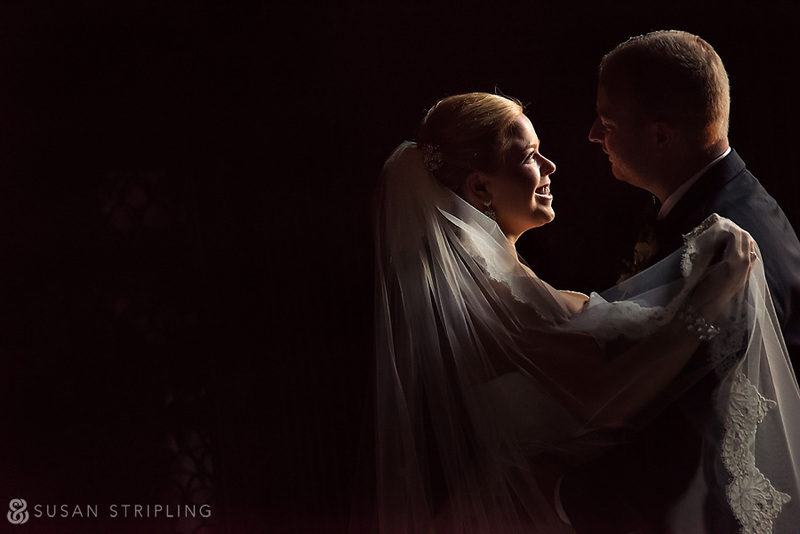 The bride and groom graciously allotted a great amount of time for portraits of the two of them together. The light was tremendous outside, and I was determined to use it! Trust between a photographer and their subject is so important. Thank you, Angela, for trusting me and braving the wind to make this portrait! 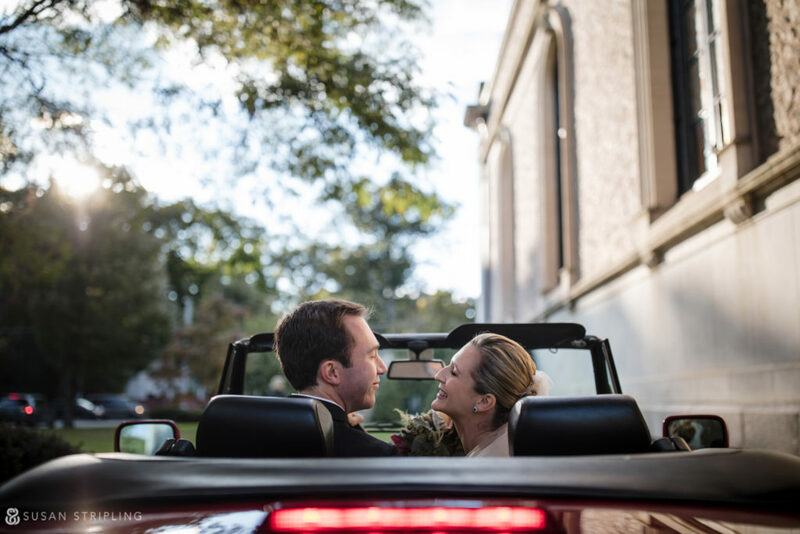 Despite the traffic rumbling by, the wind, and the sounds of their bridal party in the background, Rob and Angela were only interested in each other. 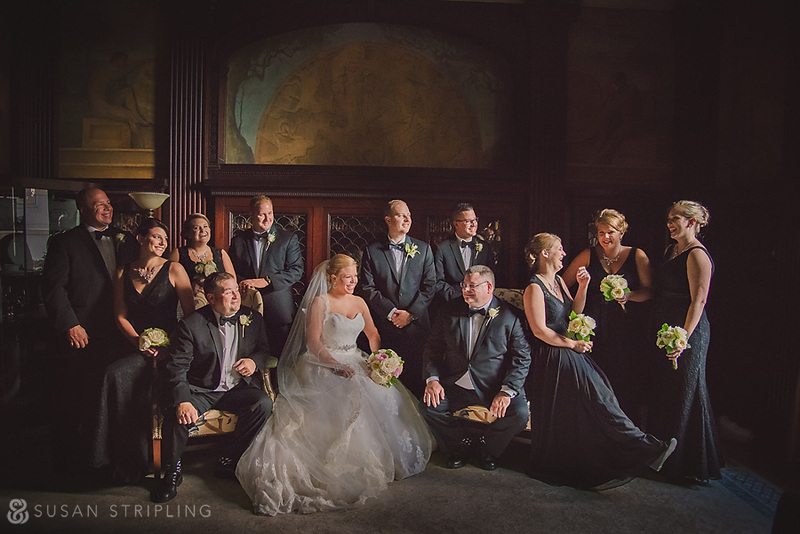 After the family formal portraits, we went back inside the Grand Historic Venue for a few more portraits of the bridal party. 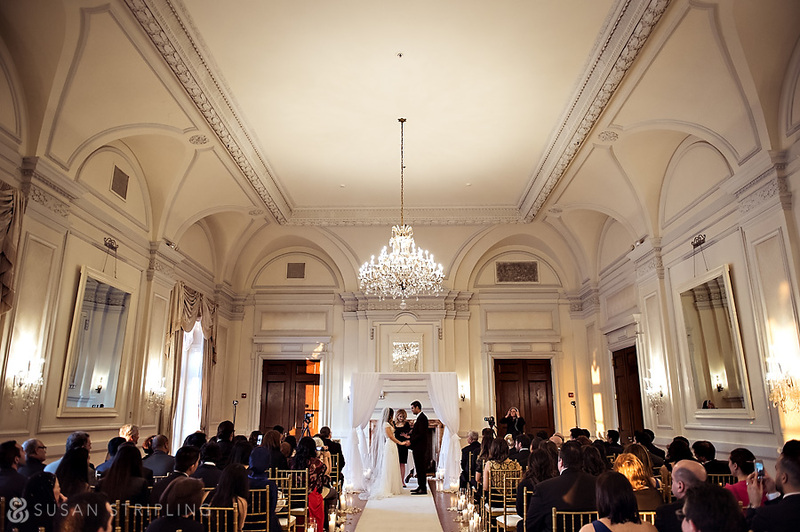 The wedding ceremony was held in the Marble Room, and I love the combination of the candles and the marble. 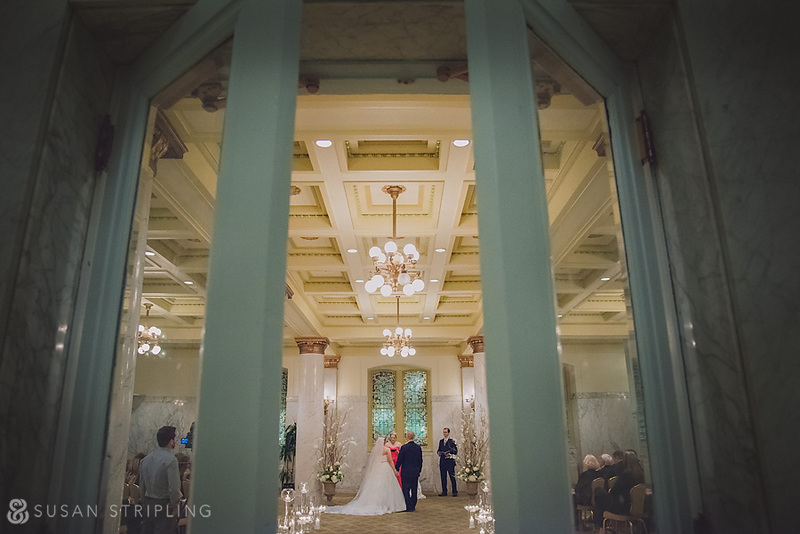 The view from outside the Marble Room was lovely, showcasing the sweetly intimate ceremony. 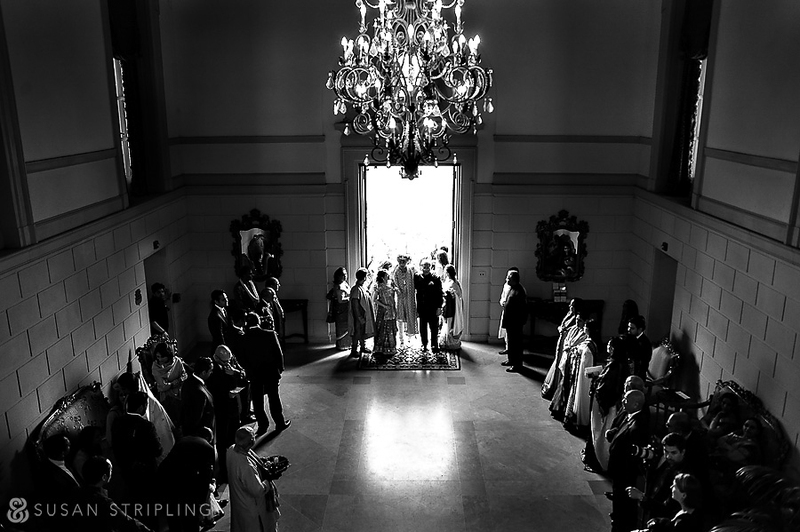 The Marble Room was such a cool space, but what made the ceremony really fantastic were the moments between the bride and groom. After the ceremony, the guests moved into cocktail hour, and we stepped back into the library for a few more portraits. I love having the bride and groom all alone after their ceremony. Their emotions are always so high, and the moments are so sweet. 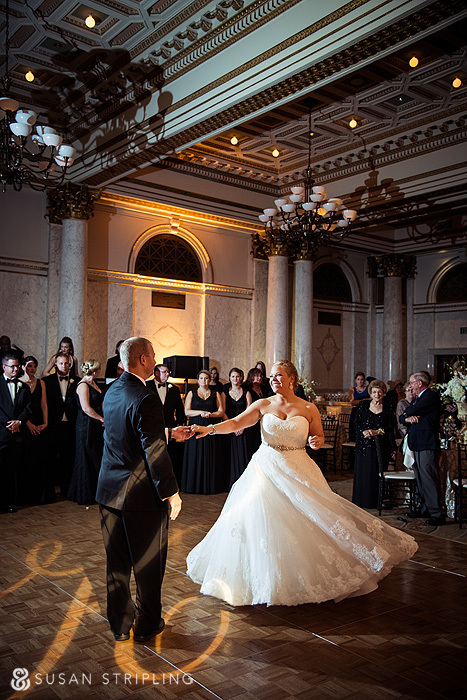 The Corinthian Ballroom was the perfect space for the wedding reception. 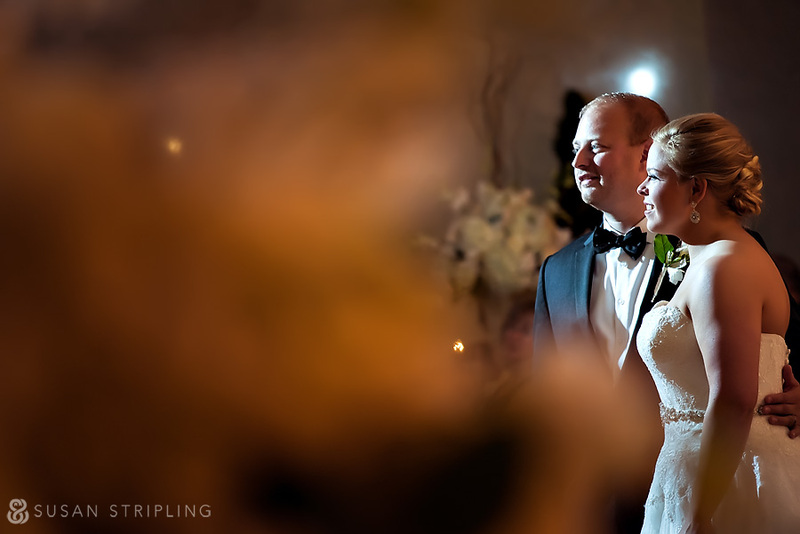 It was great to steal the bride and groom away for just one more image before the reception began. 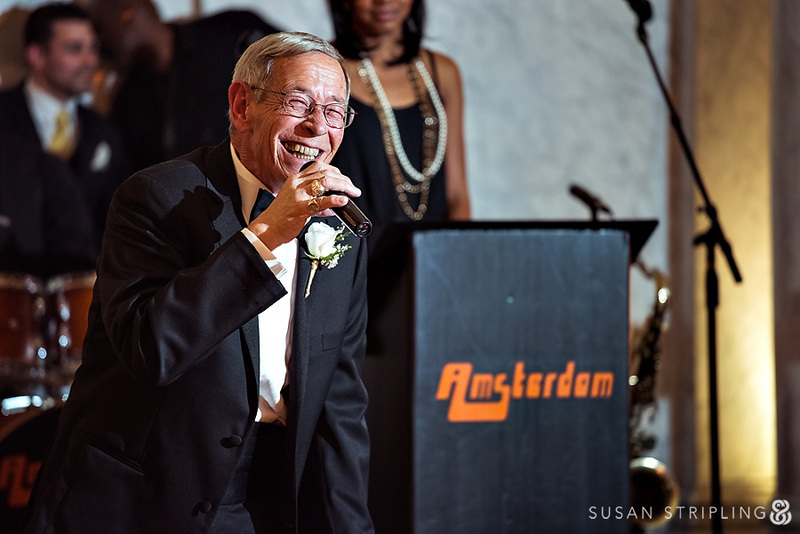 EBE Amsterdam performed the first dance beautifully, then kept the crowd on the dance floor all night long. 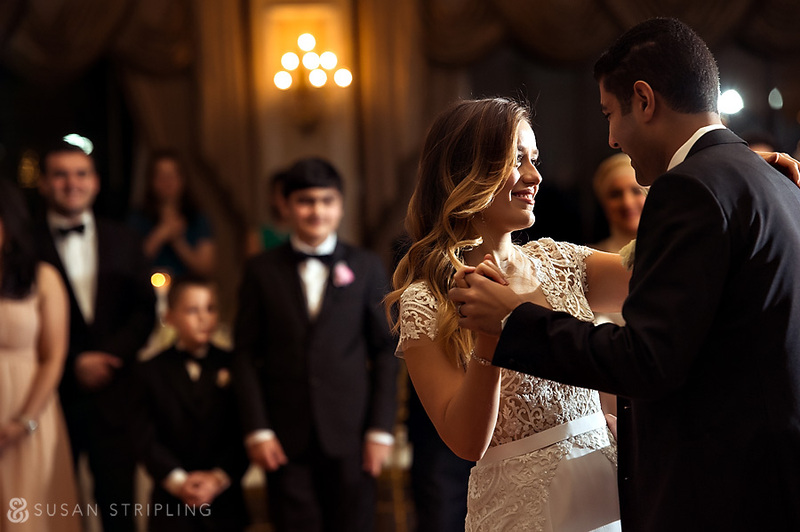 How sweet was this first dance? 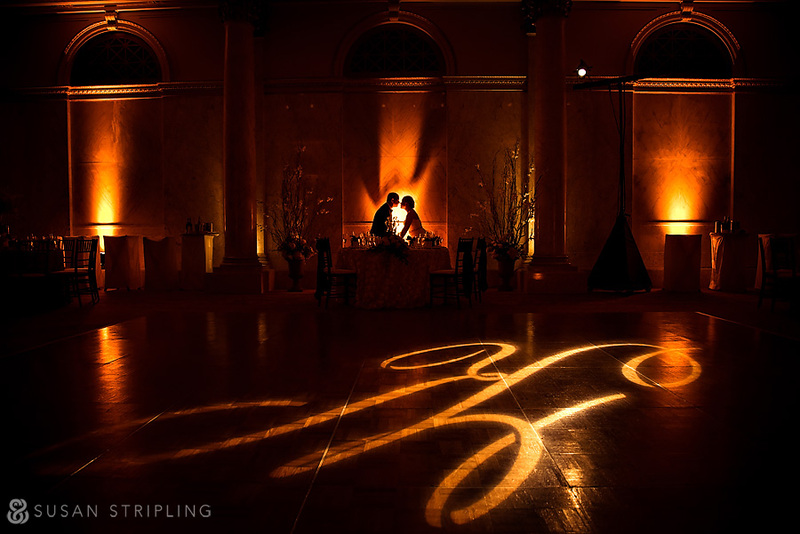 The monogram on the floor was exquisite, as was the beautiful motion in Angela’s skirt. 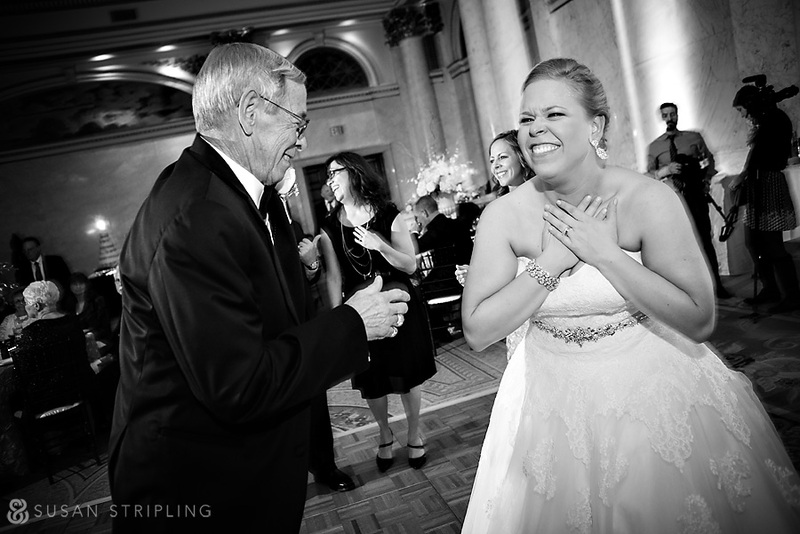 The bride and her father continued to be adorable well into the reception! 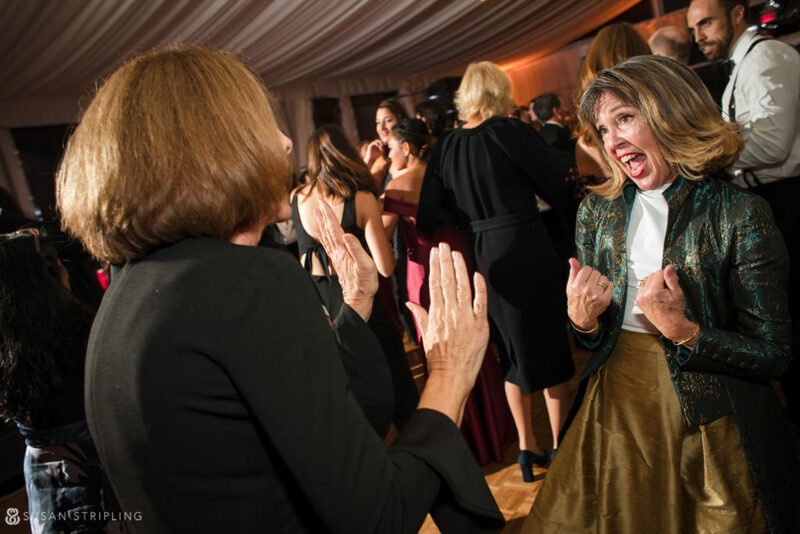 ….and well into the toasts and speeches, too! 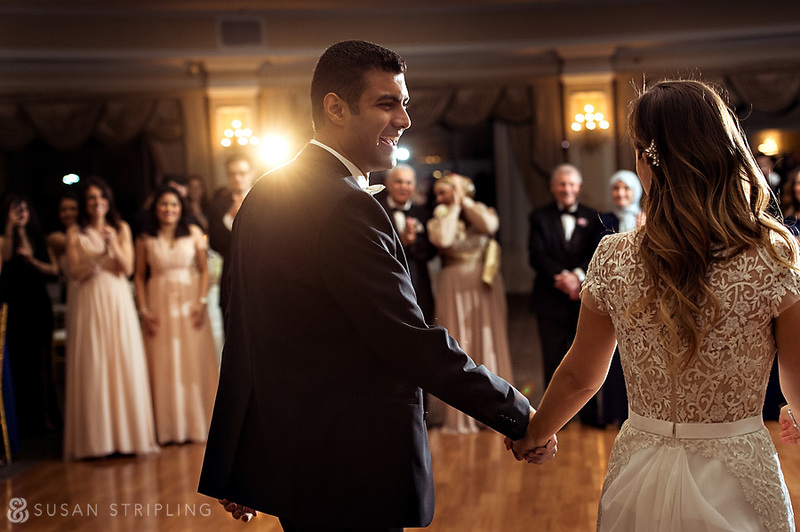 The lighting in the room was beautiful, but I love working with subtle off-camera flash to create a dimension to my reception images. It is always such an honor to bear witness to such heartfelt, meaningful toasts. 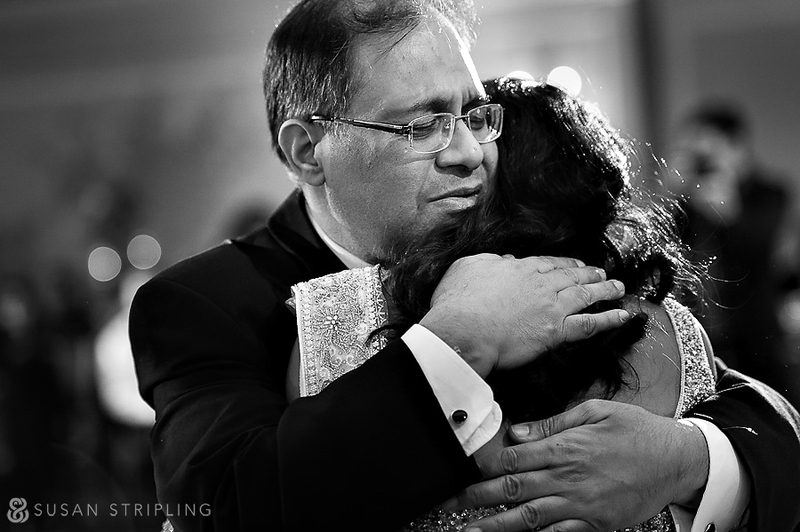 Honestly, I could have just photographed the father of the bride’s wonderfully expressive face all night! 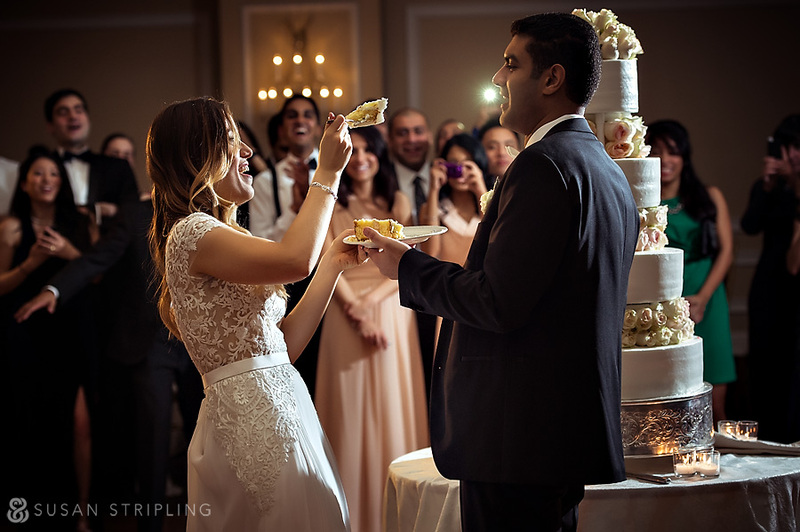 The marble walls made an excellent backdrop to the cake cutting. 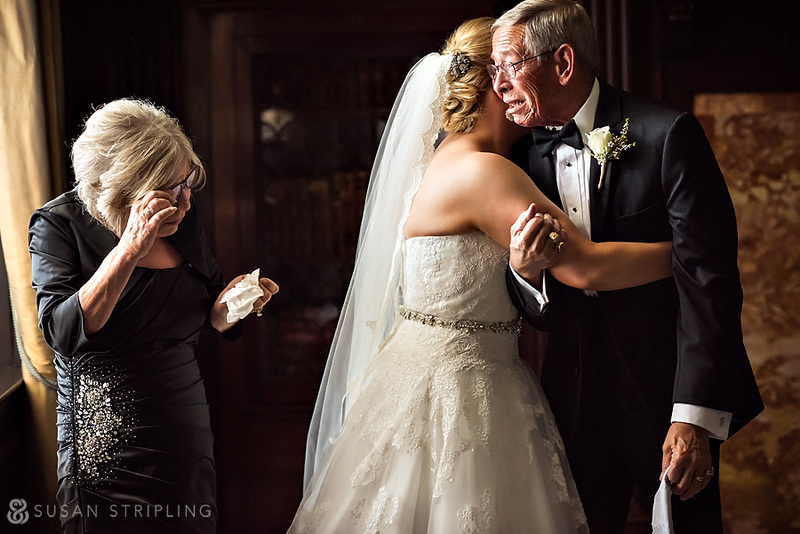 Not to be outdone by the bride’s emotional dance with her father, the groom took to the floor with his mother. 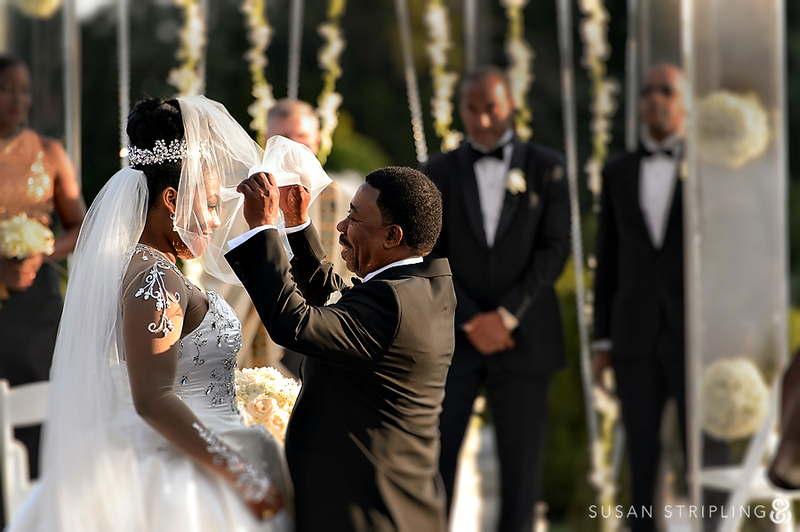 I was really touched by the closeness of the families, the bride and groom are clearly so loved. 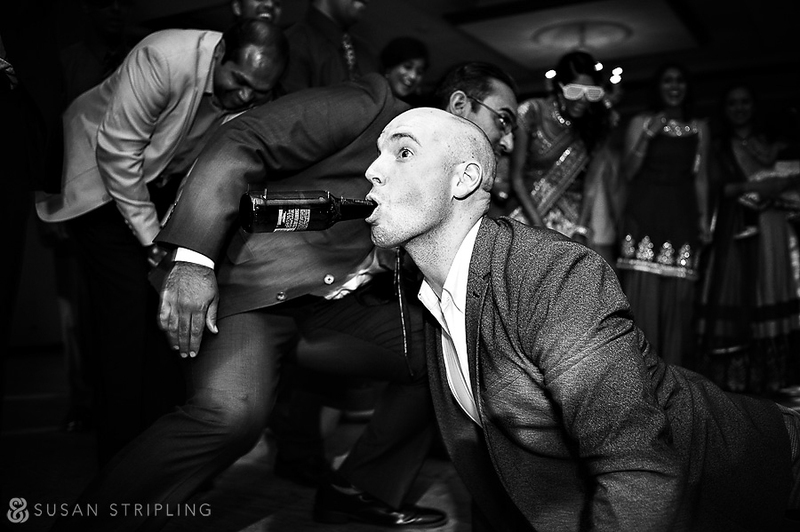 Documenting wedding receptions is a great joy. 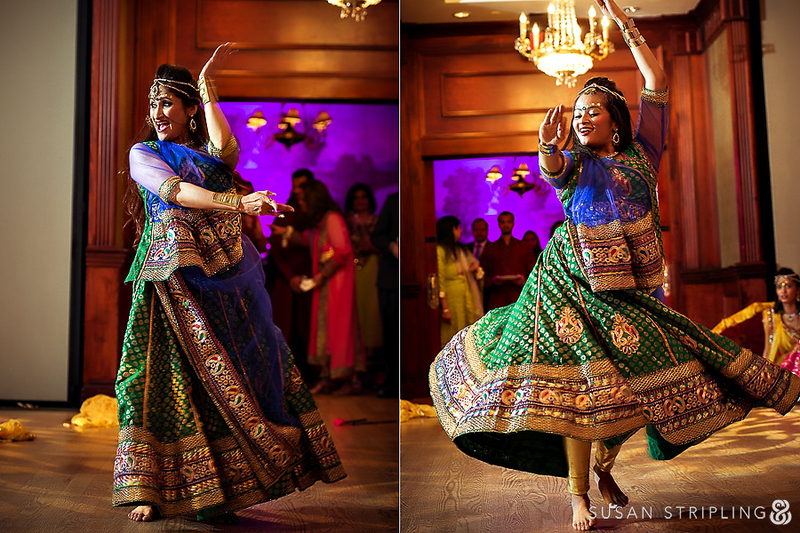 I love the music, the dancing, and the opportunity to witness some truly stellar moments. 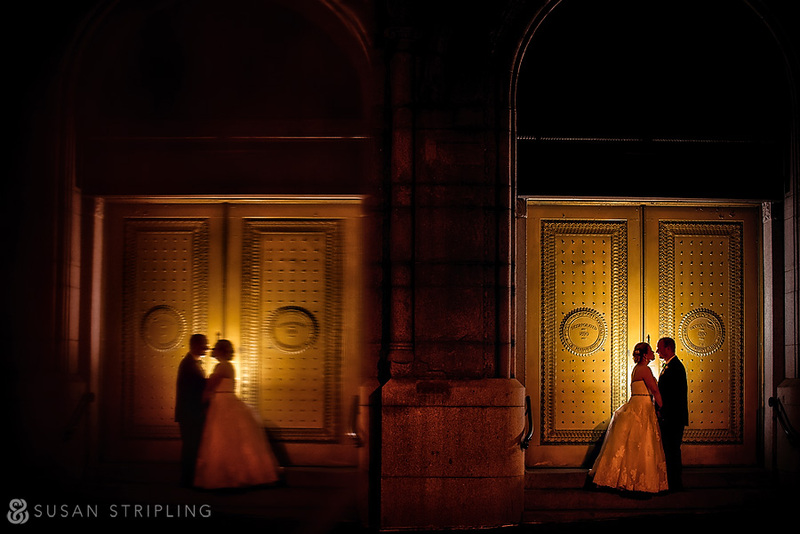 We stepped outside for a few cold, cold moments to make a few more portraits of the bride and groom before the end of the night. Rob and Angela, thank you so much. Thank you for trusting me, for understanding just how excited the lighting made me, for braving the nighttime cold with me, and for hollering at a total stranger over sidewalk laws. Your day was a delight, and it was wonderful to document it for you! 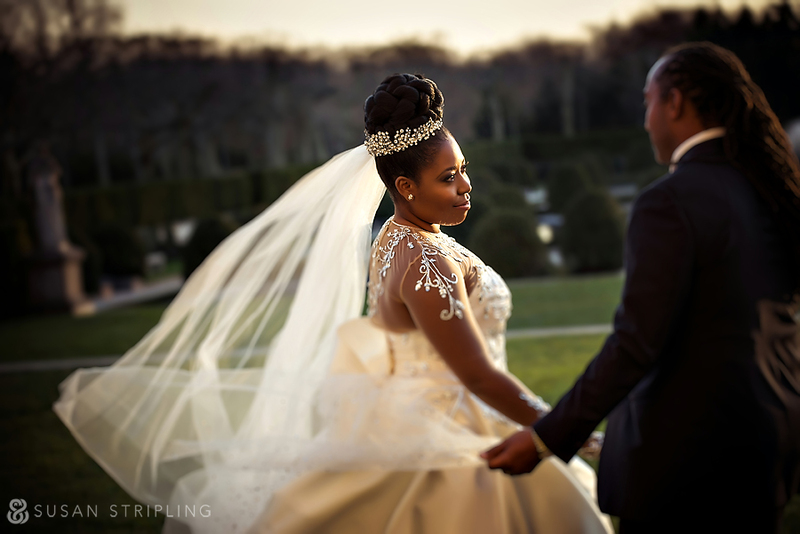 More images will be coming soon from Shella and Jamil’s perfectly fashion-forward wedding at Oheka Castle in Huntington, New York! 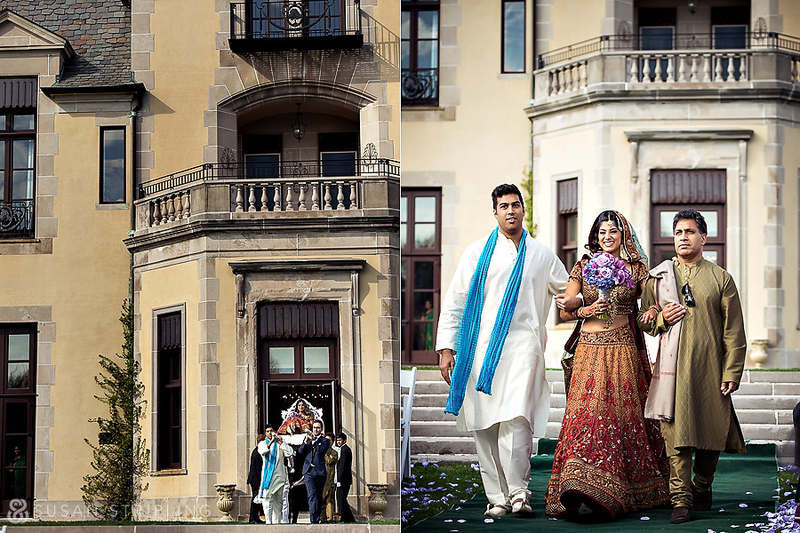 Aarti and Sarin’s Oheka Castle wedding was, quite simply, a photographer’s dream. 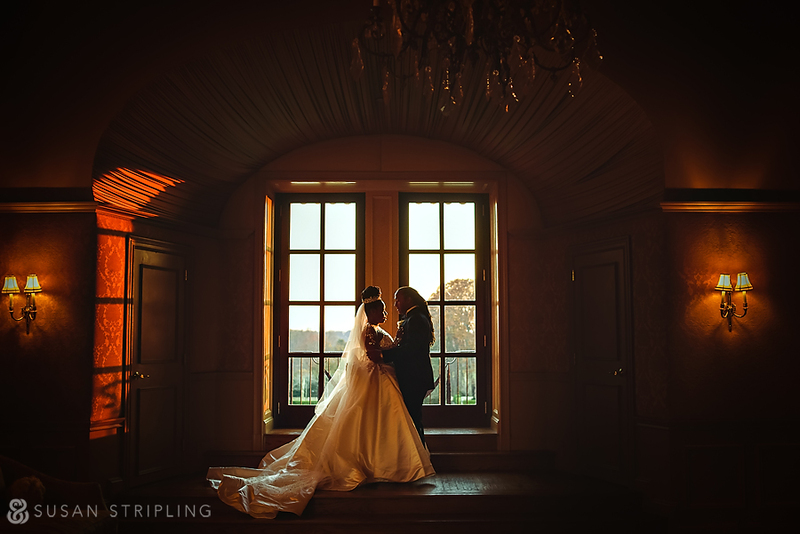 From the completely perfect lighting of the Oheka getting ready suite to the impeccable, flawlessly-on-schedule coordination from Lindsay Landman, to the just-right backlight on both the Baraat and the wedding ceremony, everywhere you looked there was a fantastic photographic opportunity. 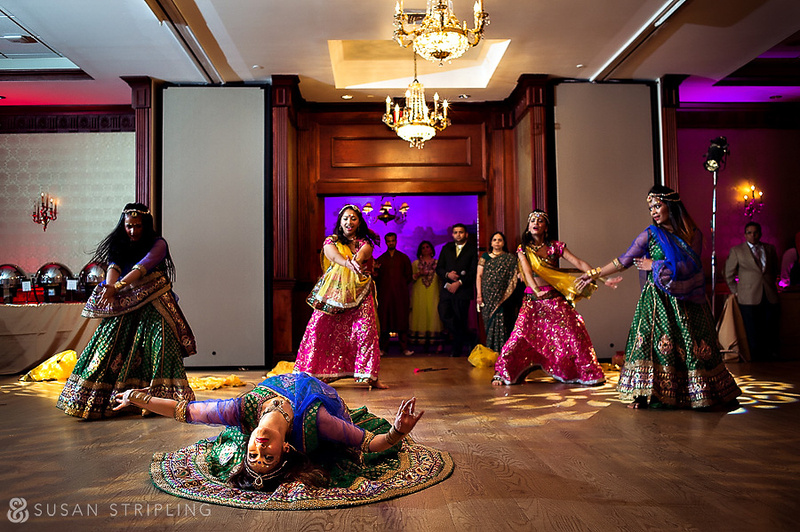 When you add to that the extraordinary warmth of both Aarti and Sarin’s families and the exuberance of their friends it all added up to yet another perfect Oheka event. 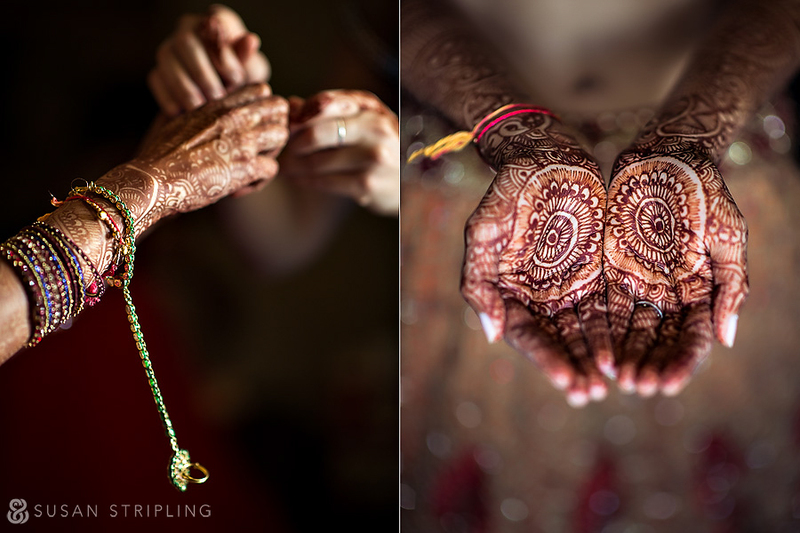 The luminous color of the bride’s dress and jewelry details were a delight to photograph. 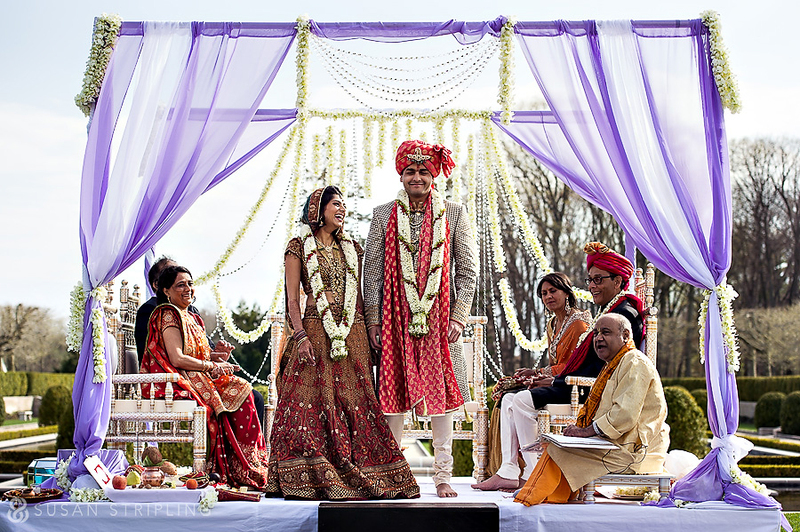 The bride and groom had tiny Bhagavad- Gita books as favors for their guests. 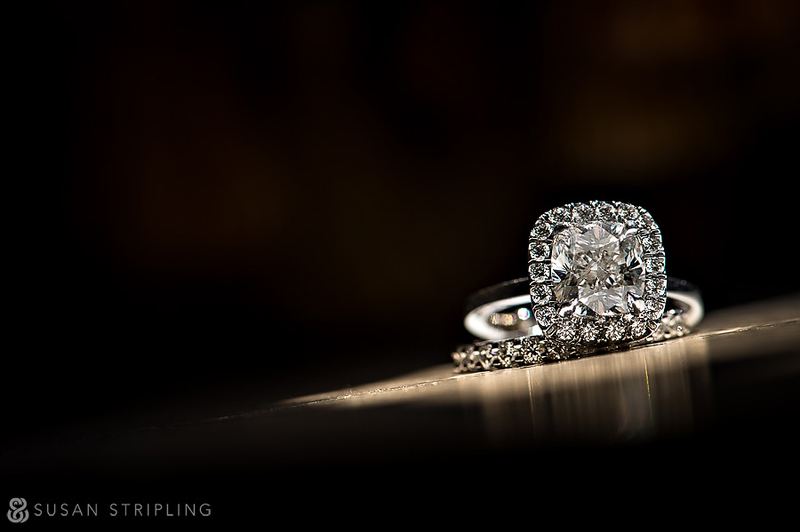 I thought using one as a backdrop for a portrait of Aarti’s ring would be appropriate and beautiful. 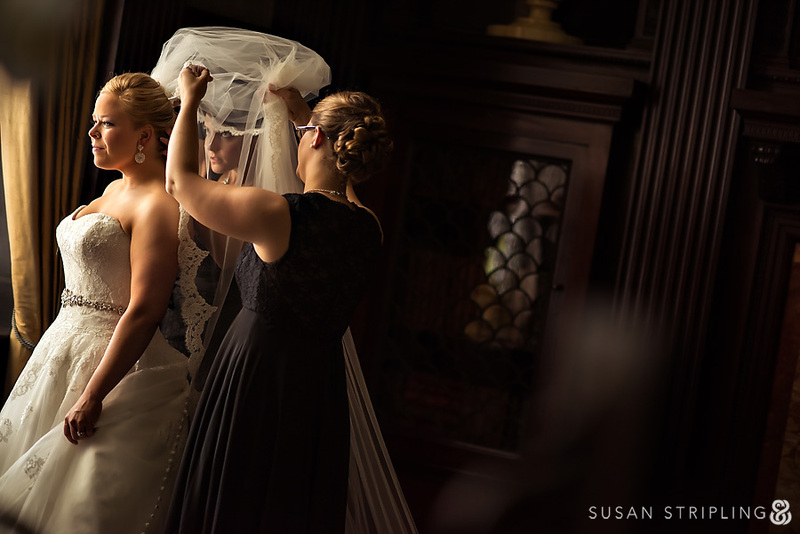 Most photographers who shoot in the Oheka Castle bridal suite default to the same locations for the getting-ready images. 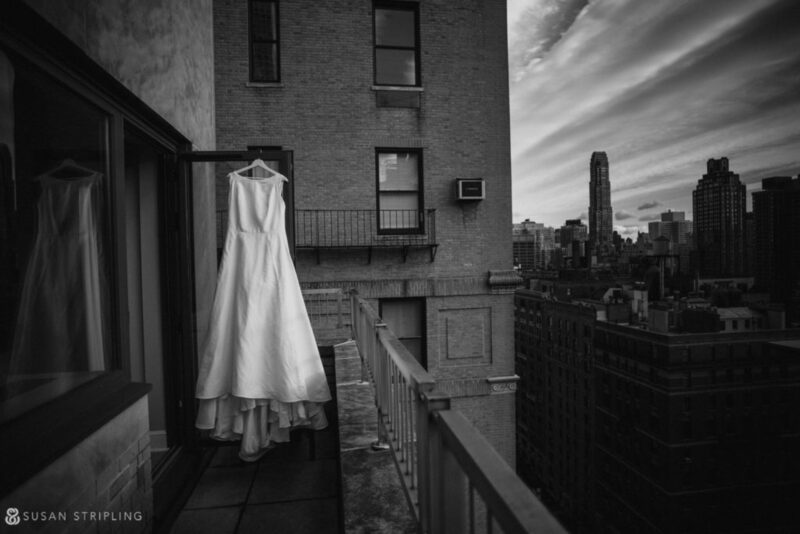 I moved throughout the suite, looking for new and different ways to approach the scene. Aarti was so sweetly graceful, so beautiful, and so easy to photograph. 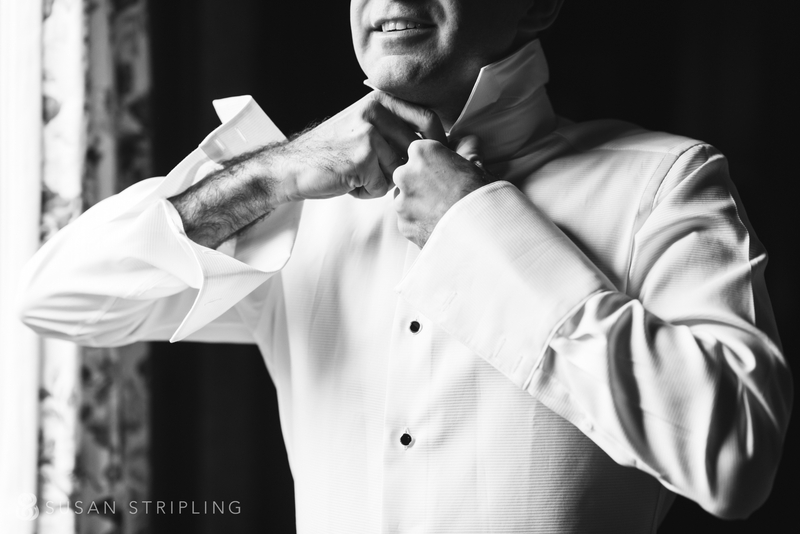 The getting-ready process was a lengthy one, giving me ample time to concentrate on each special detail. 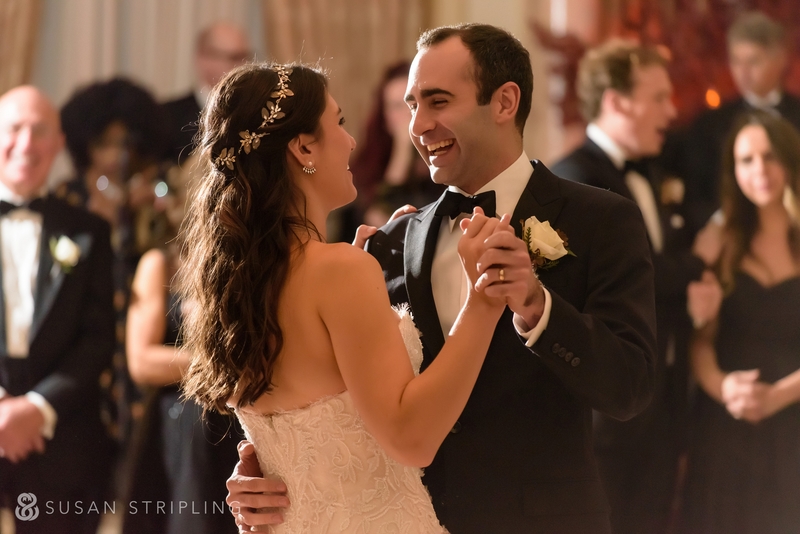 Lindsay Landman kept the day running perfectly on schedule, timing everything so impeccably that nothing was rushed or hurried. 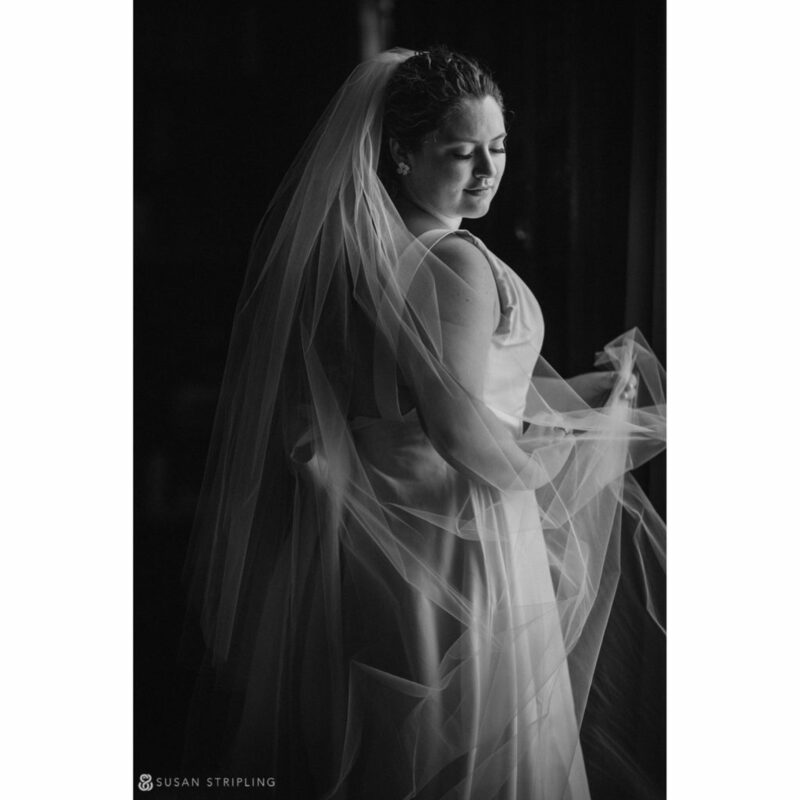 I love the light in this dramatic black and white portrait of the bride preparing for her wedding ceremony. 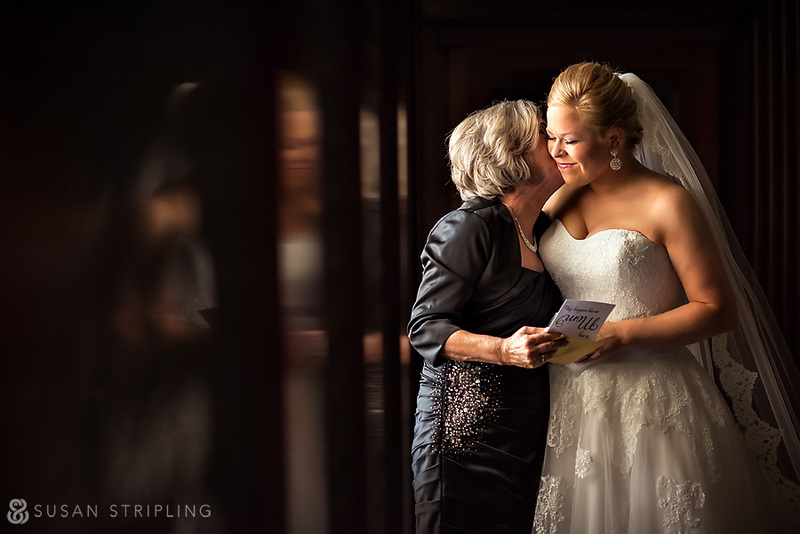 The mother of the bride was on hand to help her daughter get ready and attend to each detail. 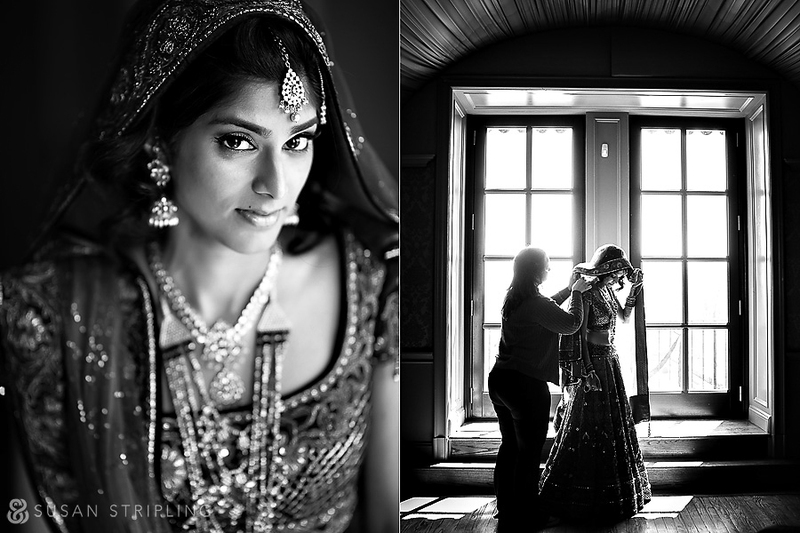 We had time for a few additional portraits in the Oheka bridal suite before heading outside to begin the baraat! 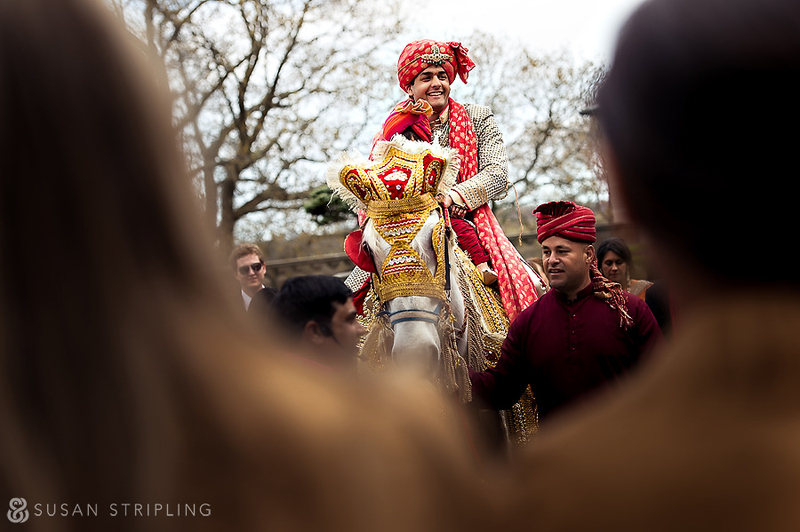 The preparations for the baraat were nothing short of glorious. Lindsay Landman did a fantastic job with the floral design. 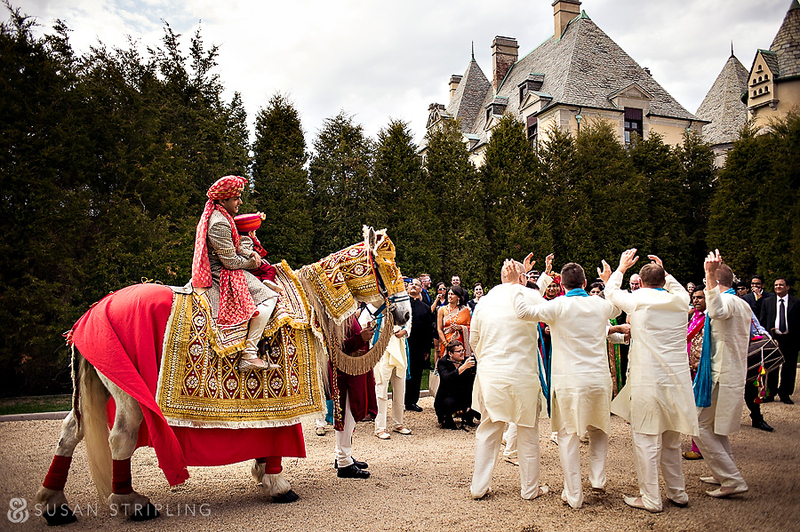 Ponies Will Travel provided the horse for the baraat….and what a horse! 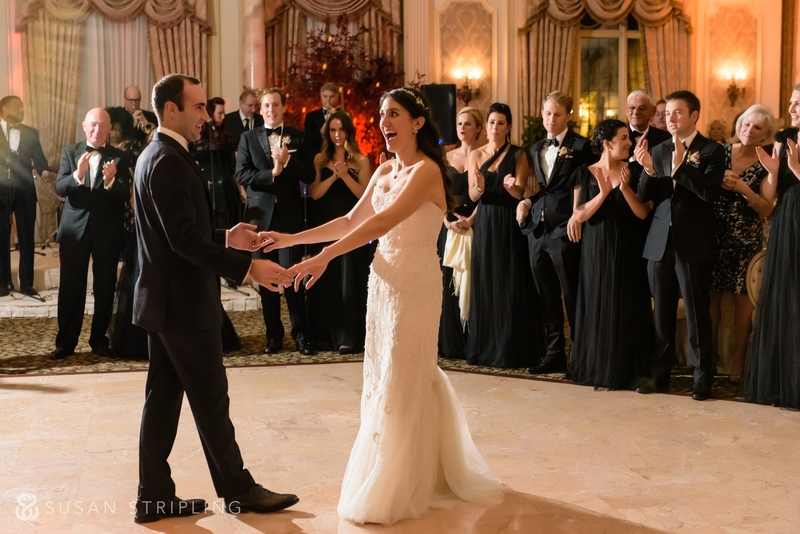 The singing and chanting that led the groom towards the bride was so loud it could be heard down the entire Oheka Castle driveway! 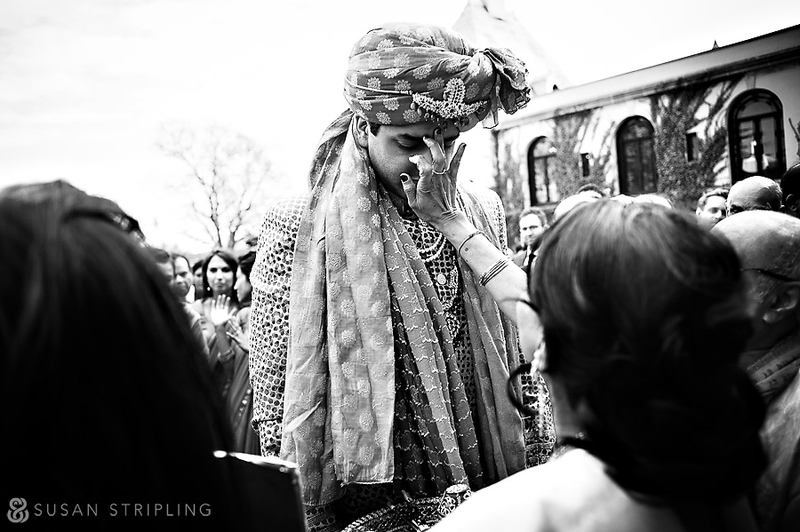 Since the baraat begins the ceremony, emotions were running high for everyone involved. 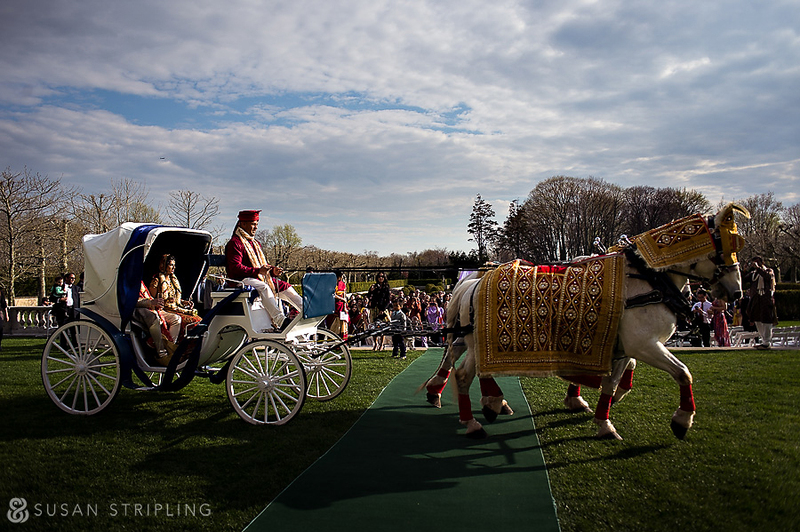 The groom processed on the horse up the Oheka driveway, his young nephew riding in the saddle with him. 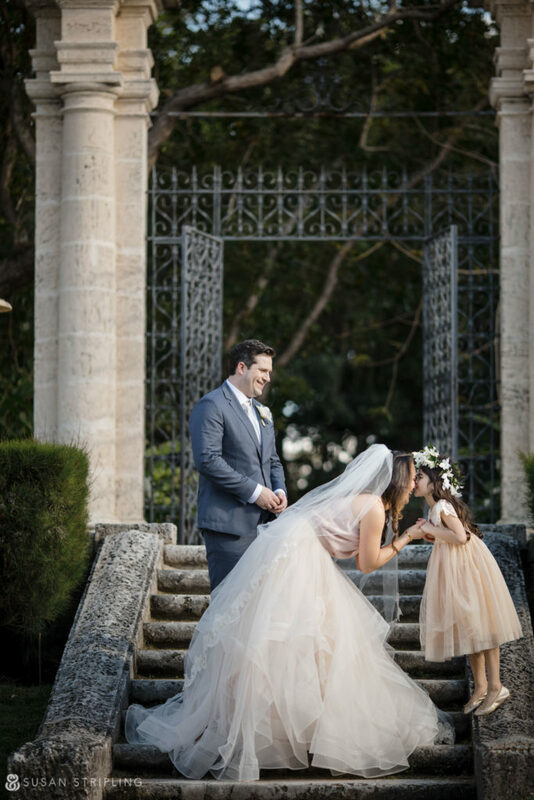 The groom was greeted warmly by the bride’s family just outside the front doors of the castle. 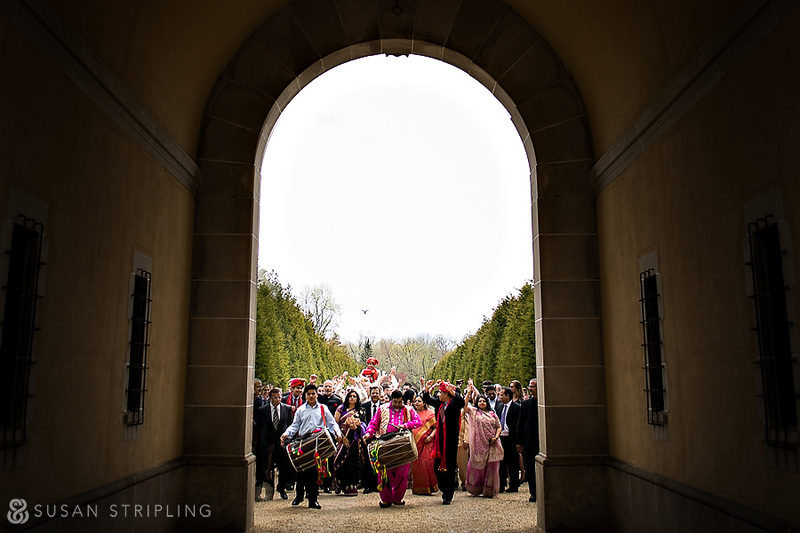 The baraat procession ended at the entryway to Oheka, proceeded through the front doors, and through the castle to the ceremony location. 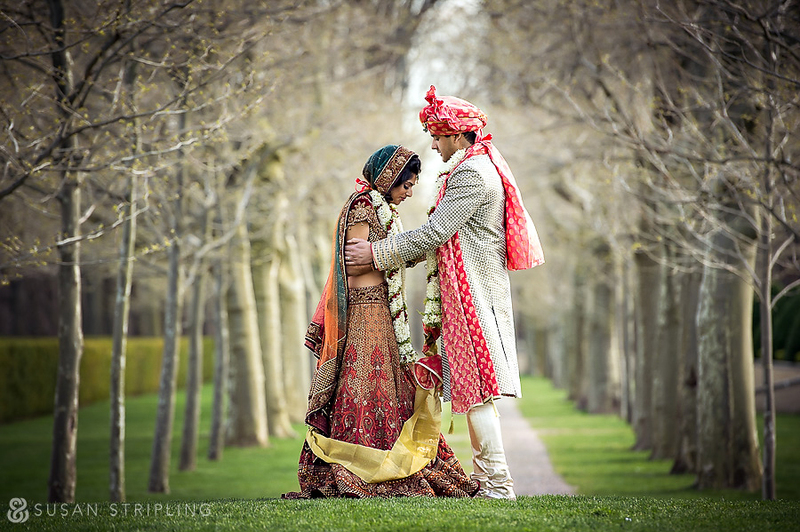 Aarti and Sarin, thank you so much for trusting me with your day and your memories. Lindsay Landman, thank you for taking the day into your flawless control and making every single moment nothing but effortlessly smooth sailing. Alex Villegas, thank you and your team at Unique Visions for again illustrating what a wonderful team photographers and cinematographers can make when you share the same shooting methodology!